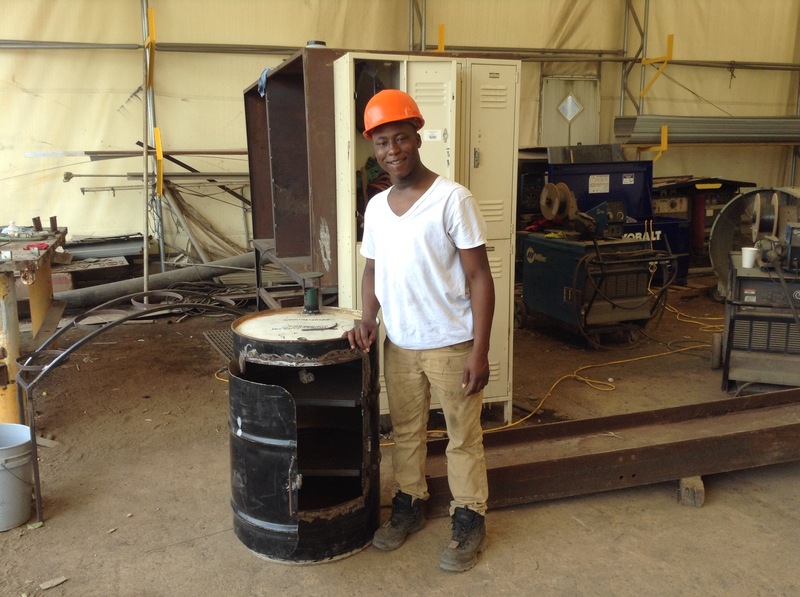 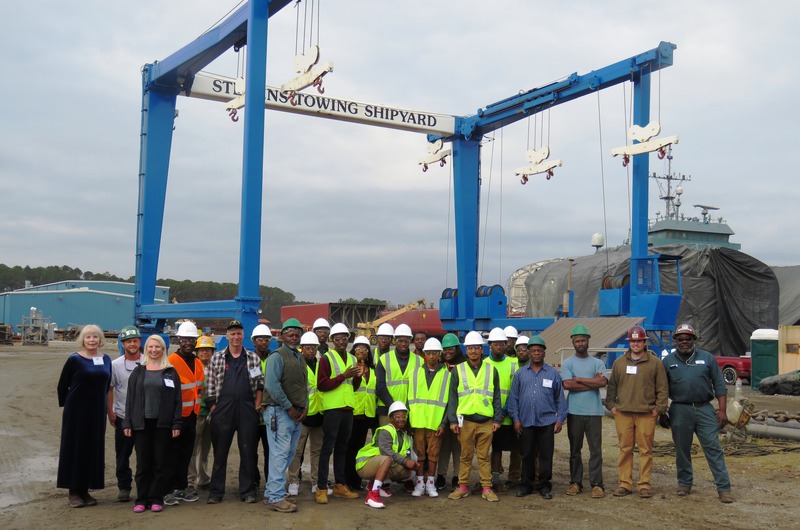 Students from Baptist Hill Middle High School in Hollywood recently completed their welding internships at Stevens Towing shipyard. 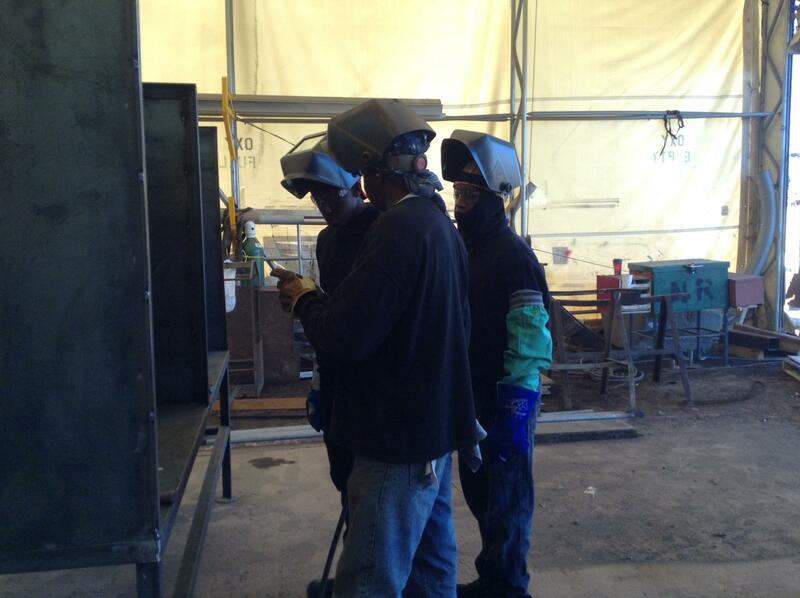 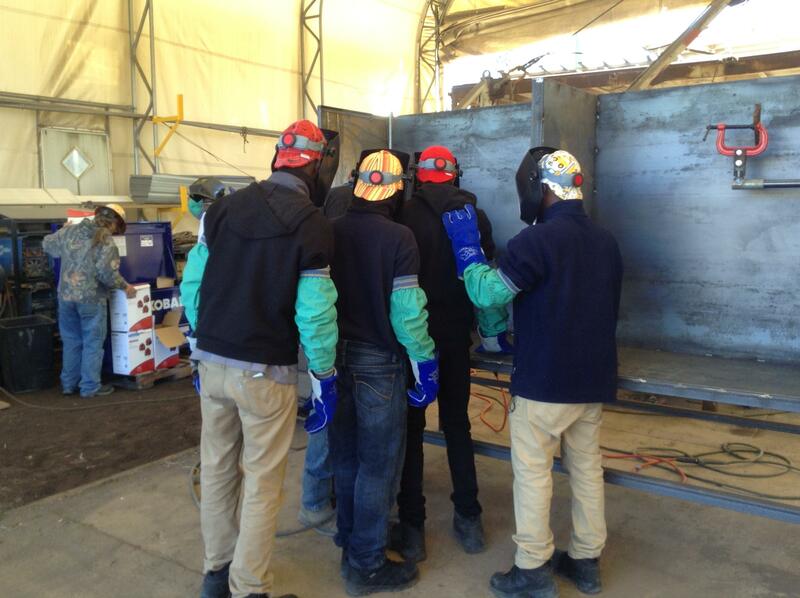 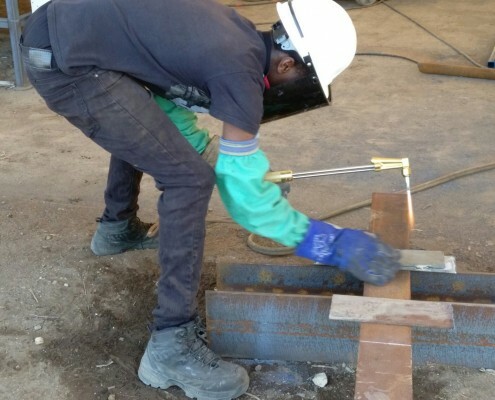 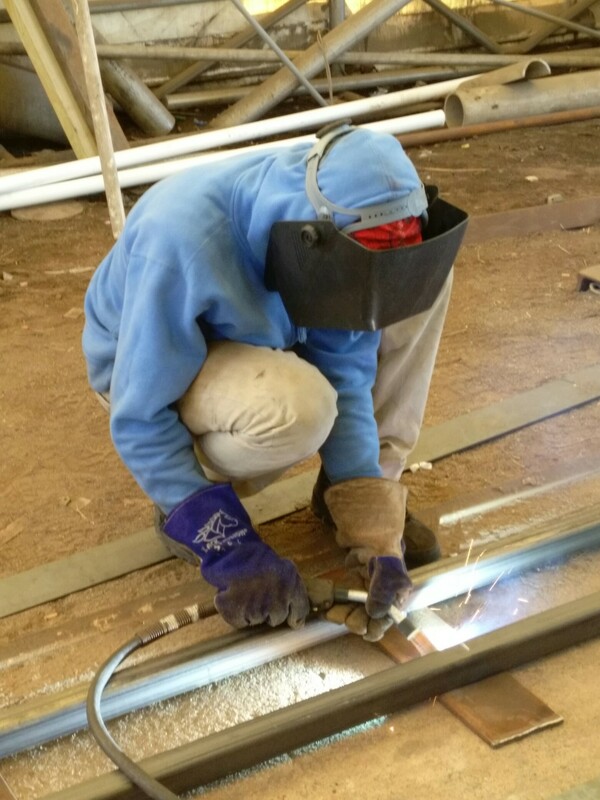 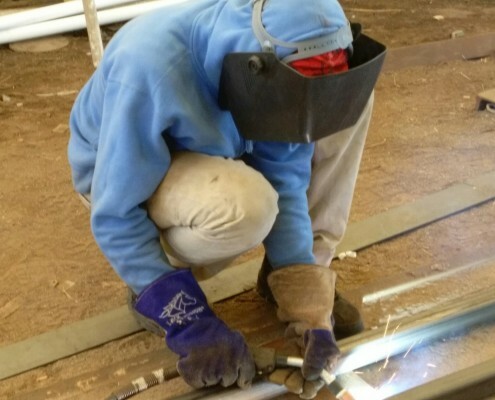 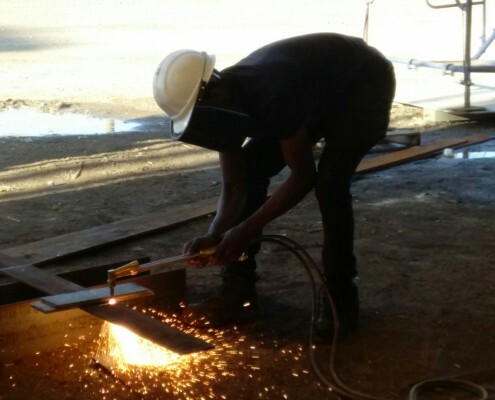 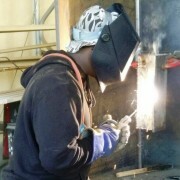 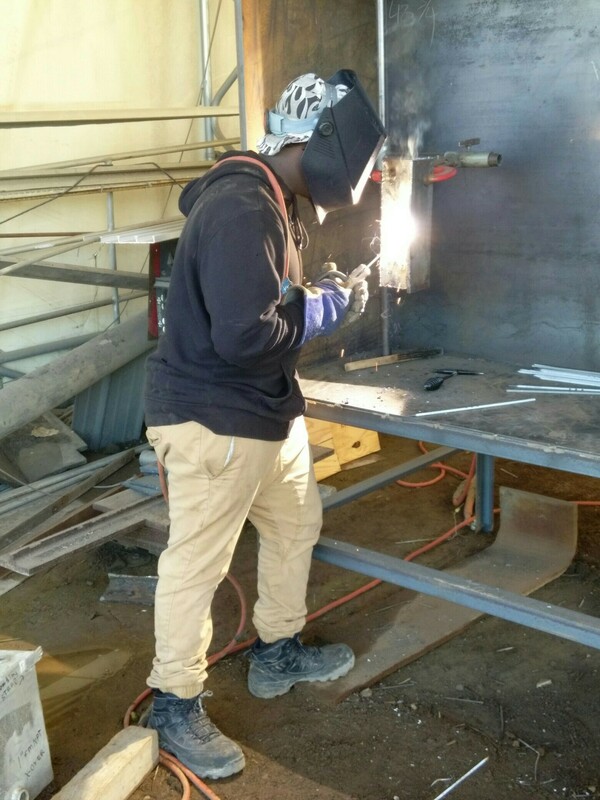 The interns studied pertinent vocabulary, math and measurement, safety compliance, and proper use of hand and power tools in addition to basic techniques in SMAW “Stick” and GMAW “MIG” welding. 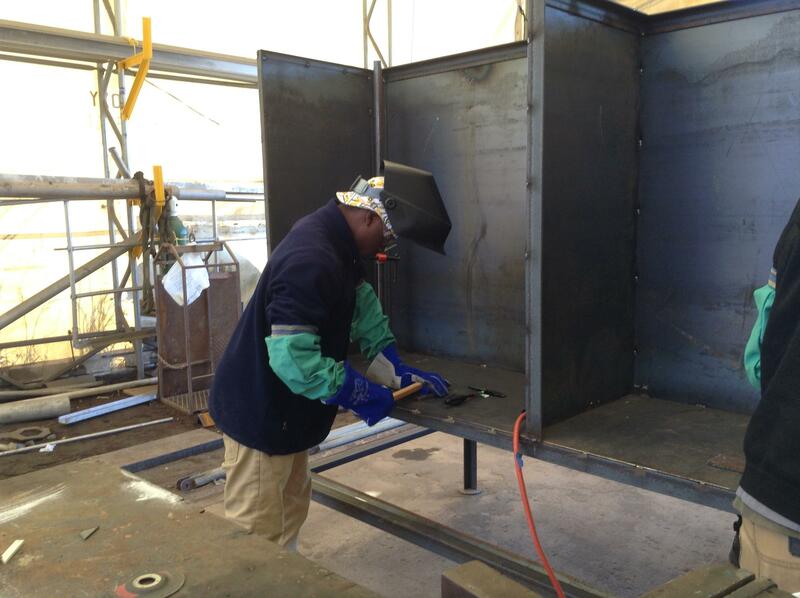 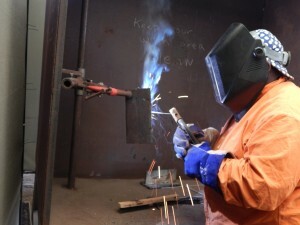 Structured with a duality of classroom instruction and hands-on practice in the shipyard, the curriculum is based on the SC Standards for Welding Technology I and II. 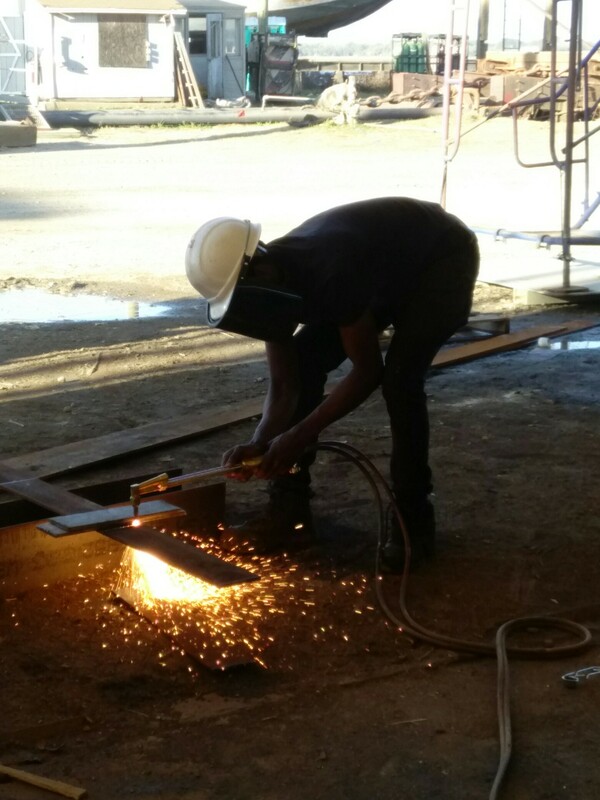 William Holmes, a graduate of Baptist Hill High School and retired supervisor at Stevens Towing instructs the interns in welding, using a grinder, and oxy-fuel cutting. 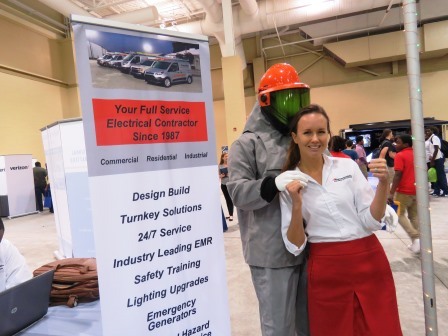 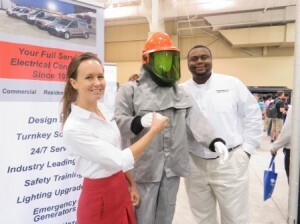 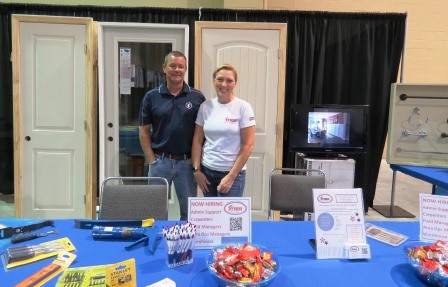 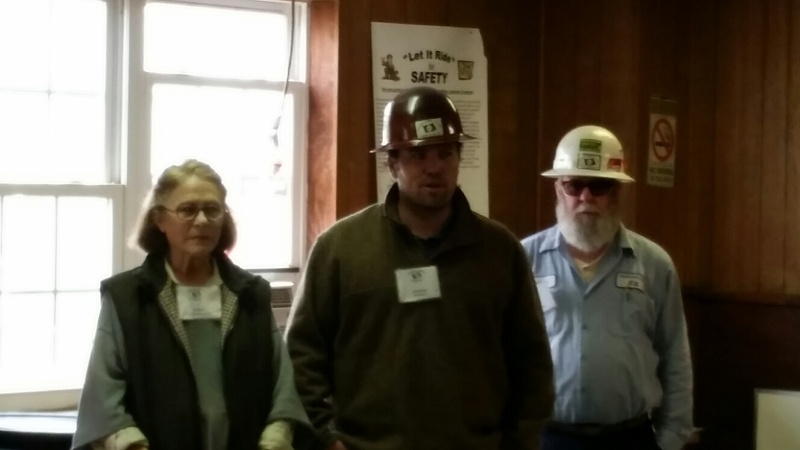 Additionally, guest speakers cover topics such as OSHA safety standards, fire fighting, 401Ks, and artistic welding. 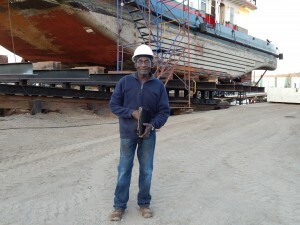 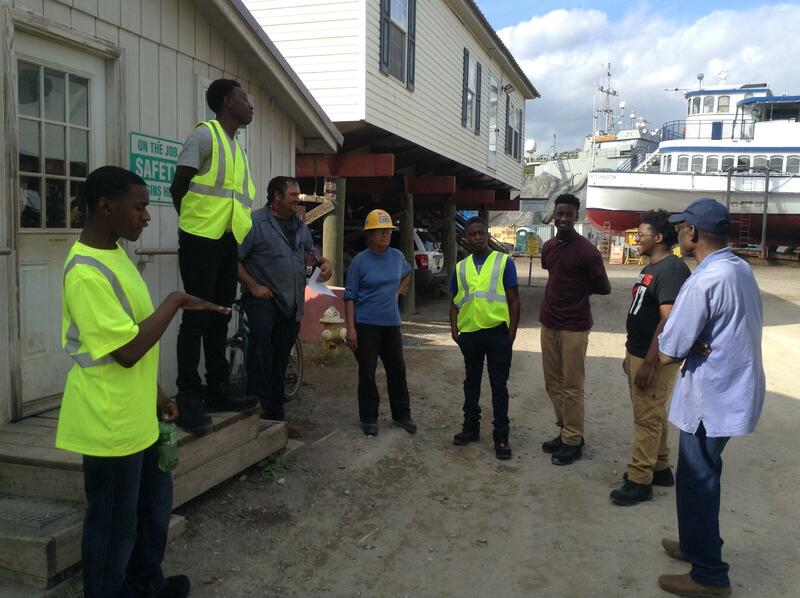 Opportunities for learning are everywhere in the shipyard. 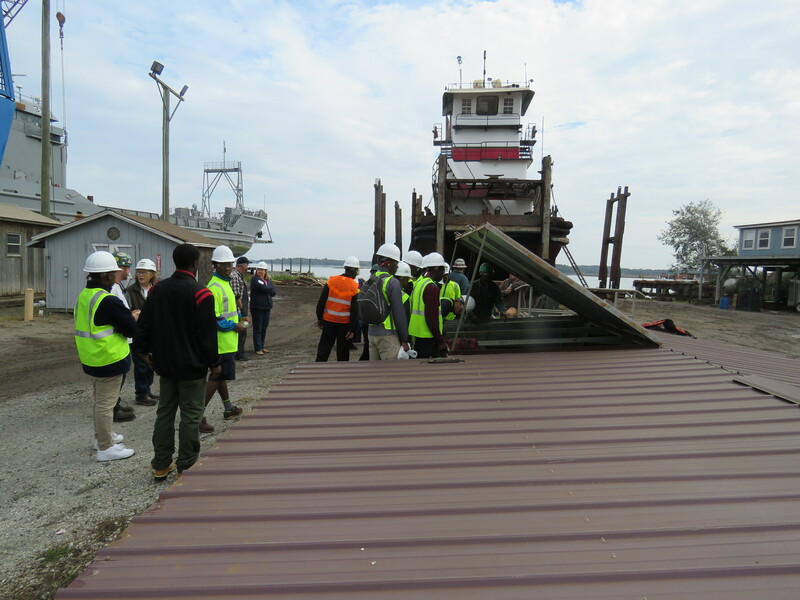 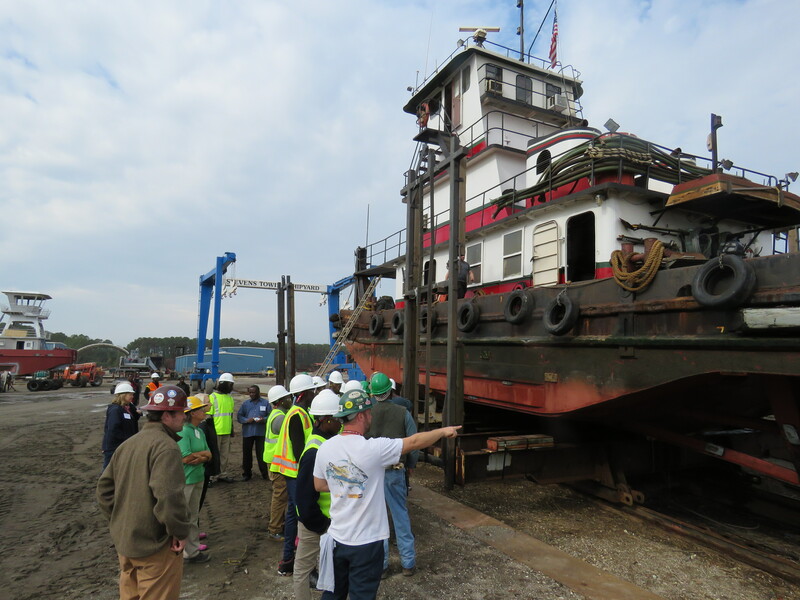 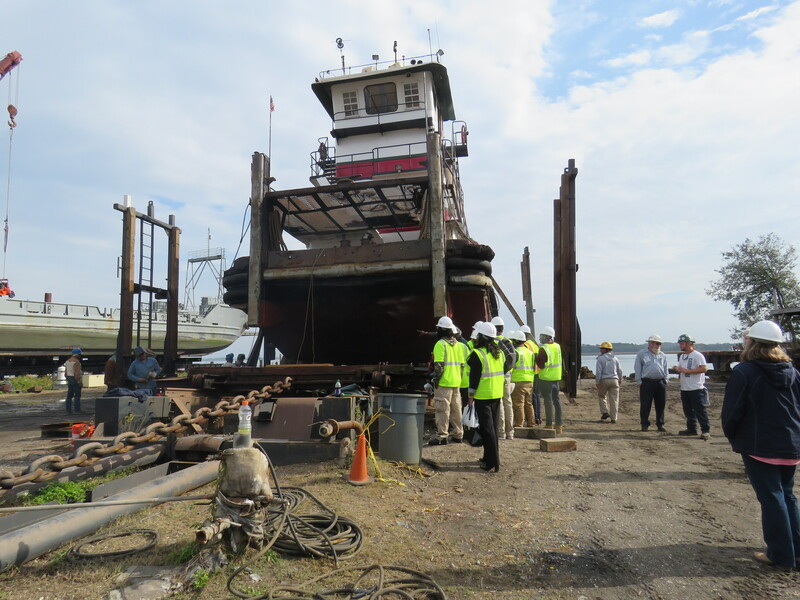 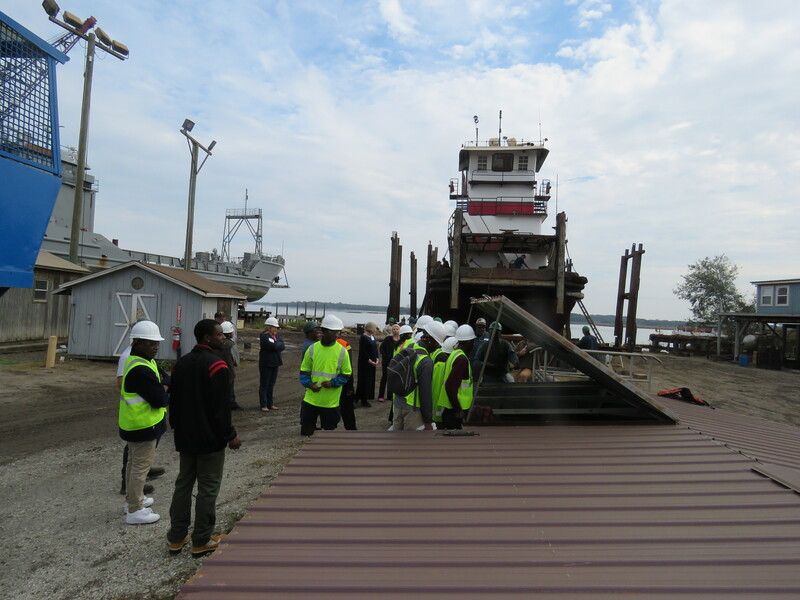 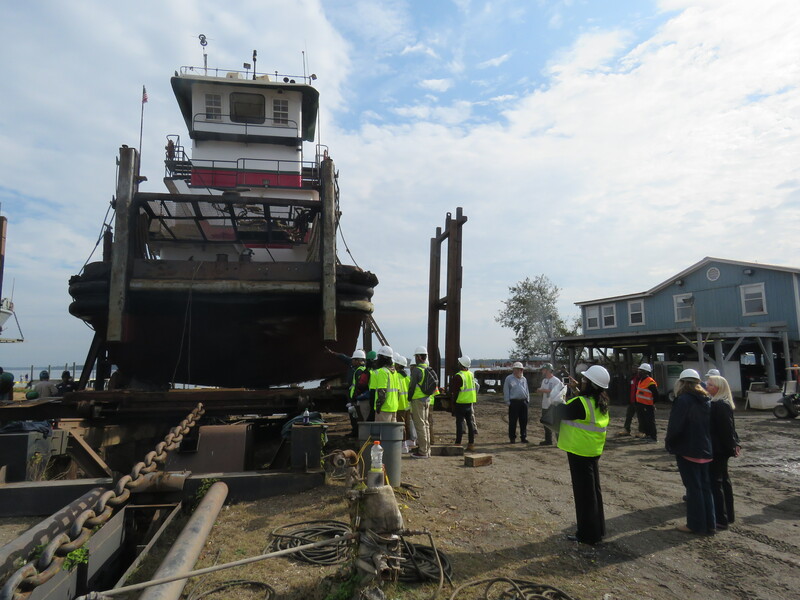 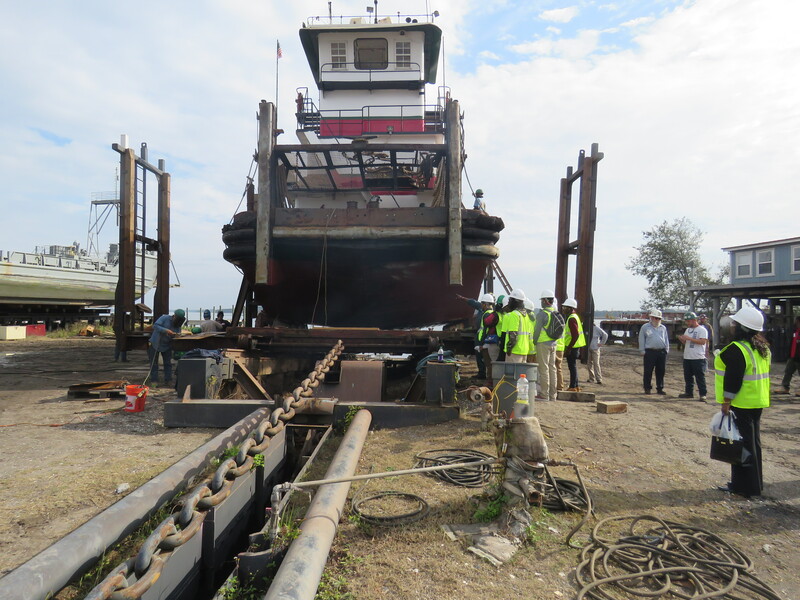 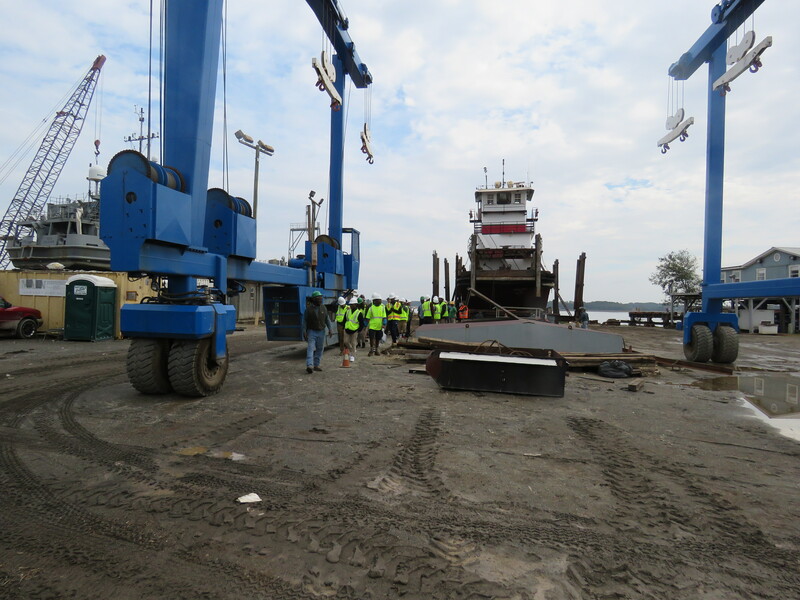 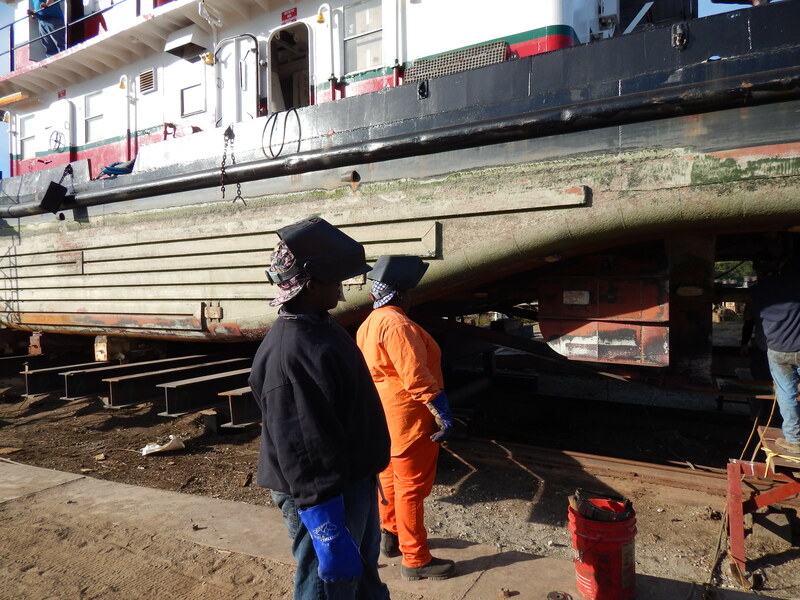 Interns observe a myriad of activity such as a barge being blasted and repaired, a tugboat being drydocked, or a hatch cover being fabricated. 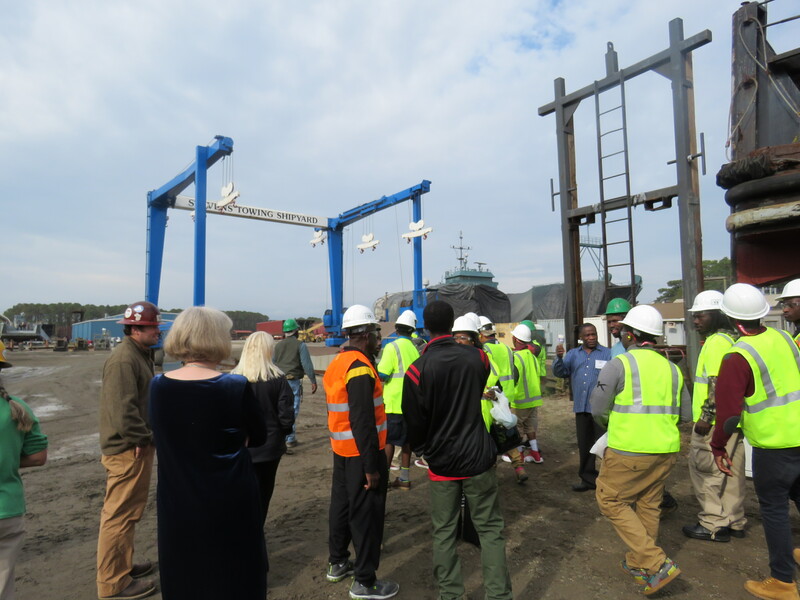 The outdoor classroom is located in the center of the shipyard surrounded by all of the activity. 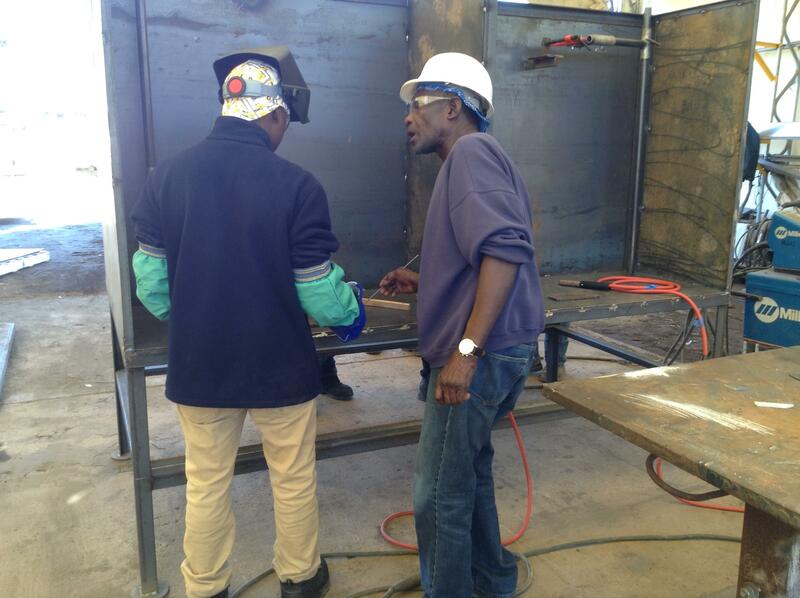 It is an exciting place to learn and ameliorate their job skills. 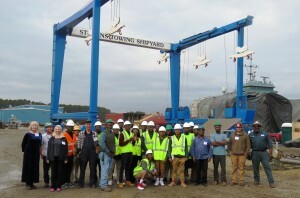 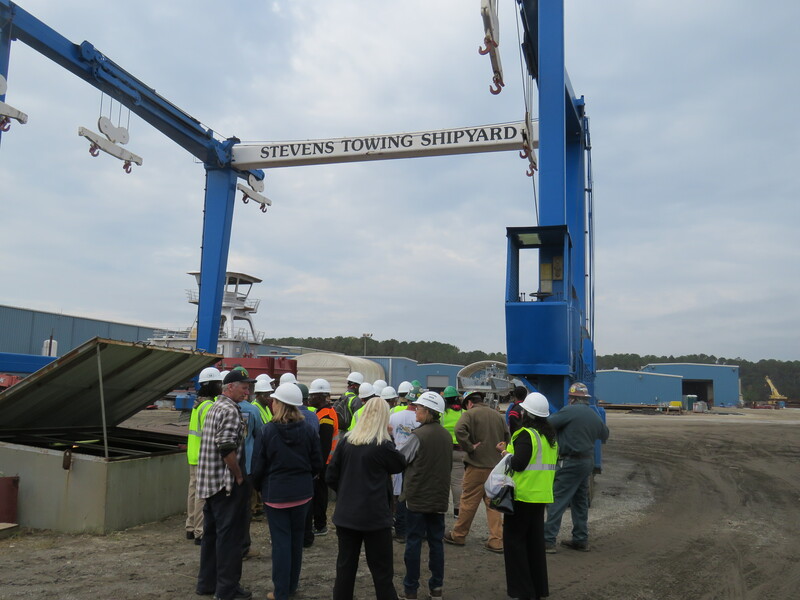 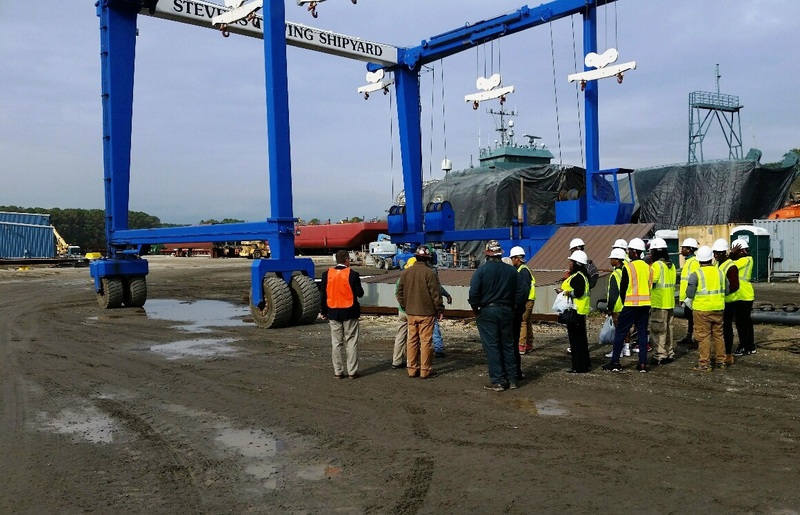 Very special thanks to Stevens Towing Shipyard for hosting another cohort of students for this amazing work-based learning opportunity this school year! 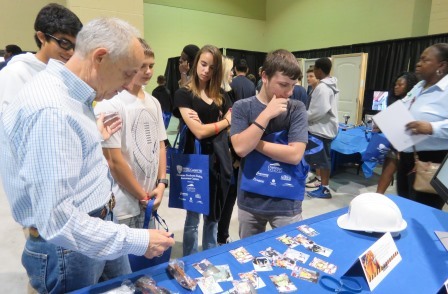 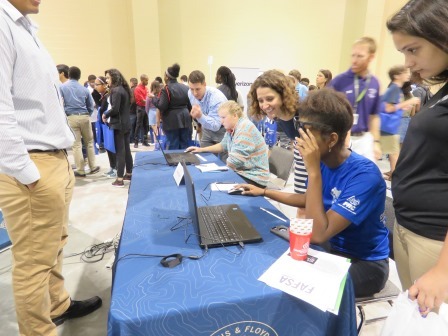 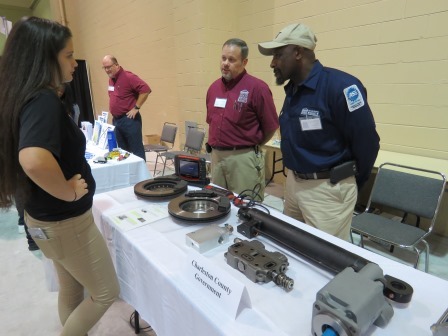 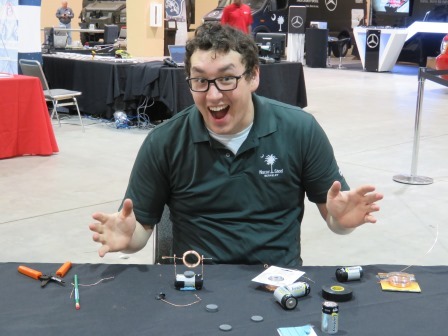 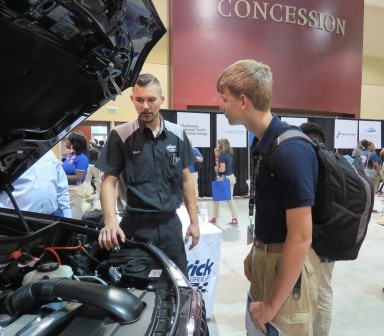 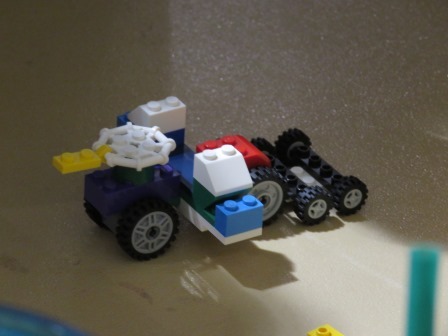 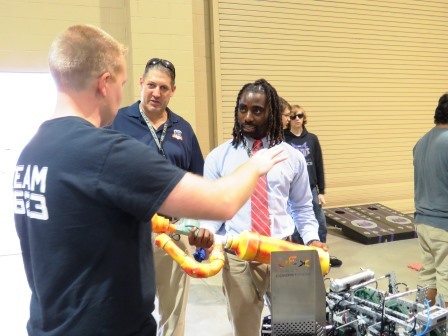 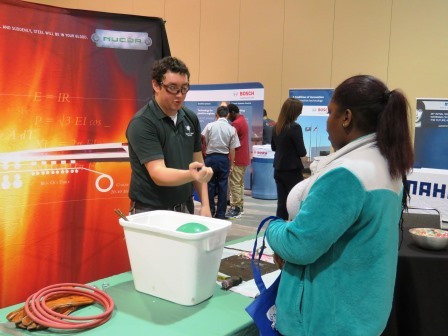 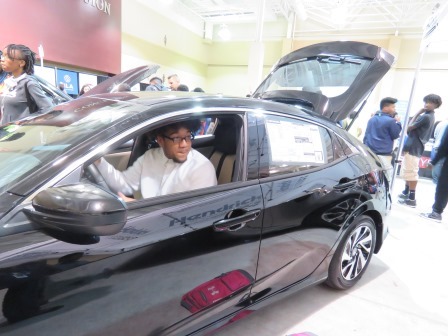 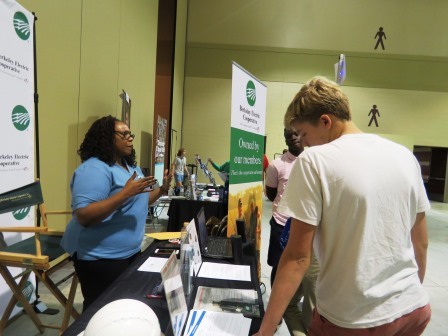 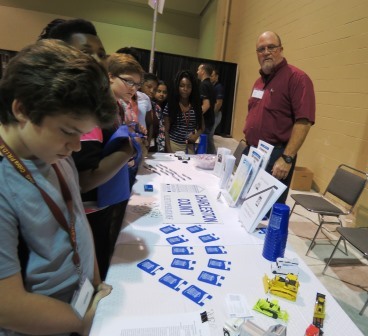 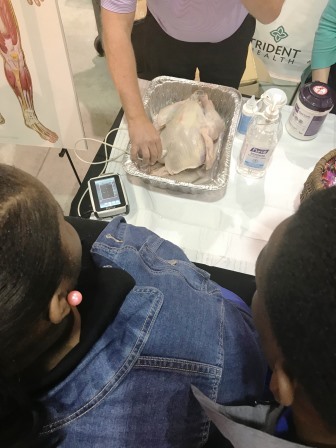 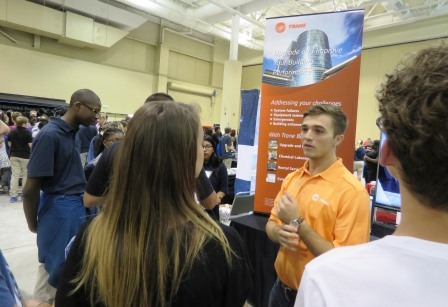 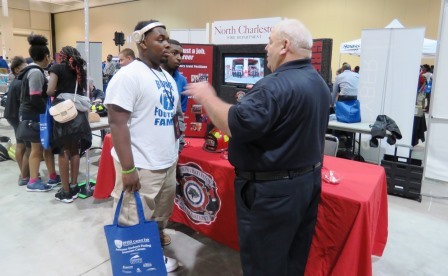 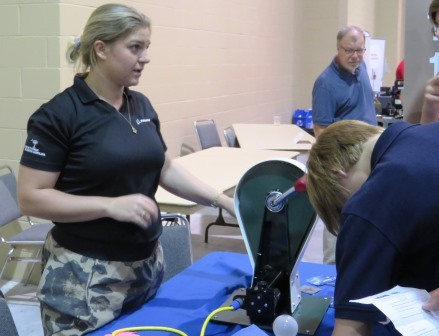 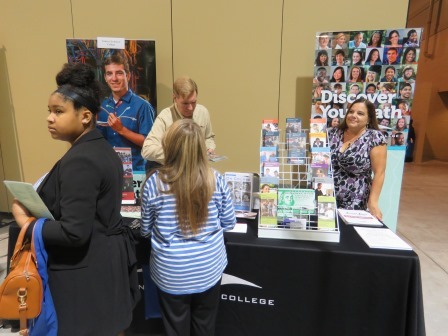 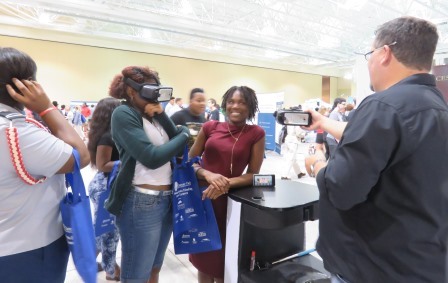 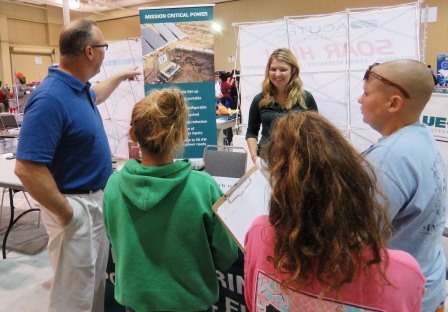 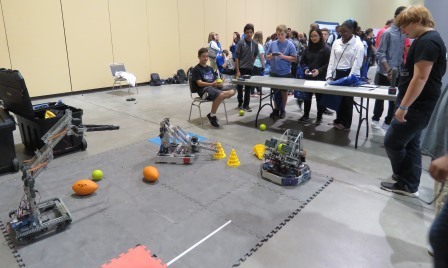 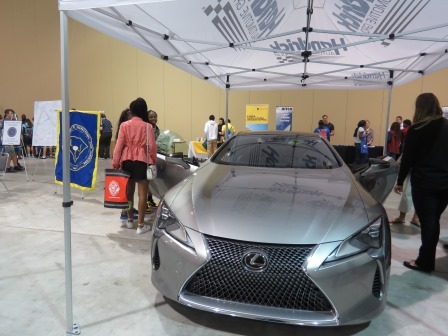 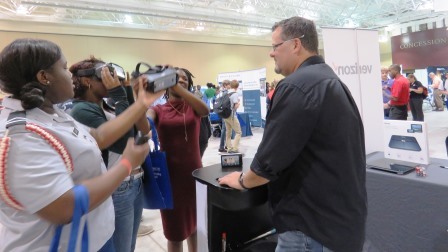 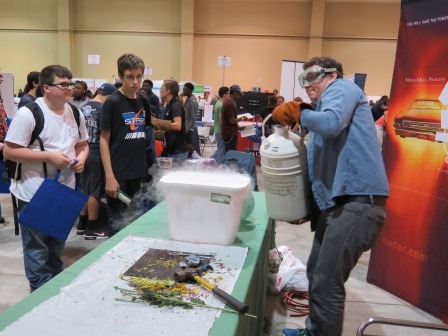 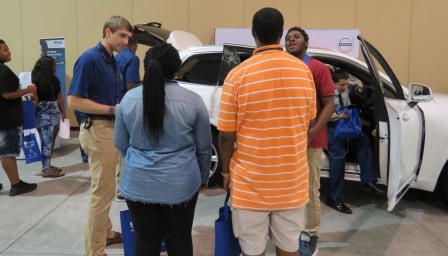 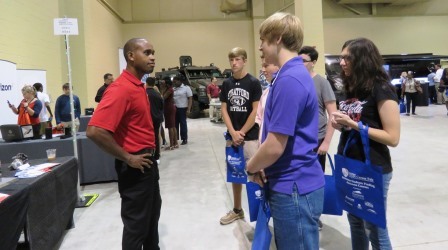 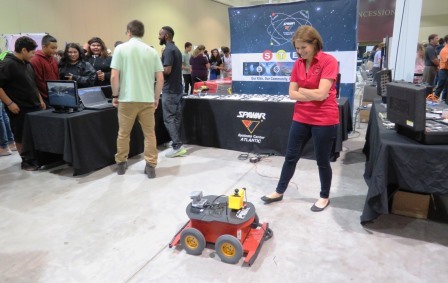 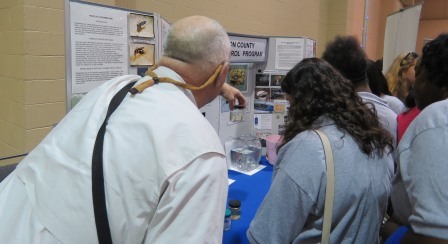 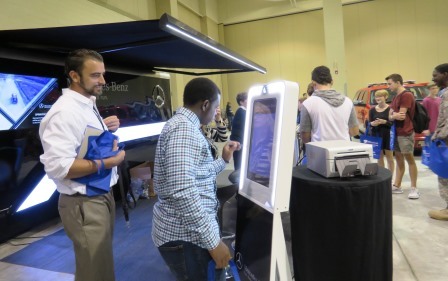 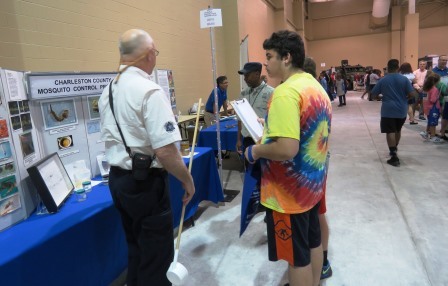 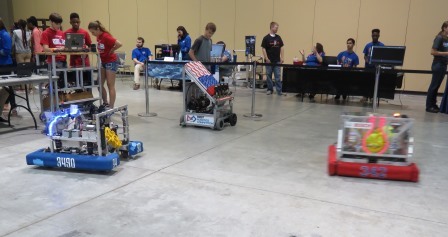 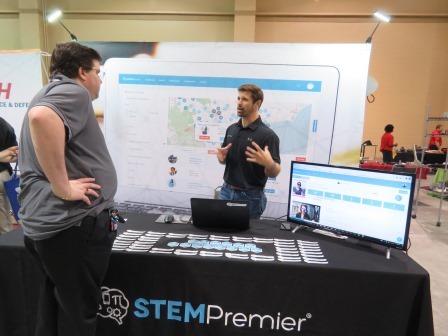 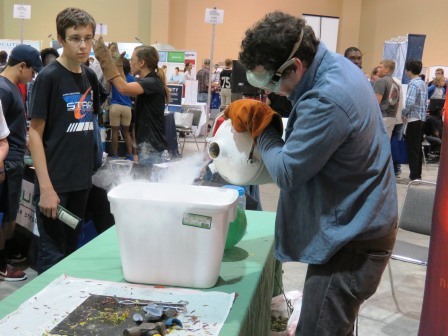 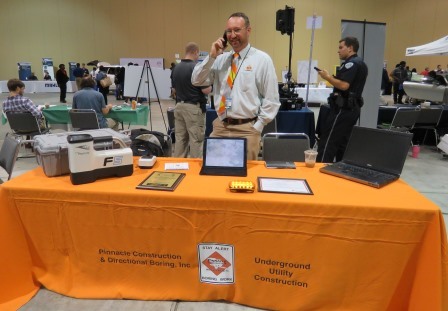 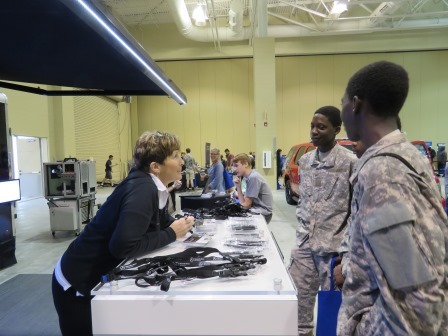 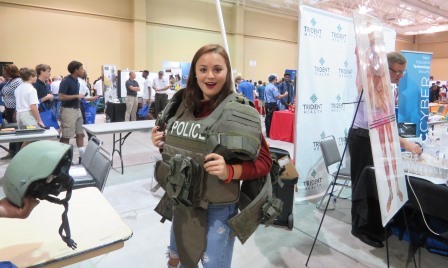 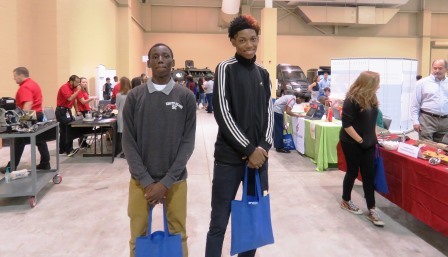 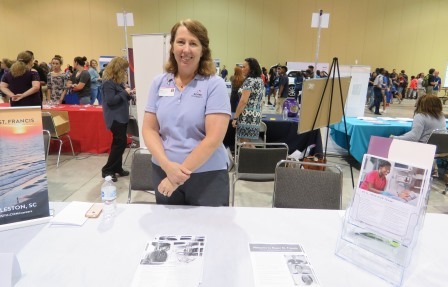 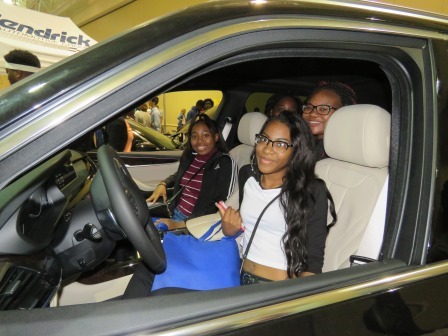 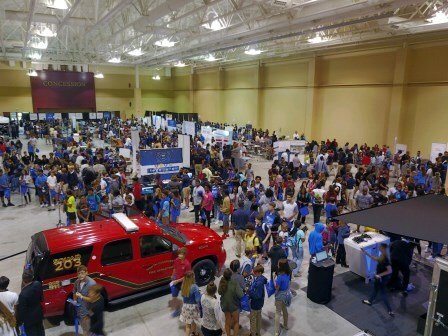 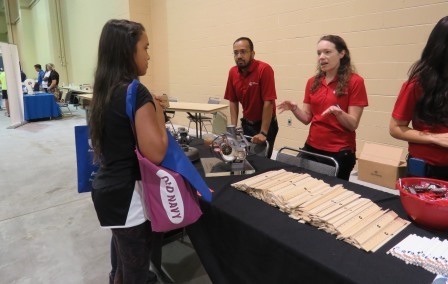 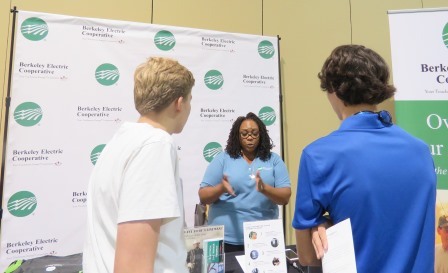 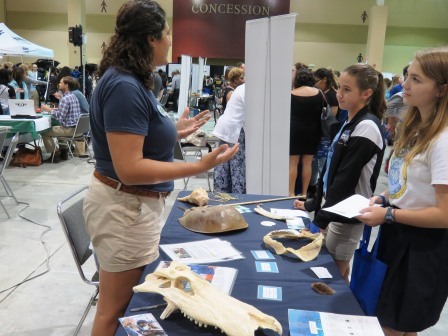 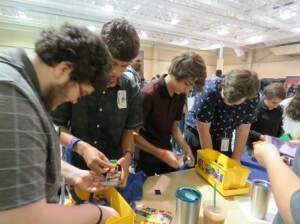 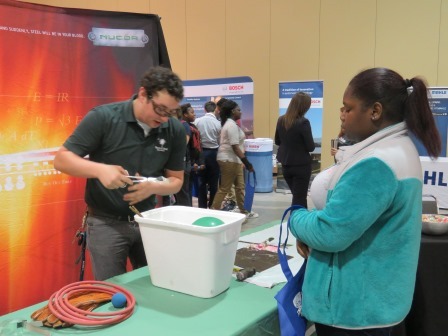 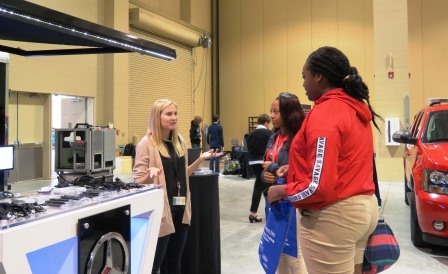 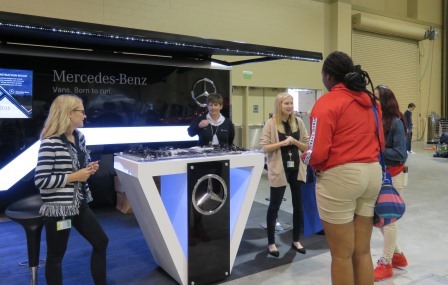 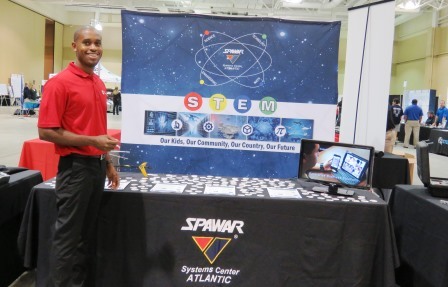 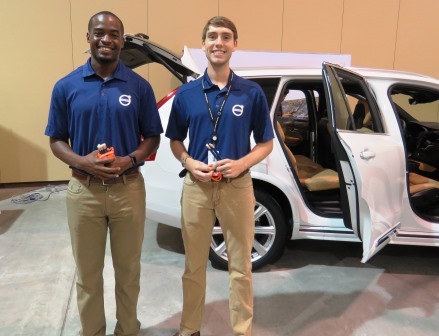 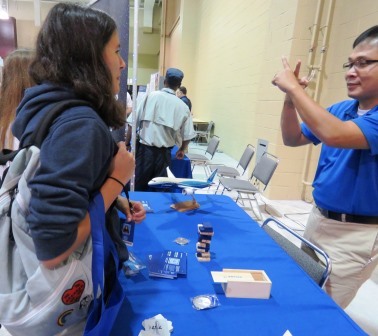 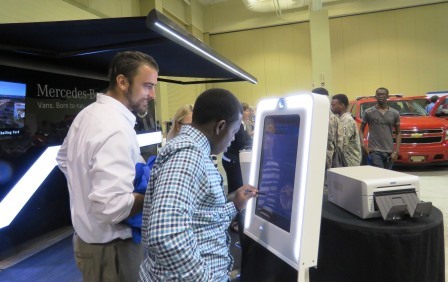 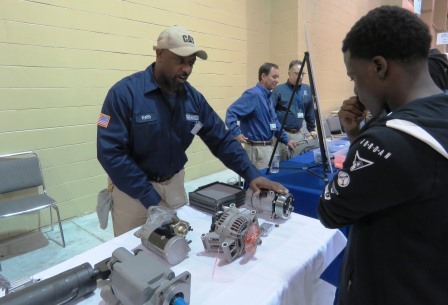 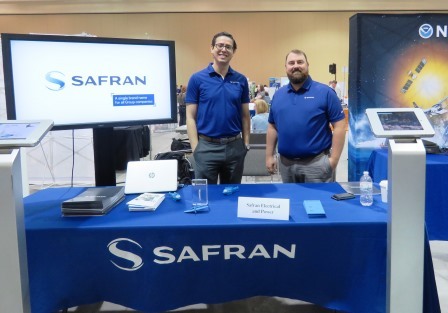 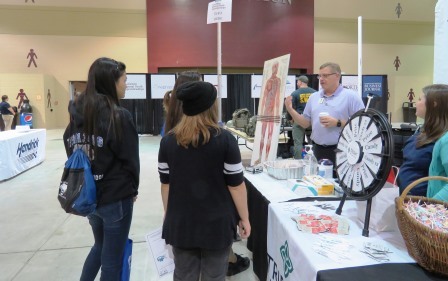 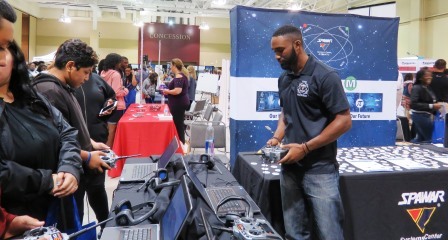 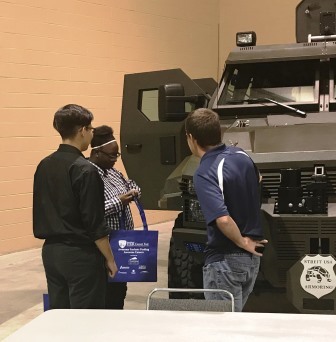 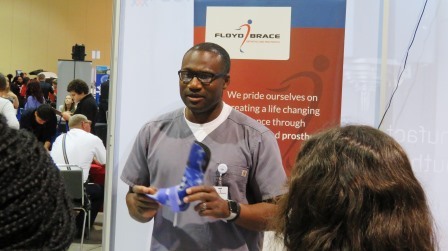 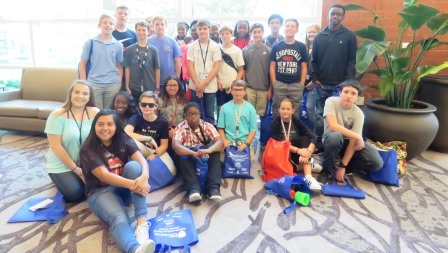 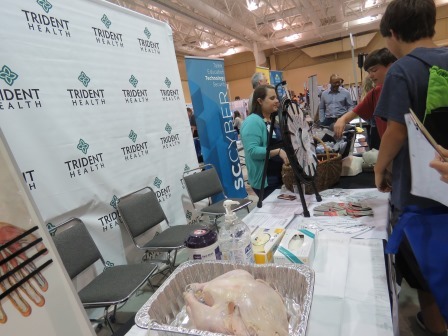 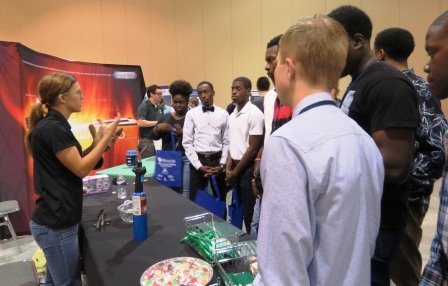 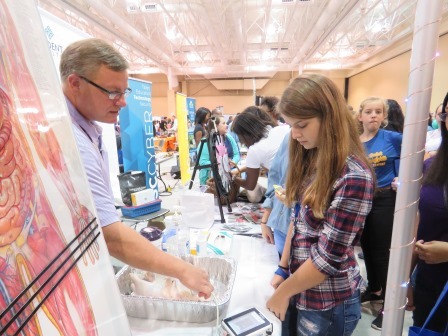 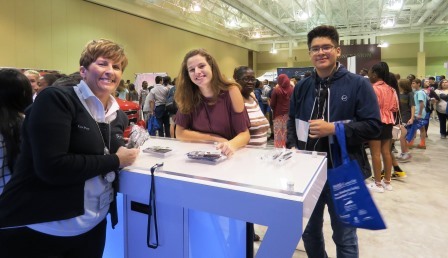 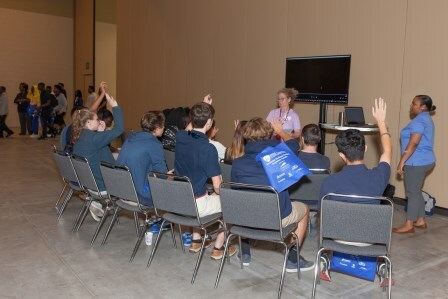 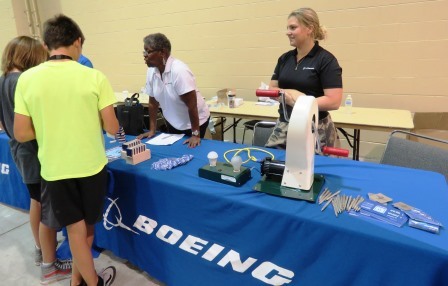 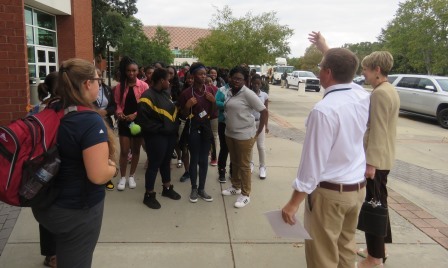 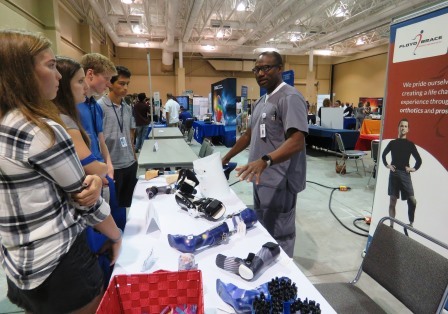 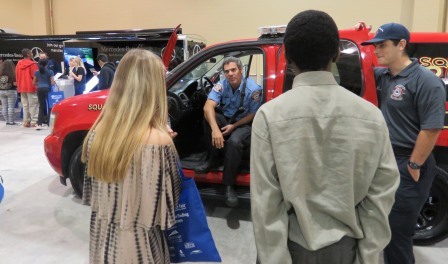 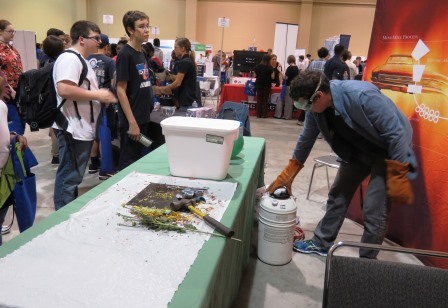 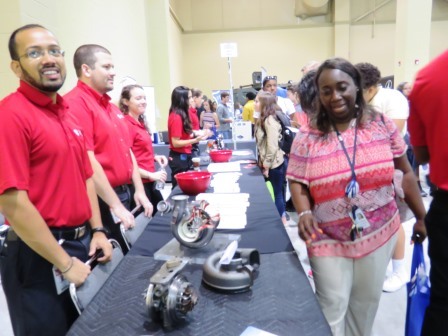 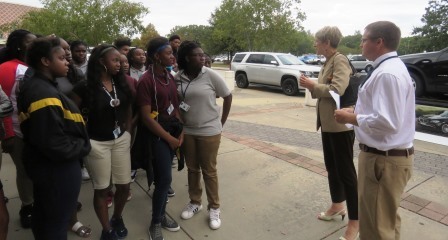 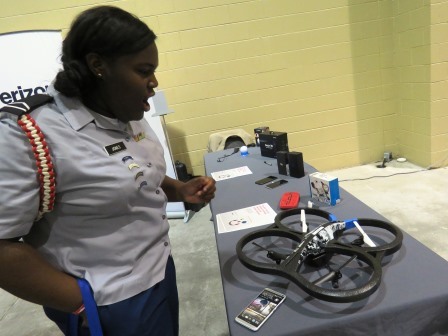 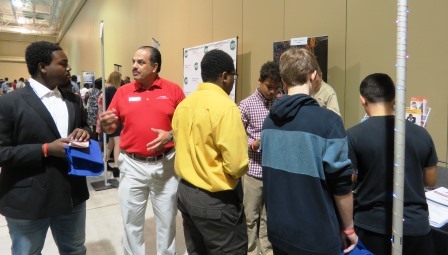 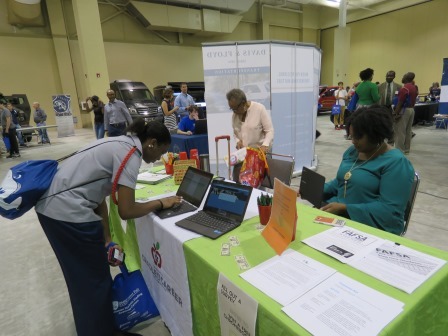 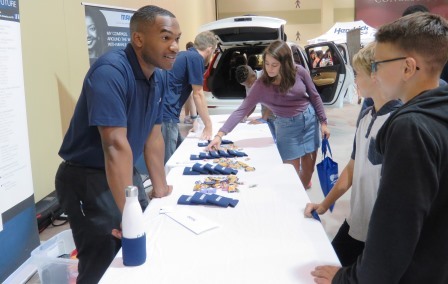 Over 2000 students arrived on buses from throughout the Charleston region, one after another – these students were chosen by their school to attend the 3rd annual STEM Career Fair at the North Charleston Convention Center October 12. 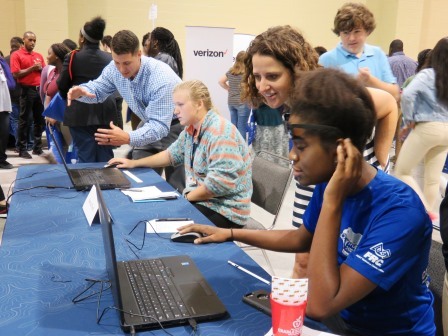 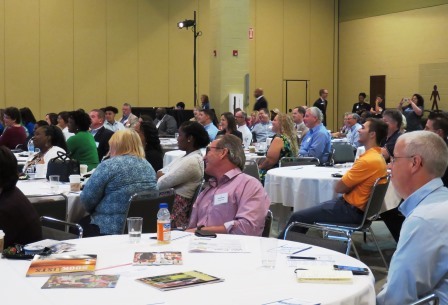 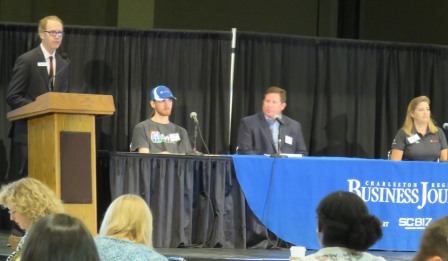 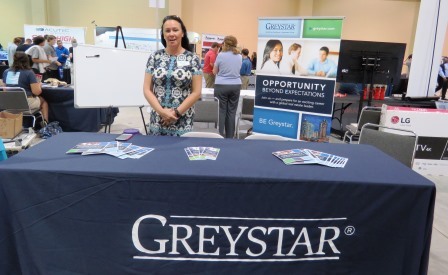 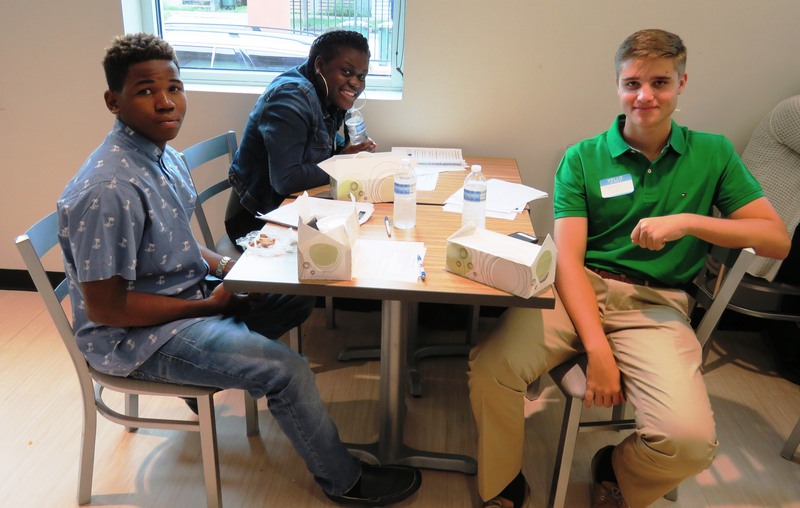 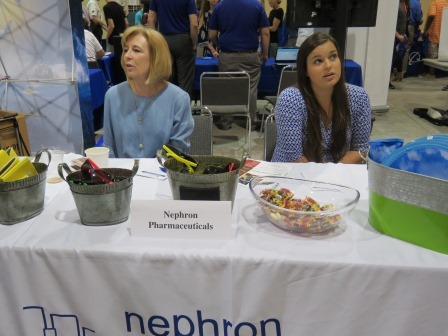 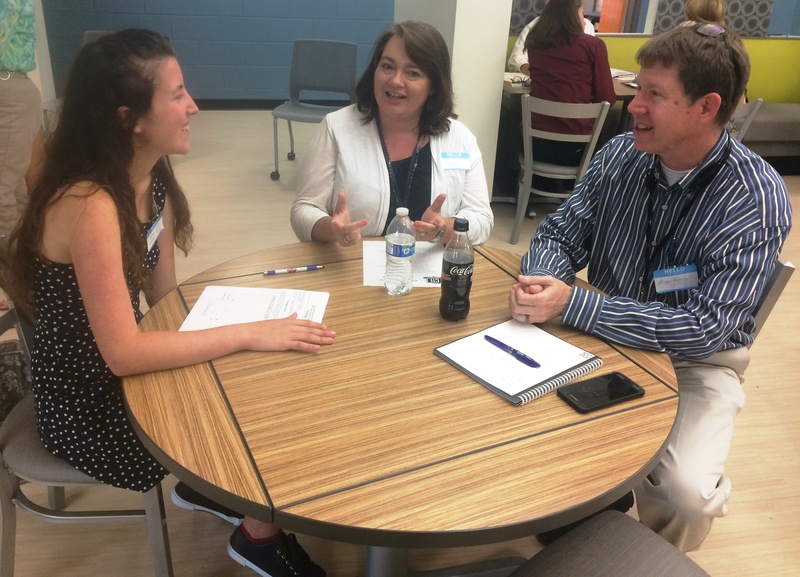 Students got to speak directly with professionals from companies keen on doing their part to develop the next generation of high skilled talent for the growing economy in the Charleston region. 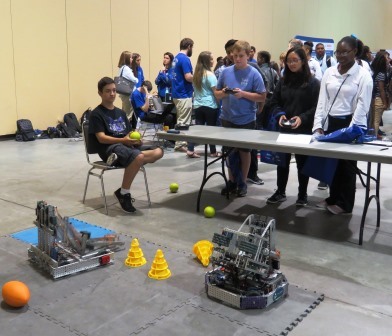 Thank you to West Ashley Robotics for providing the wonderful video above! 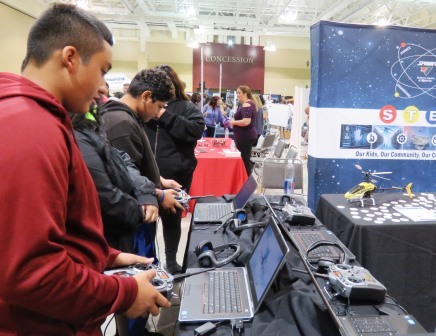 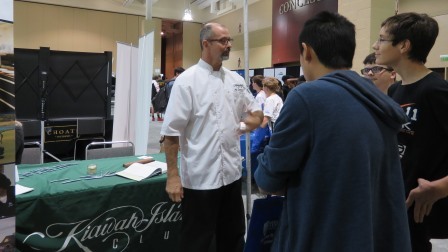 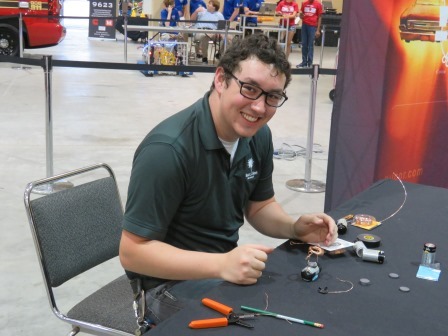 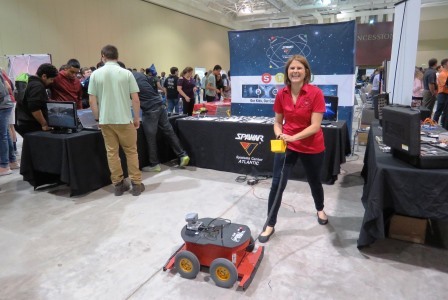 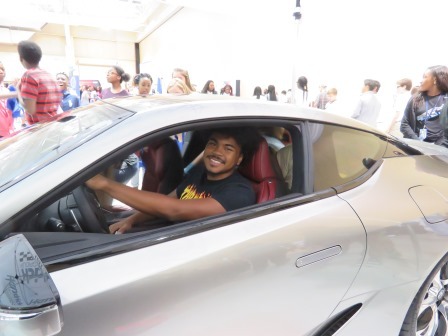 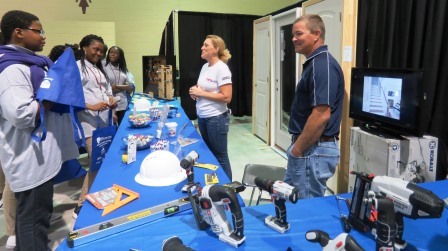 Hands on activities sparked conversations, and many students began professional relationships that could lead to a paid youth apprenticeship while still in high school! 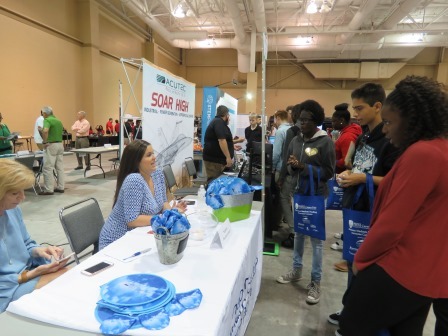 Check out the list of participating businesses and schools below, along with a ton of pictures from the event. 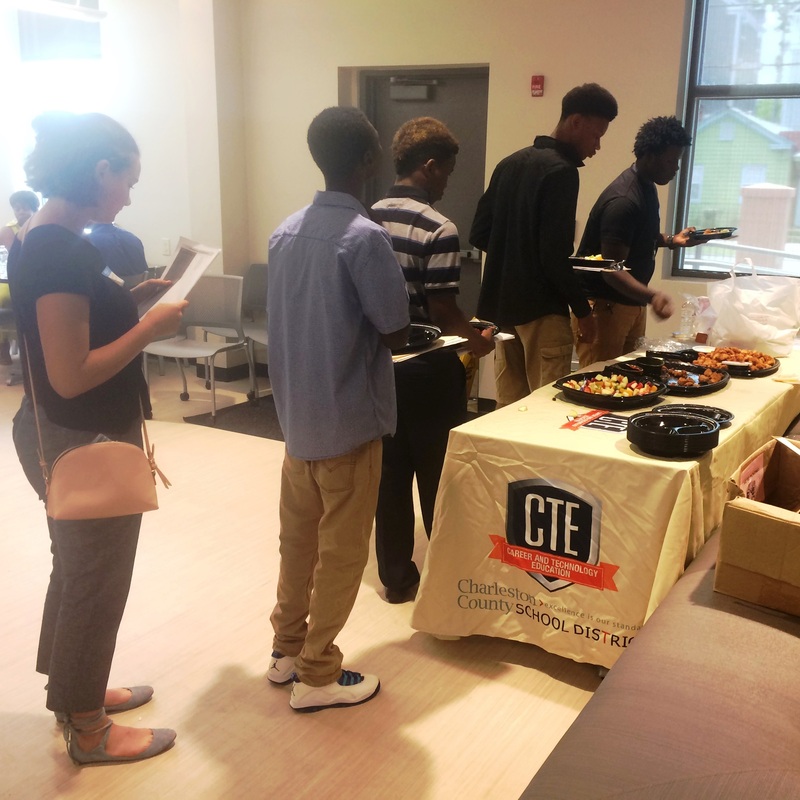 But before the students began arriving, the day started with a special breakfast and panel discussion aimed at businesses interested in joining the regions robust Youth Apprenticeship program. 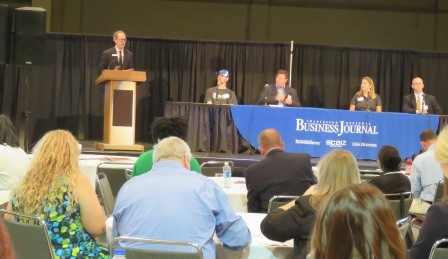 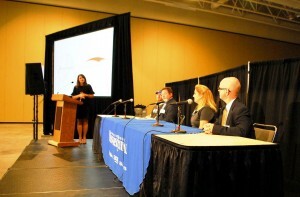 Ms. Carla Whitlock with Apprenticeship Carolina was the moderator and the expert panel made up of David Hall, Operations Manager for Environmental Express, Inc., Mitchell Harp, Dean of Apprenticeships at Trident Technical College, Karen Winningham, Senior Human Resources Specialist with Robert Bosch Charleston, and Curtiss Schall, a current apprentice with Robert Bosch Charleston. 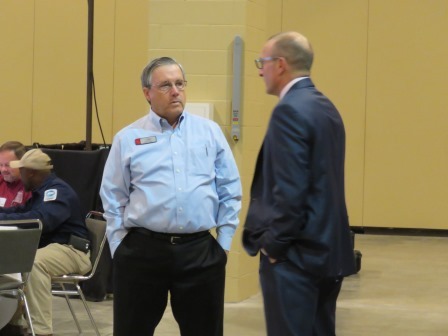 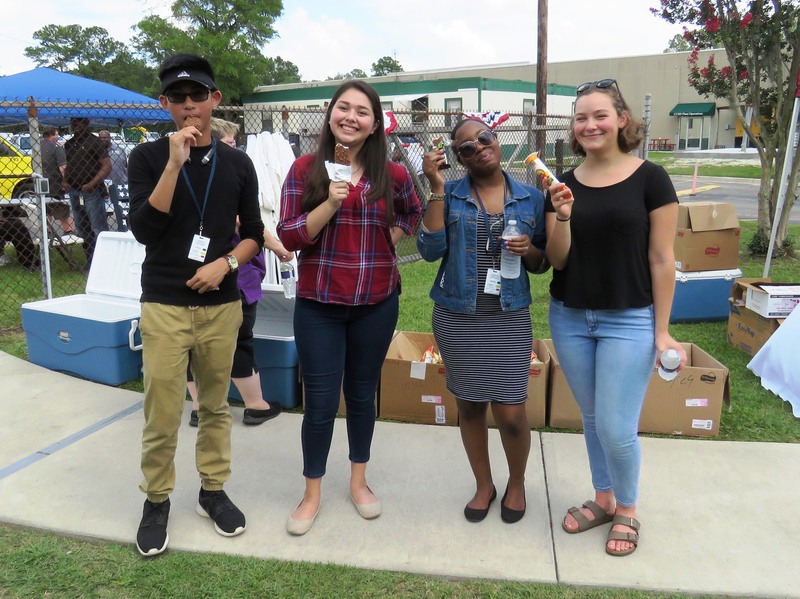 Please enjoy these additional pictures taken during the event – Even more pictures taken by SC Biz staff member available here. 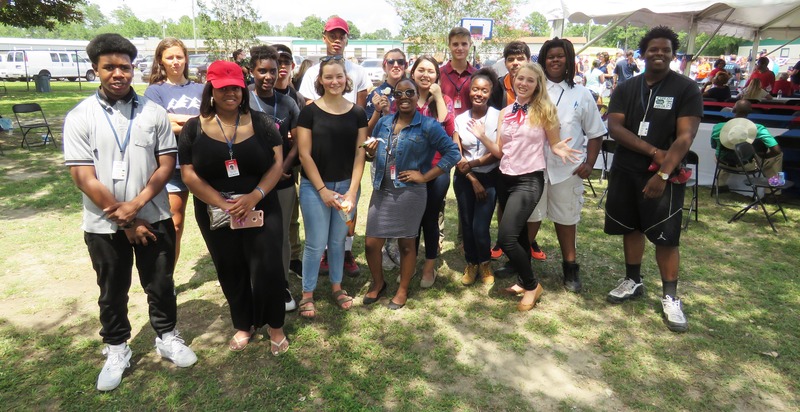 It is the mid-point for 28 students working with Charleston County School District departments this summer. 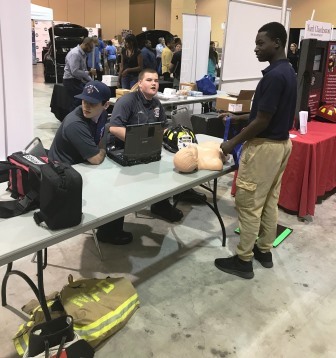 They’ve all settled in to their roles working alongside district professionals in positions aligned with their future career interests. 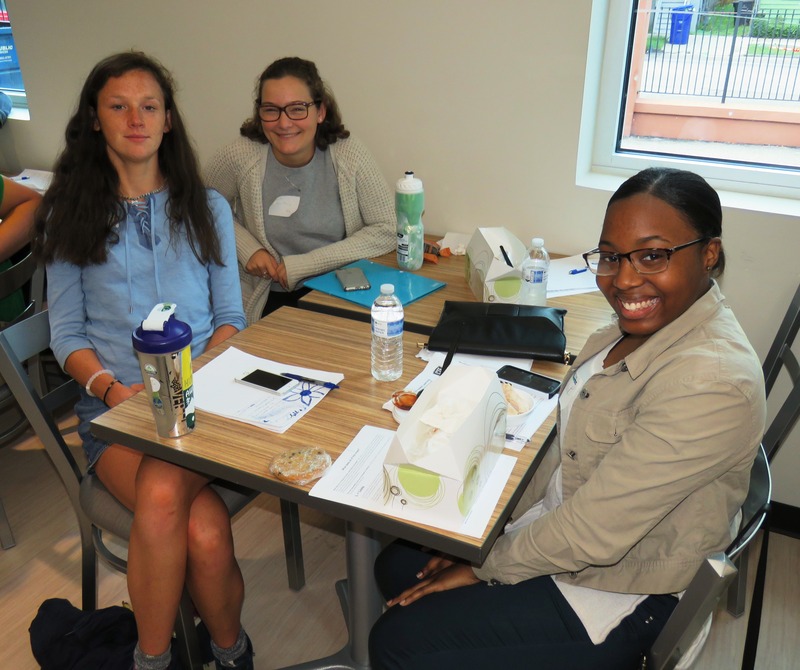 To earn the available work-based learning course credit, each student intern must work a minimum of 120 hours, turn in a supervisor review at the mid-point and end of the summer, and submit weekly journals about their experiences. 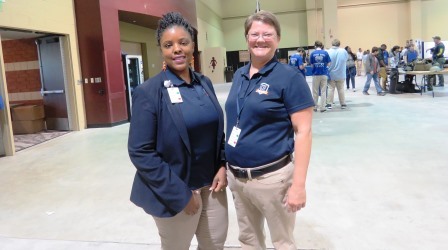 I started my internship with the CCSD Office of Strategy and Communications this Tuesday, June 20 at 8 a.m. My supervisor, Ms. Lauren Gandy, whom I met at our Orientation, was out of the office this week. 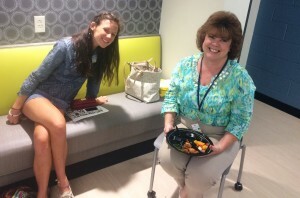 Because Ms. Gandy was the only person I knew in the office before my first day, it caught me off guard a little bit to have no familiar faces in the office. 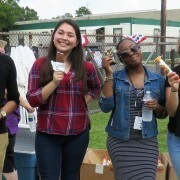 However, everyone was warm. 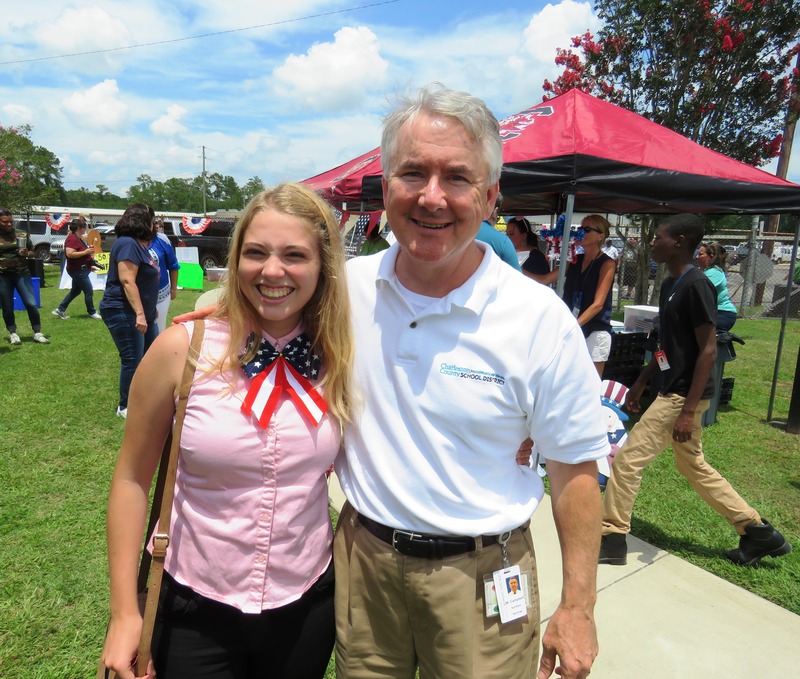 Mr. Andy Pruitt met me in the front and gave me a great introduction to the office, reminding me that internships are what you make of them. 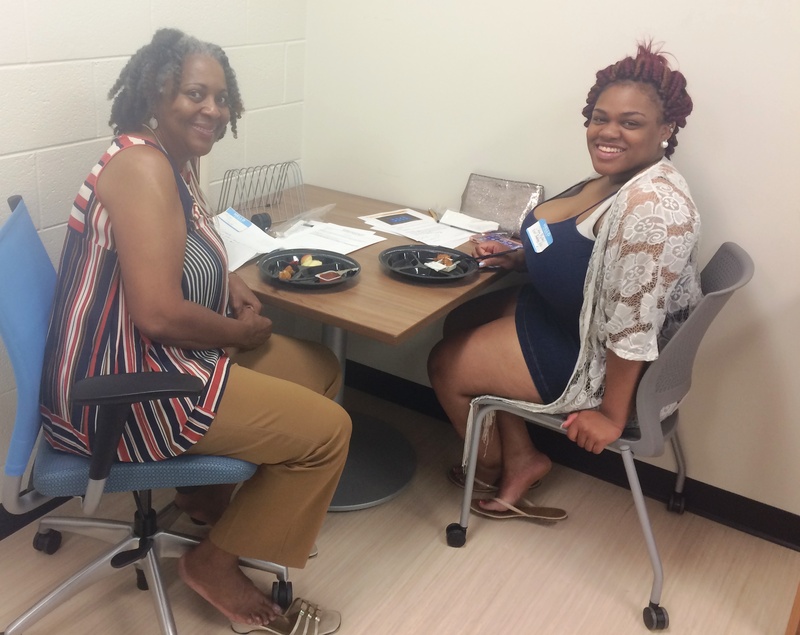 Ms. Erica Taylor took time out of her very busy day to make sure I felt comfortable, and Ms. Maggie Dangerfield helped me get started on my first few assignments. 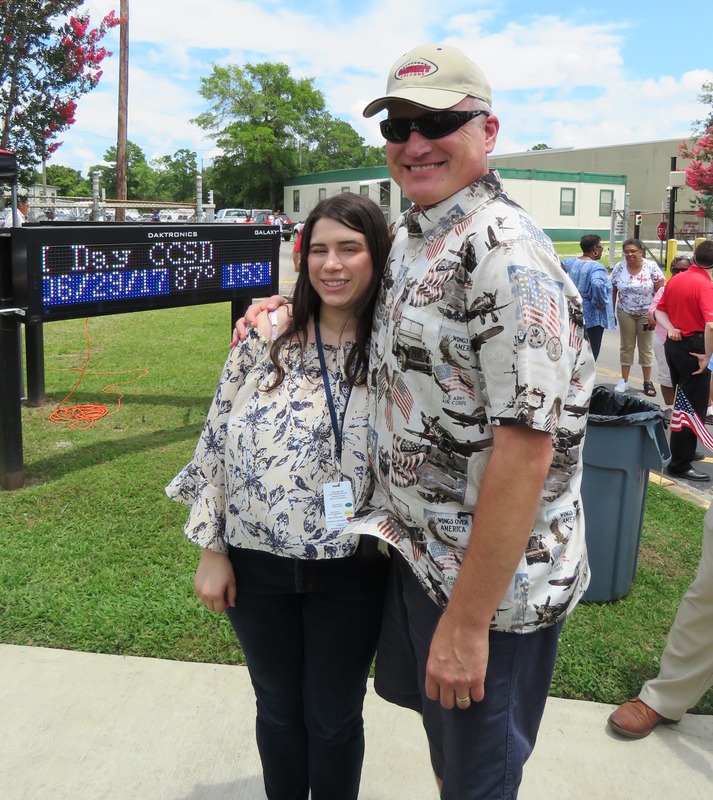 I am looking forward to seeing Ms. Gandy next week, though, because it seems she has a more structured set of assignments for me ready to go. 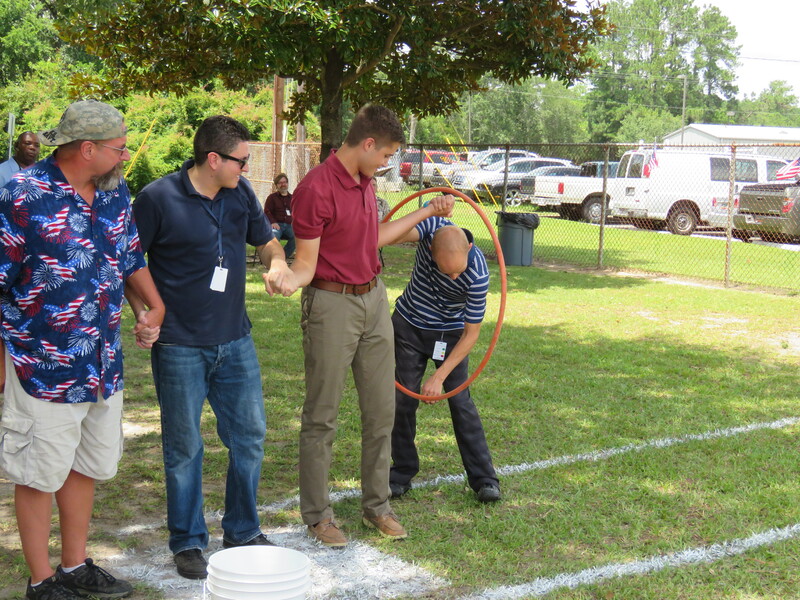 While I have spent this week working diligently to complete all my assignments, I want to focus next week on pushing myself out of my comfort zone. 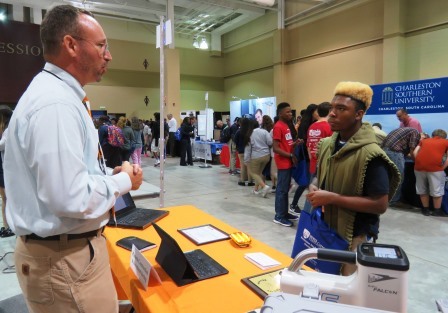 I want to, like Mr. Pruitt said, get as much as I can out of this internship by asking for new assignments when I have down time from a variety of people in the office. 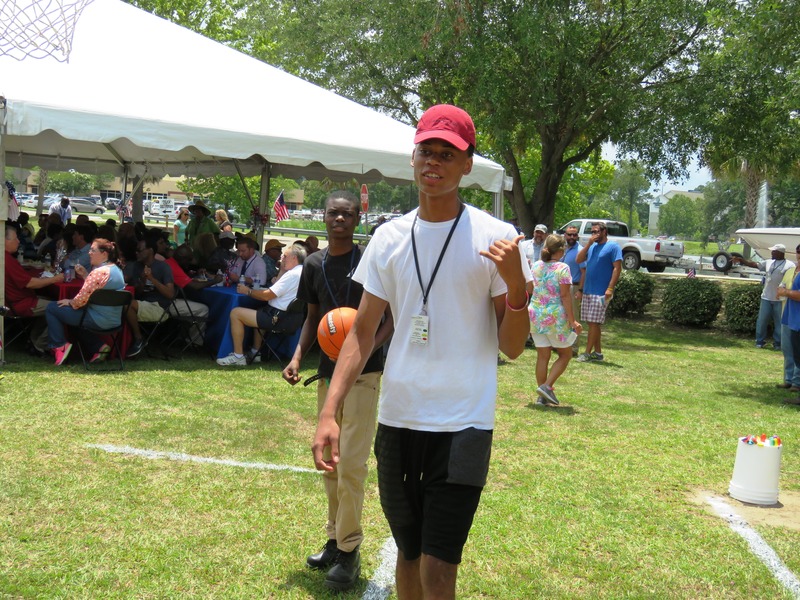 Everyone here does something slightly differently, and there is much to learn from everyone so long as I put myself out there. 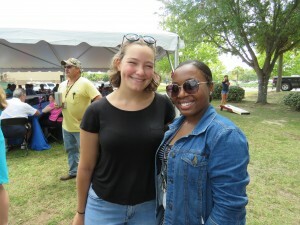 Taylor Kahn-Perry, left with fellow summer intern Latalia Brown, right. 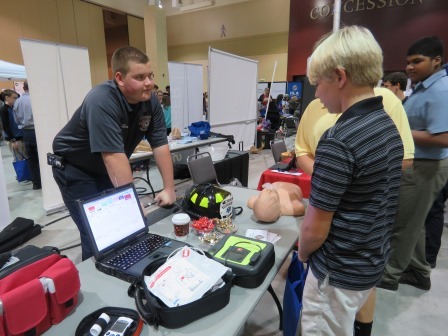 Students from 8 different CCSD high schools are working in 17 various departments throughout the district. 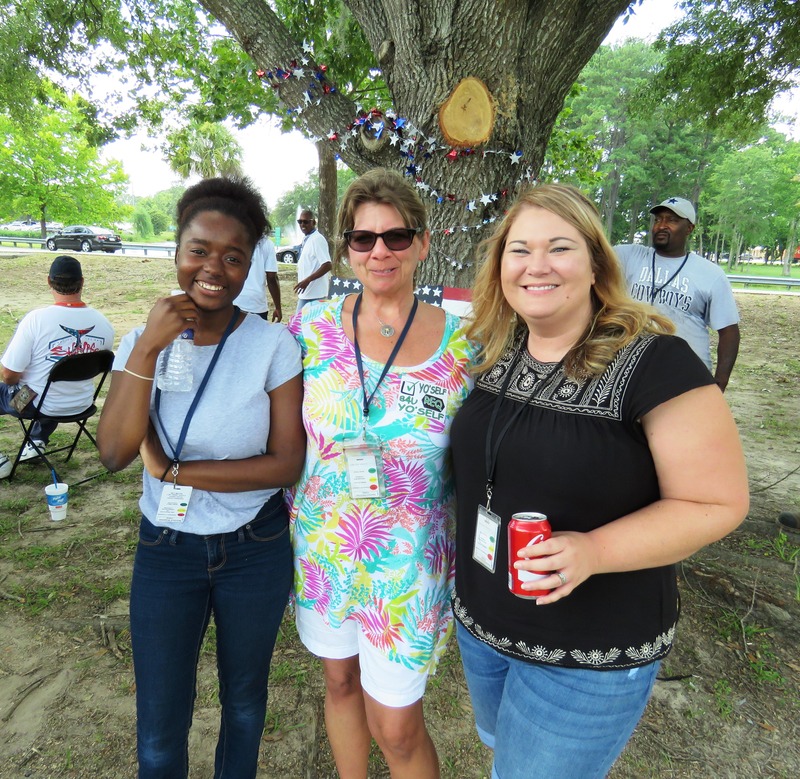 Just before the Independence Day holiday, district staff including summer interns gathered for a summer picnic at the Bridge View Drive Operations Center. 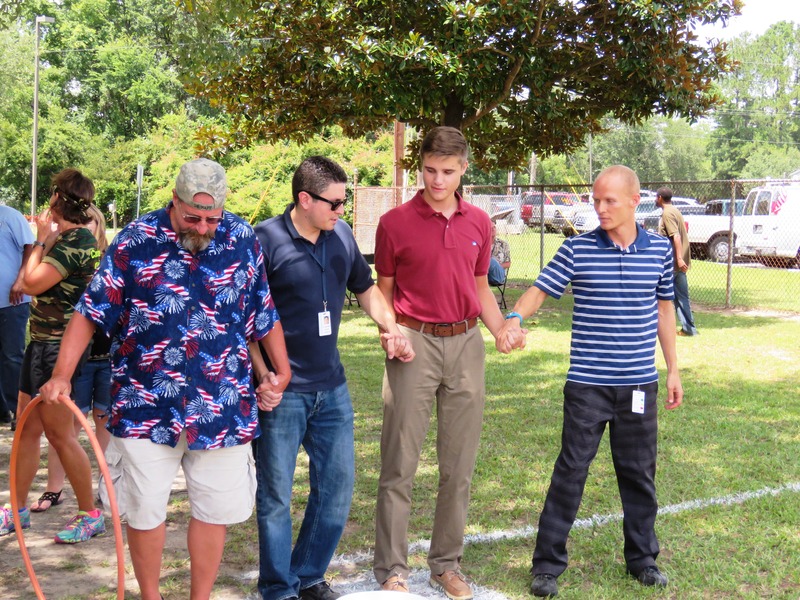 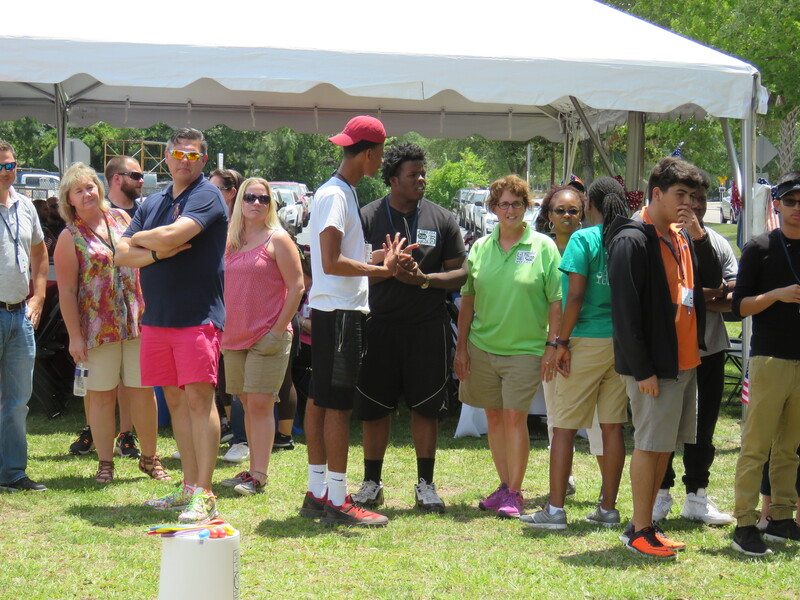 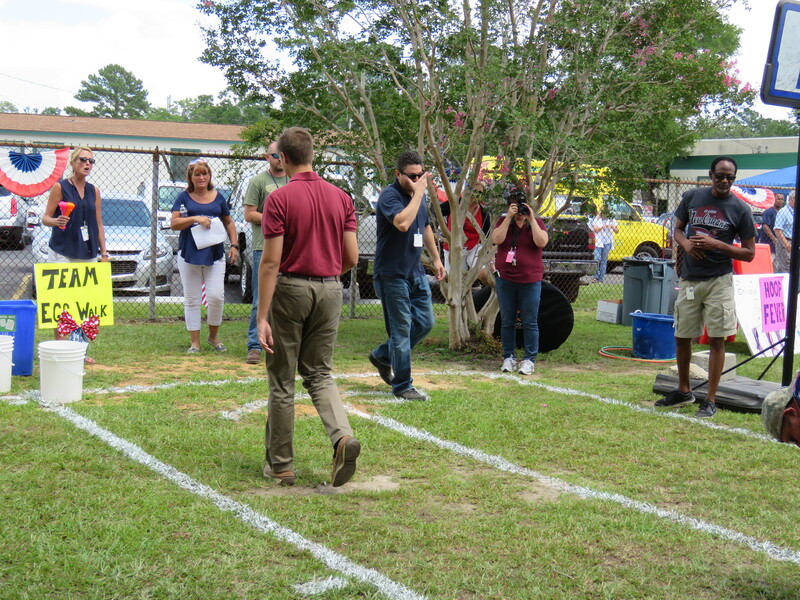 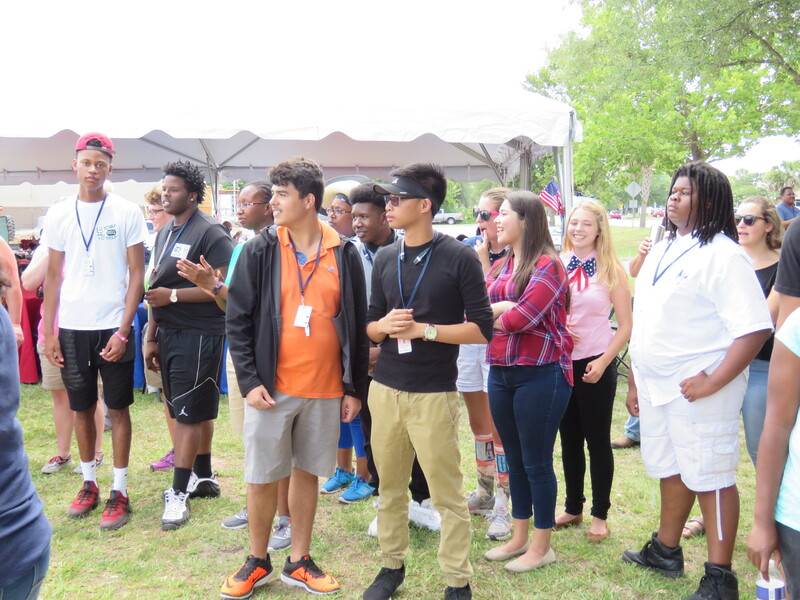 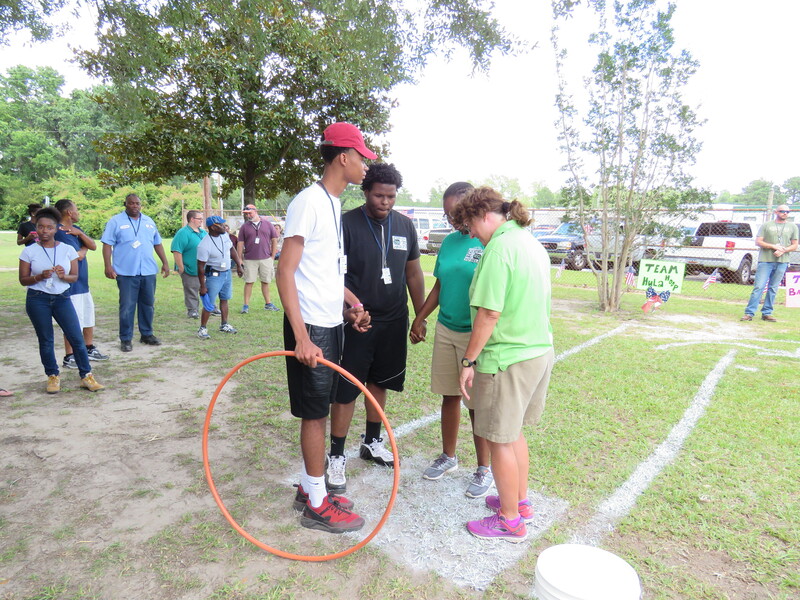 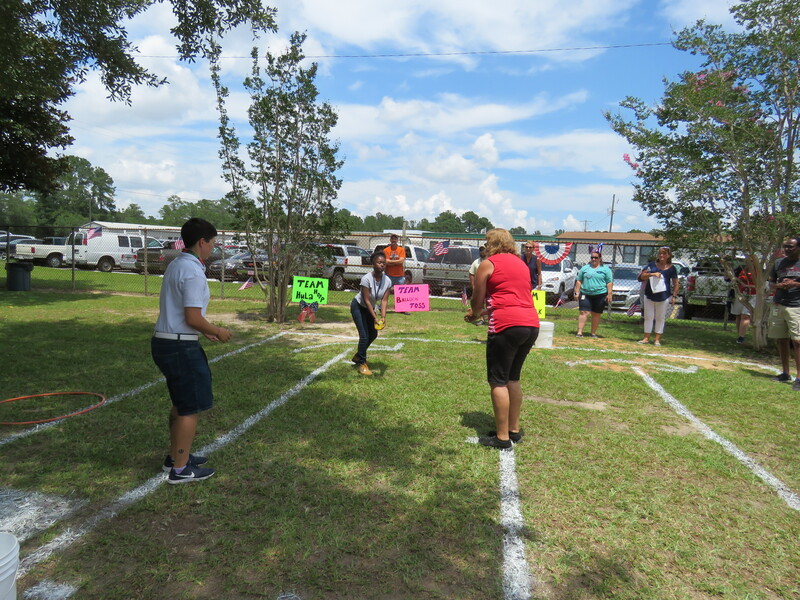 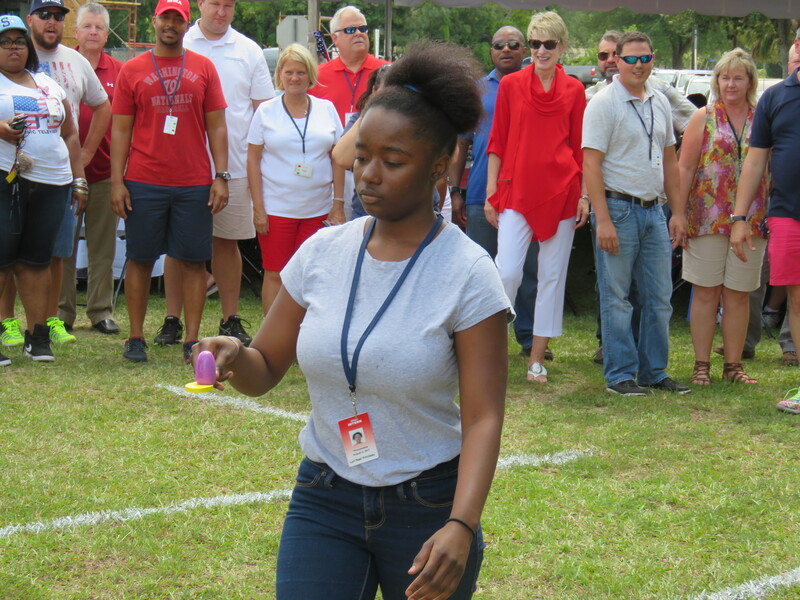 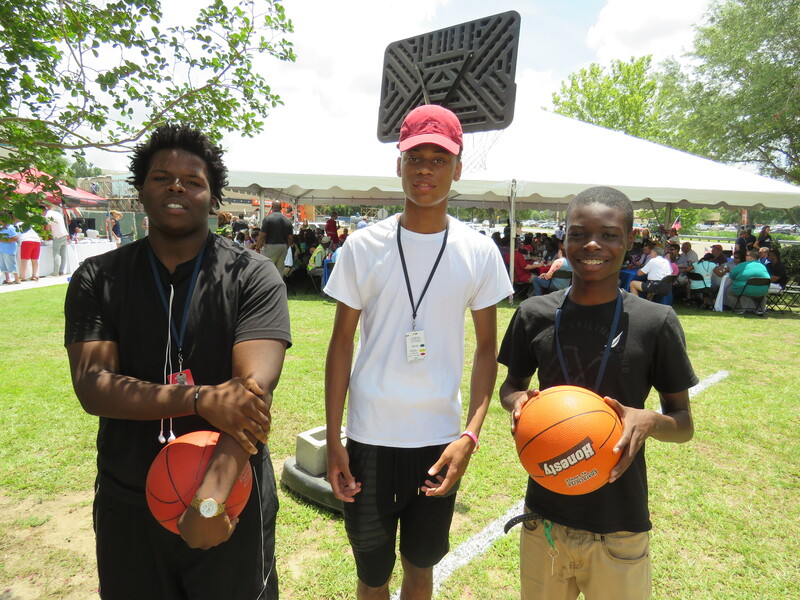 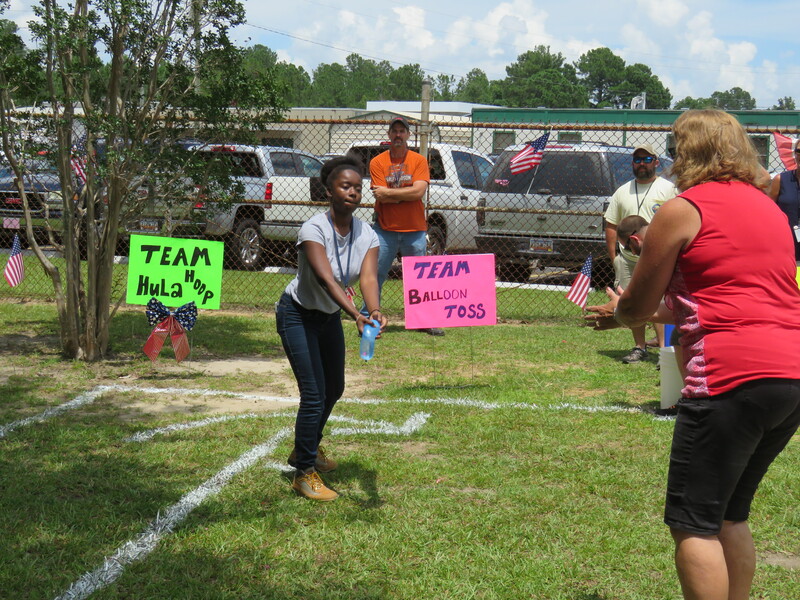 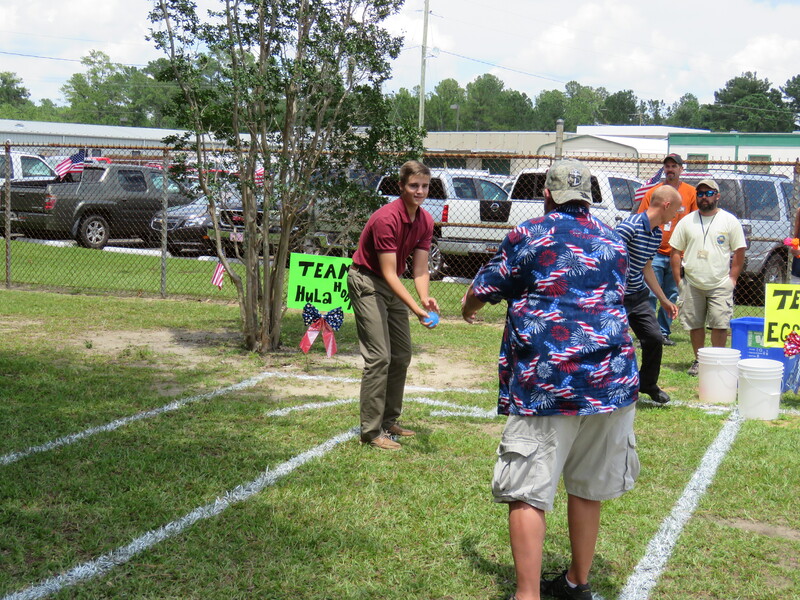 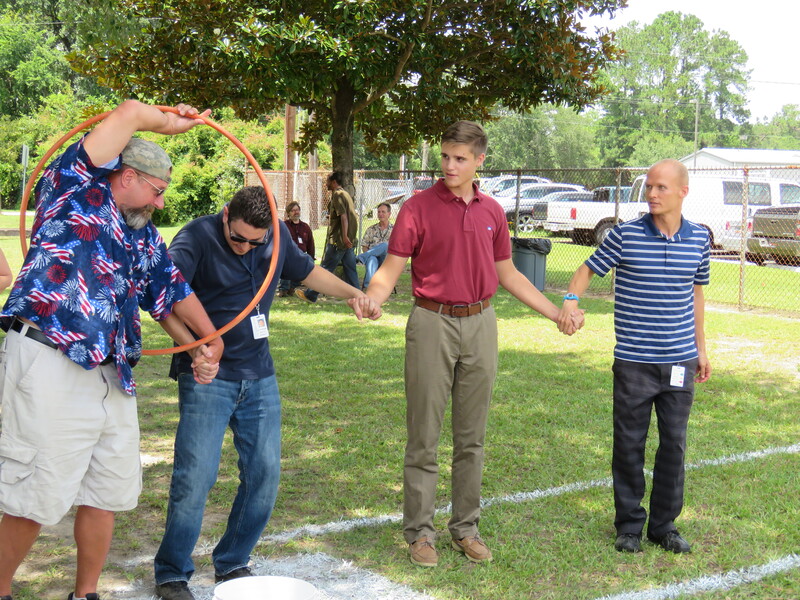 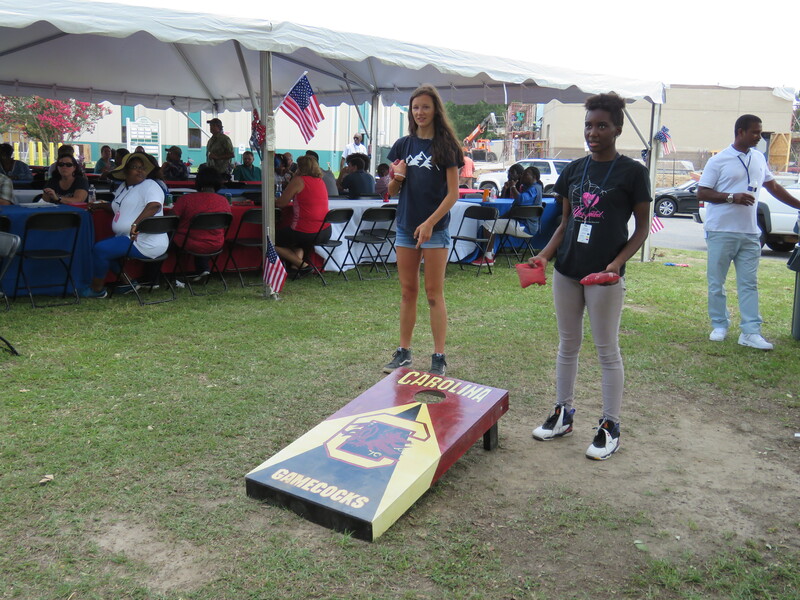 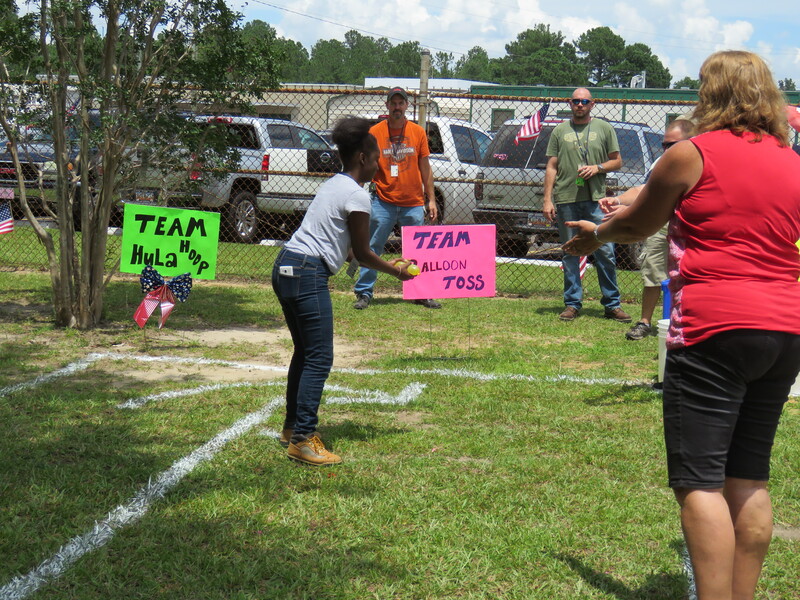 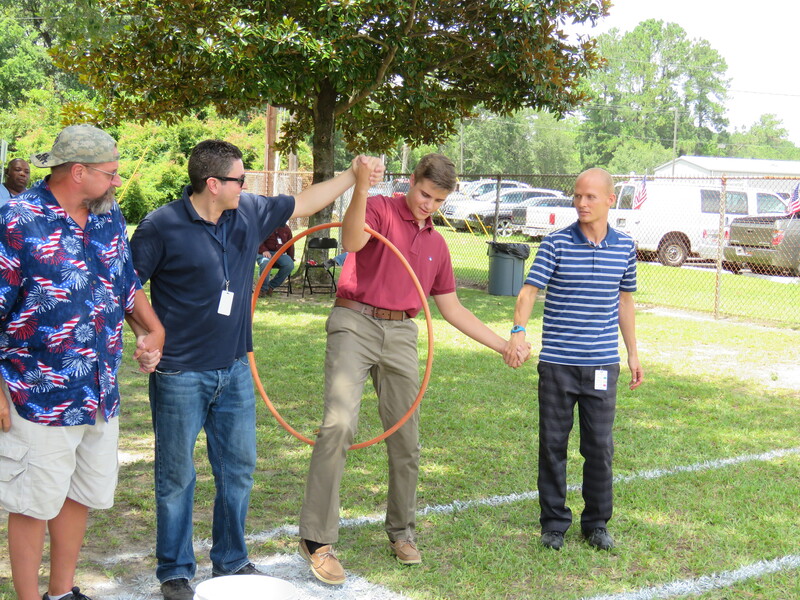 Student interns participated in the field day games and enjoyed the hamburgers, ice cream, and fellowship. 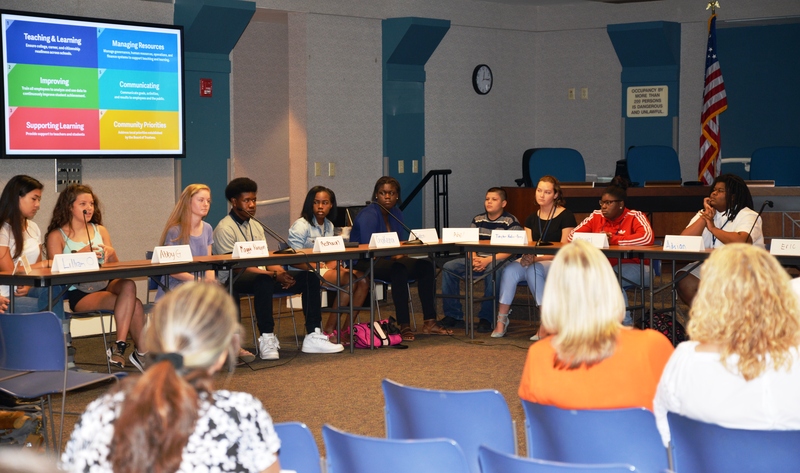 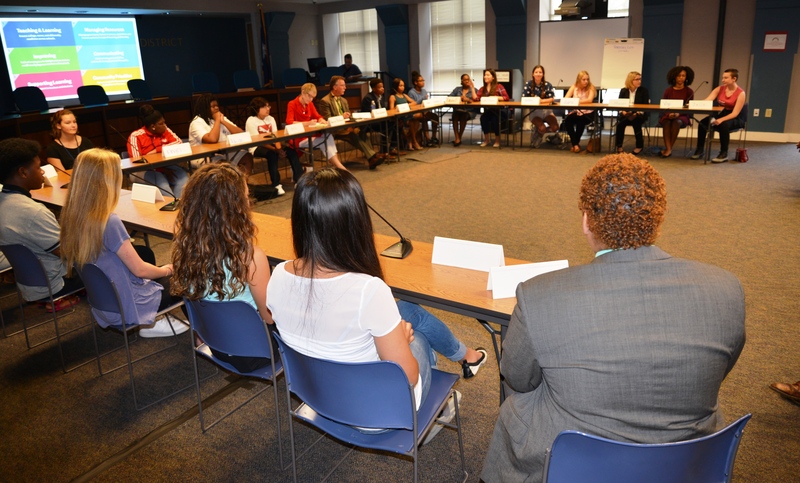 Student interns were also invited to participate in a special round-table discussion to offer input on our schools to Charleston County Schools Superintendent Gerrita Postlewait. 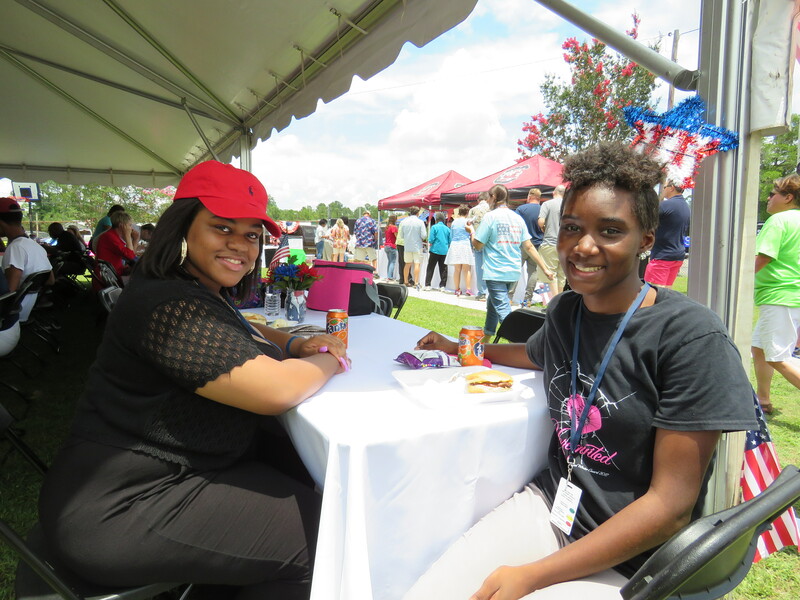 Check out these pictures and this article in the Post & Courier. 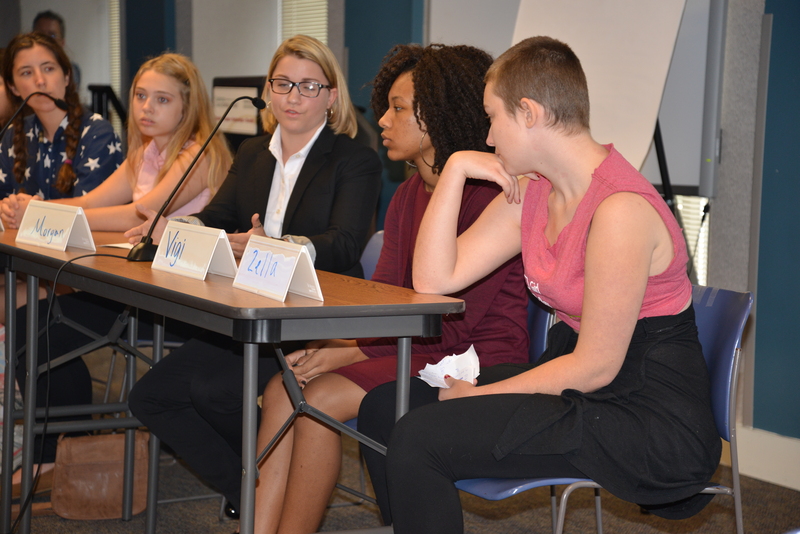 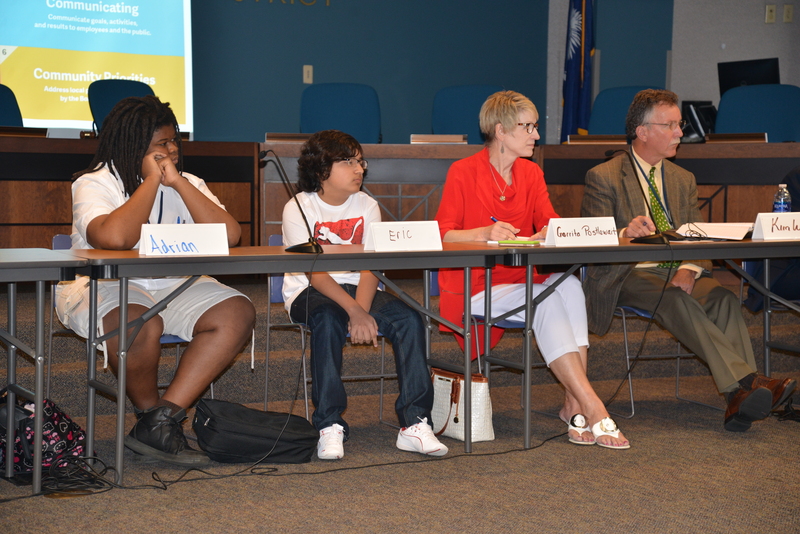 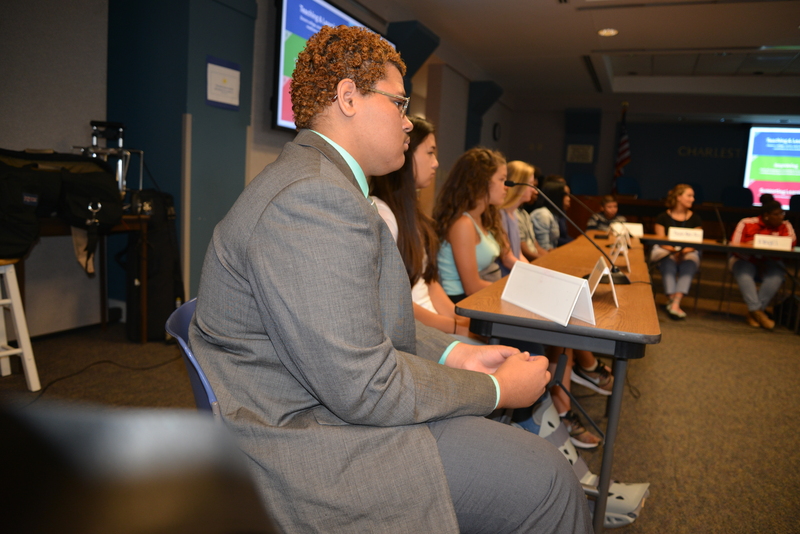 Thanks to the Strategy and Communications Department for these pictures from the Student Listening Session. 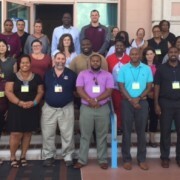 Educators from Baptist Hill MHS, Haut Gap MS, Morningside MS, Simmons Pinckney MS, St. Johns HS, and the new CCSD Early College High School recently attended professional development sessions at the Advancement Via Individual Determination (AVID) Summer Institute in Tampa, Florida. 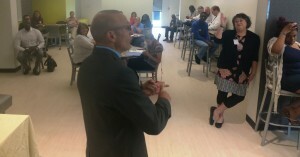 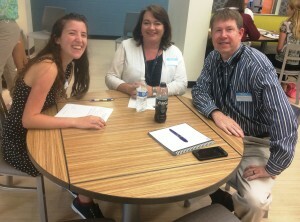 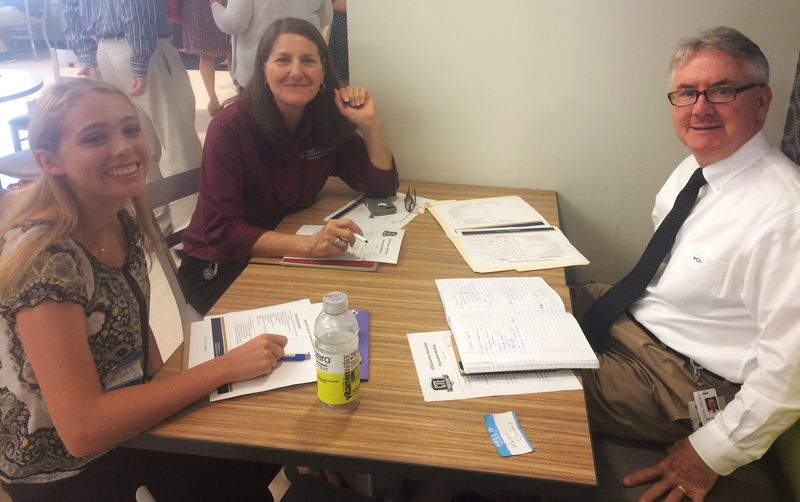 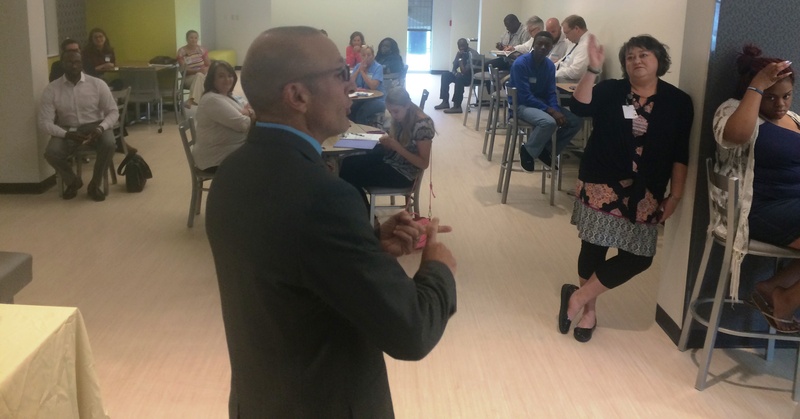 Ms. Melissa Kemp, AVID Director and Mr. Richard Gordon, Executive Director of Career and Technology Education facilitated the group’s working sessions. 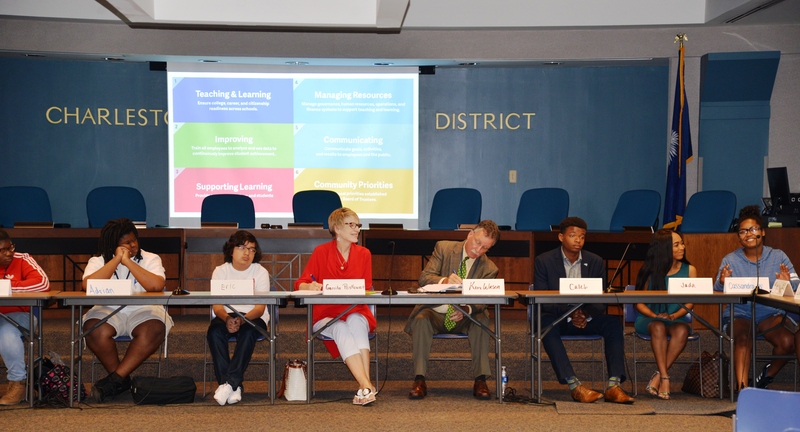 By the end of the productive week of professional development and planning meetings, the group had completed their AVID implementation plan, and ensured its alignment with the district Strategic Plan for the 2017-2018 school year. 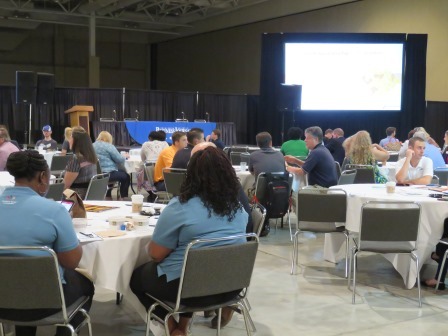 Participating educators also attended individual strand sessions in their content and leadership areas and left with specific strategies on how to help students be college and career ready. Thanks to all that made this opportunity possible! 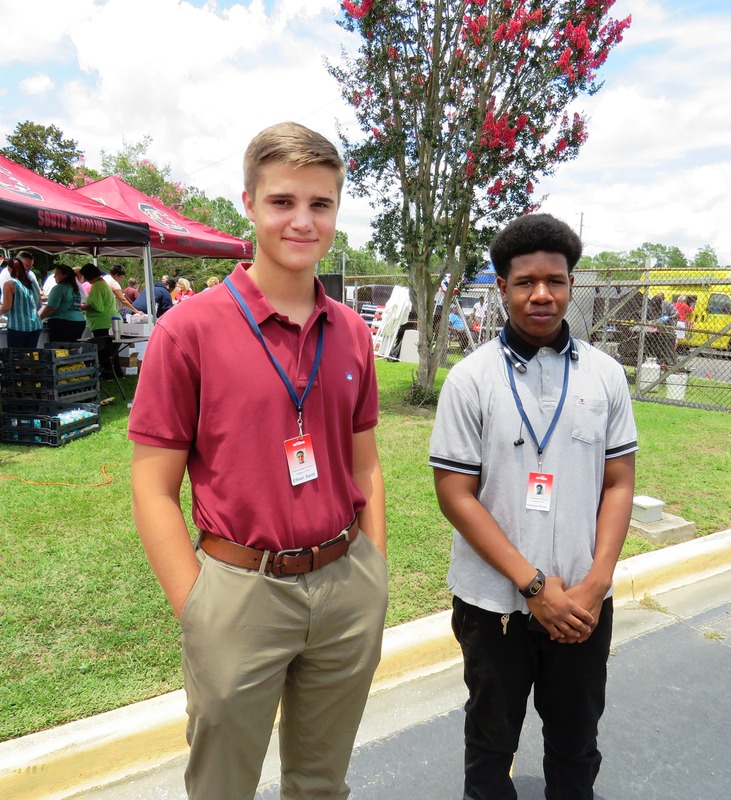 Congratulations to all 27 students from high schools throughout Charleston County School District on their summer internships! 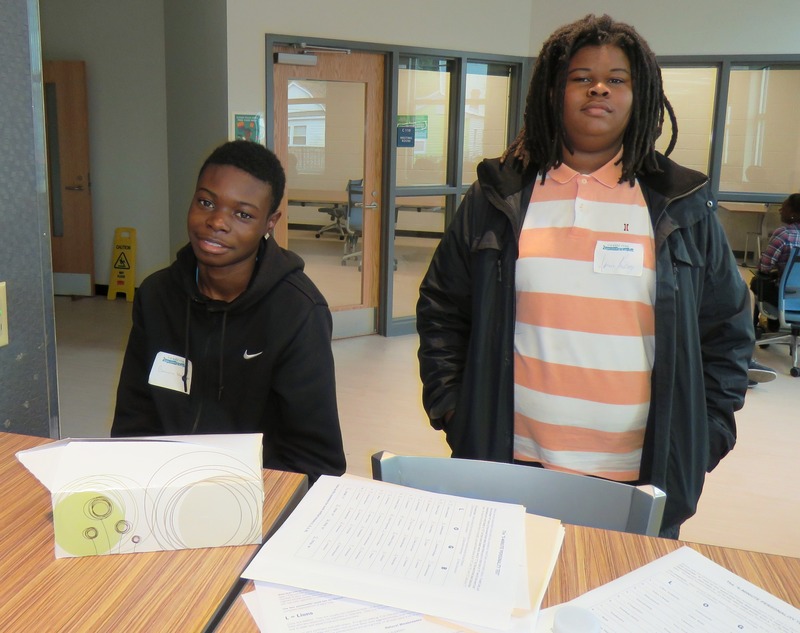 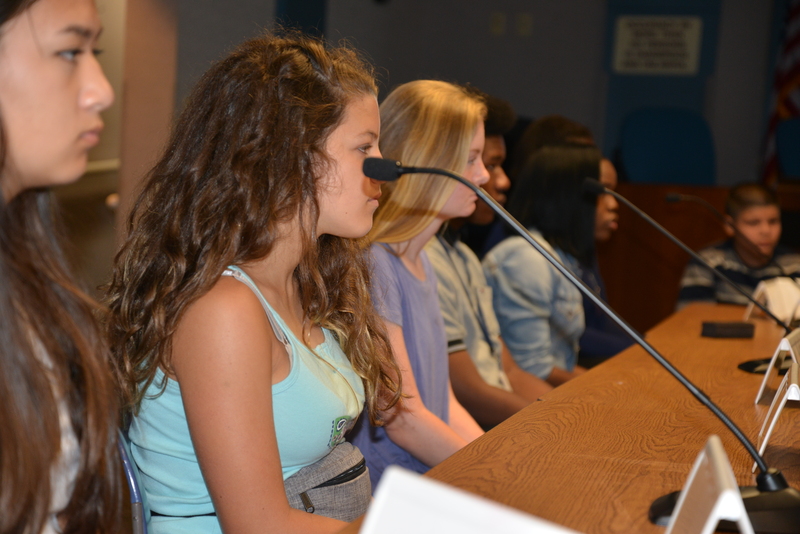 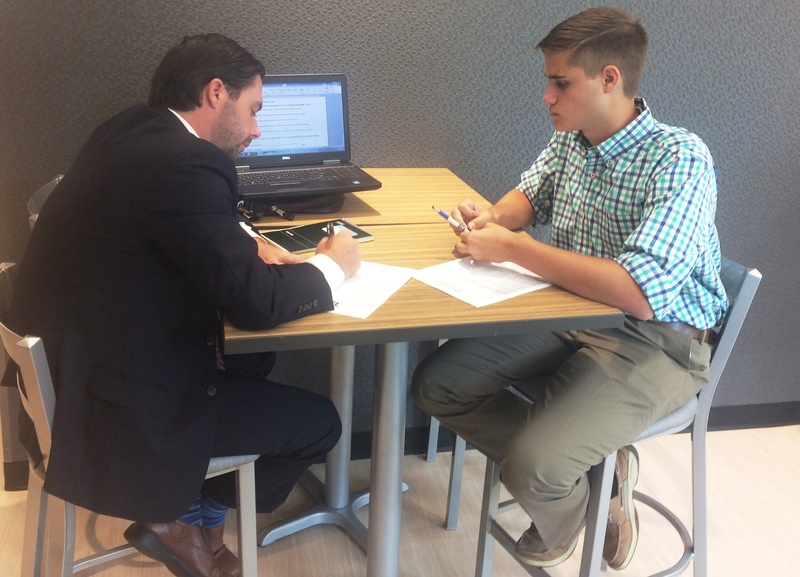 Each student went through an interview process and completed all required CCSD Human Resources requirements. 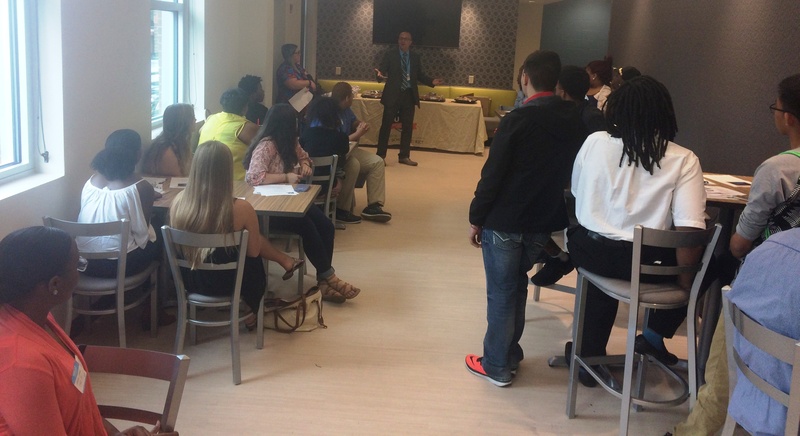 This past week, the summer interns participated in an Orientation meeting and a Student Retreat. 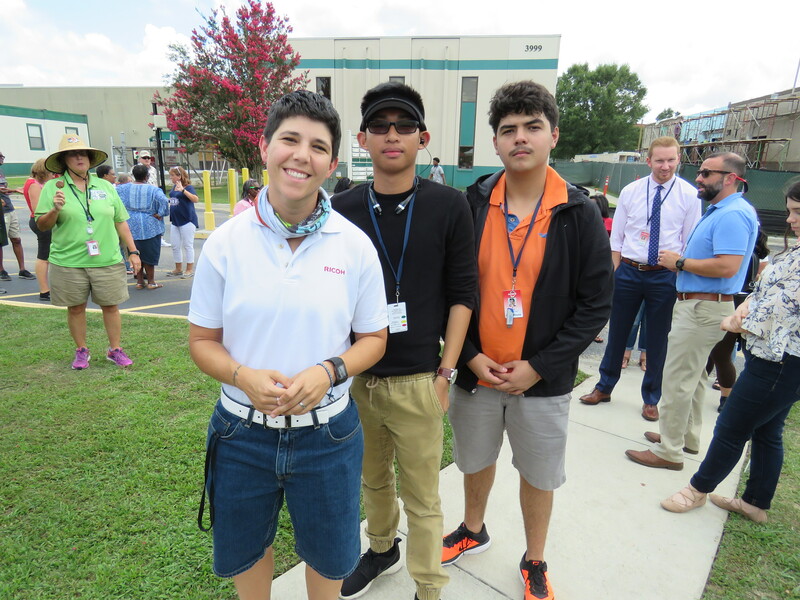 At the Orientation meeting, students completed their requirements for employment, met with their supervisors, and learned about the KRONOS time clock system. The students and their supervisors met to discuss the specific expectations for the summer work-based learning experience. 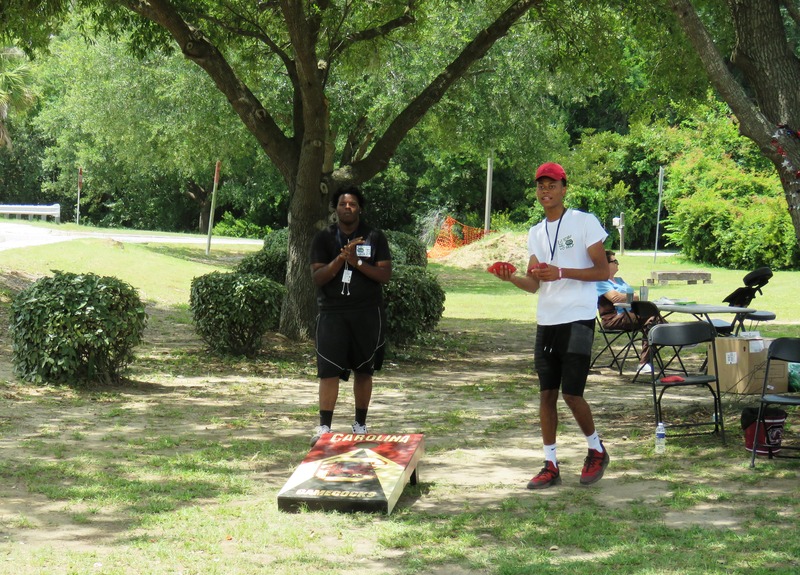 At the Retreat, students got to know their fellow interns through various activities including a personality assessment. 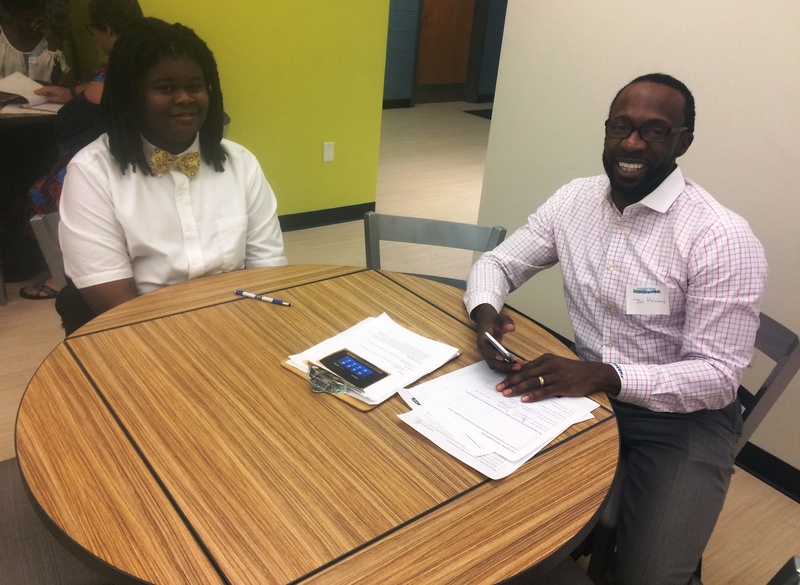 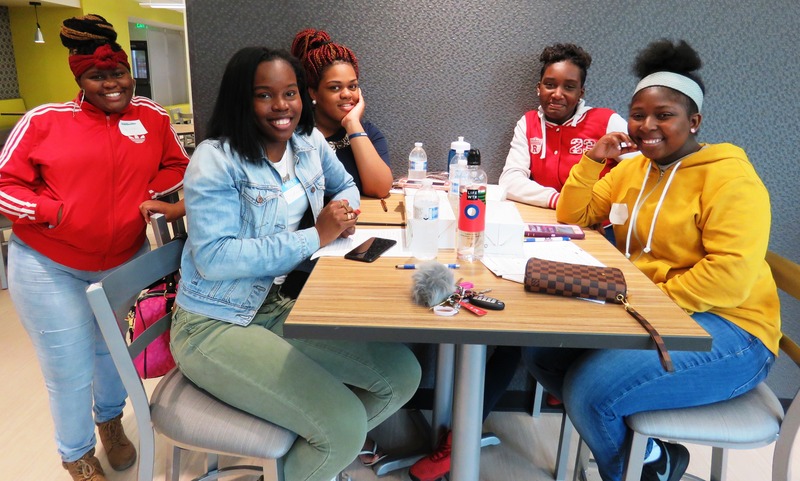 They also heard about best practices in the college scholarship application process from a former student intern currently in college on a full scholarship. 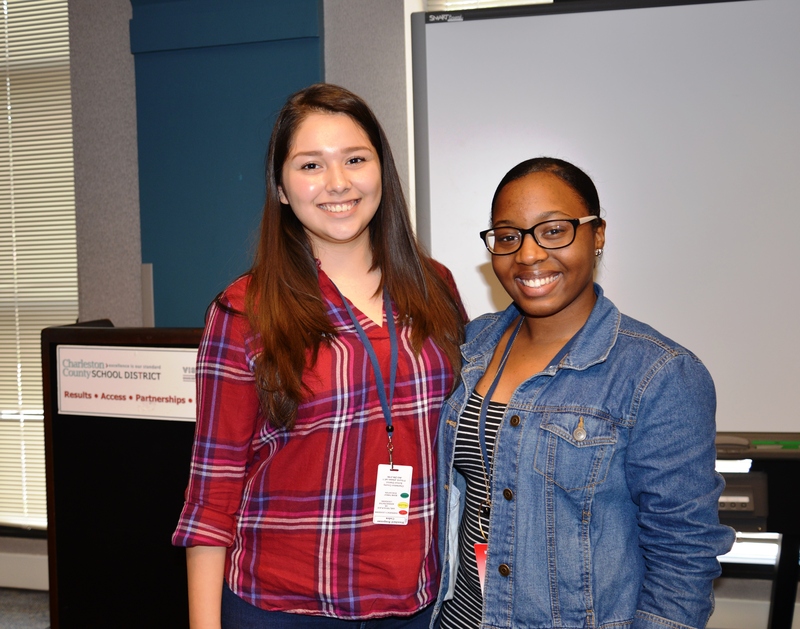 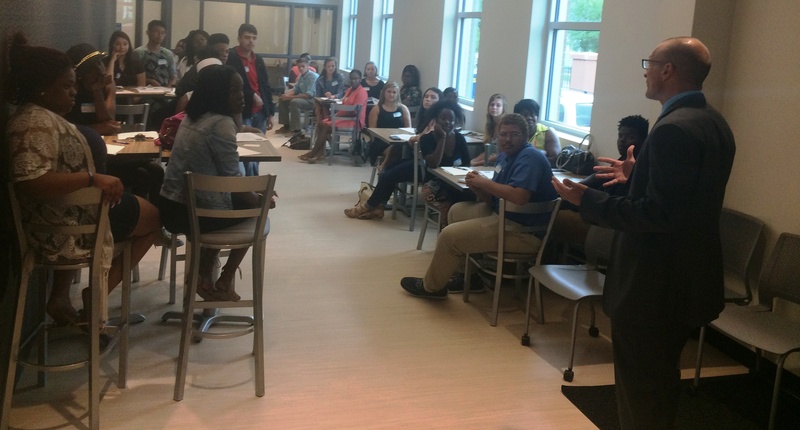 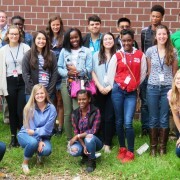 Thanks to everyone that made this summer’s kick off week for the 2017 Summer Interns a success including Sandra Quigley in HR, Ashley Chambers from KRONOS Support, Burke High School for hosting, Carolyn Southall from NCHS, CTE Executive Director Richard Gordon, and all the CCSD dept reps that spoke at the orientation meeting with the student interns. 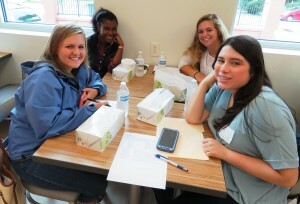 Thanks to Doctors Care for their assistance with the TB test requirements for each intern. 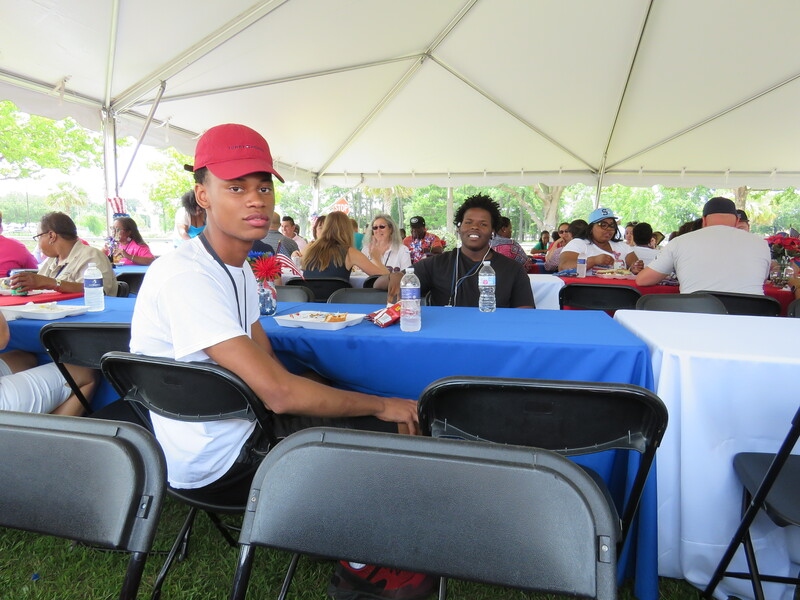 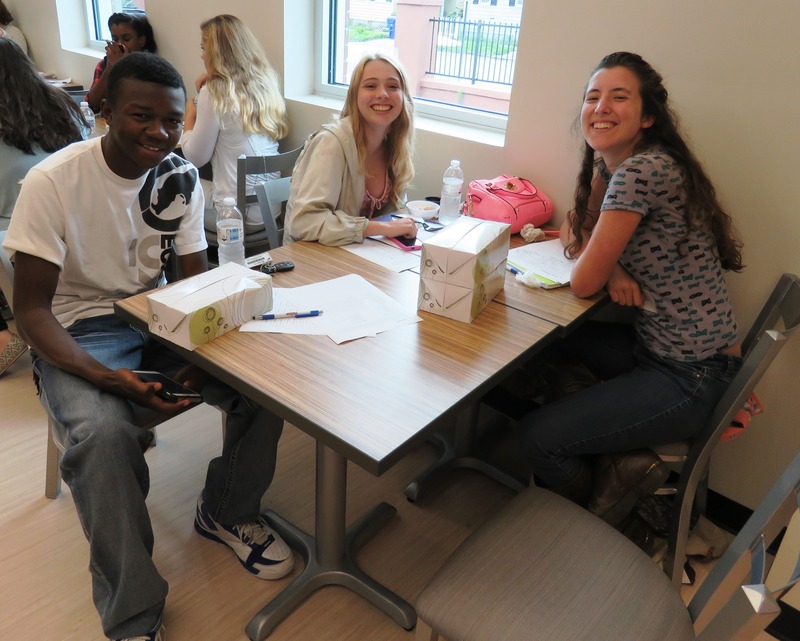 Check out these additional pictures from the Orientation and Retreat meetings. 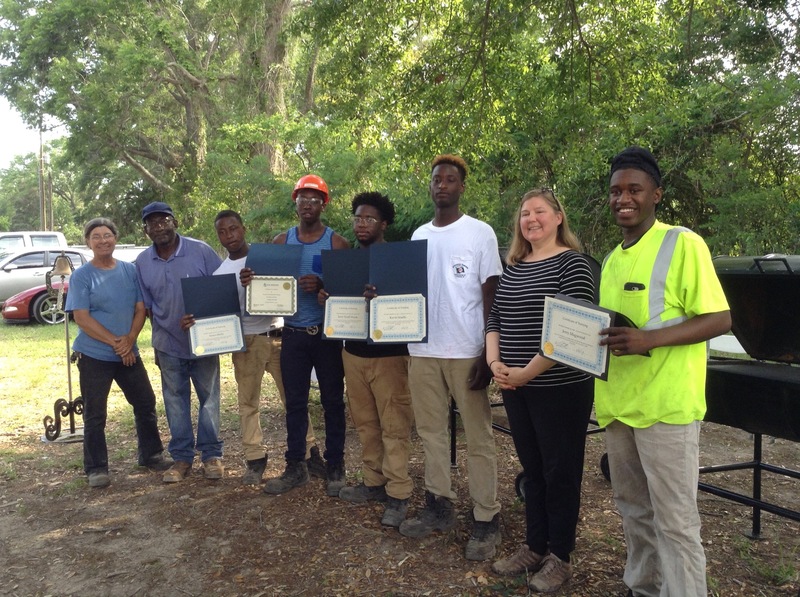 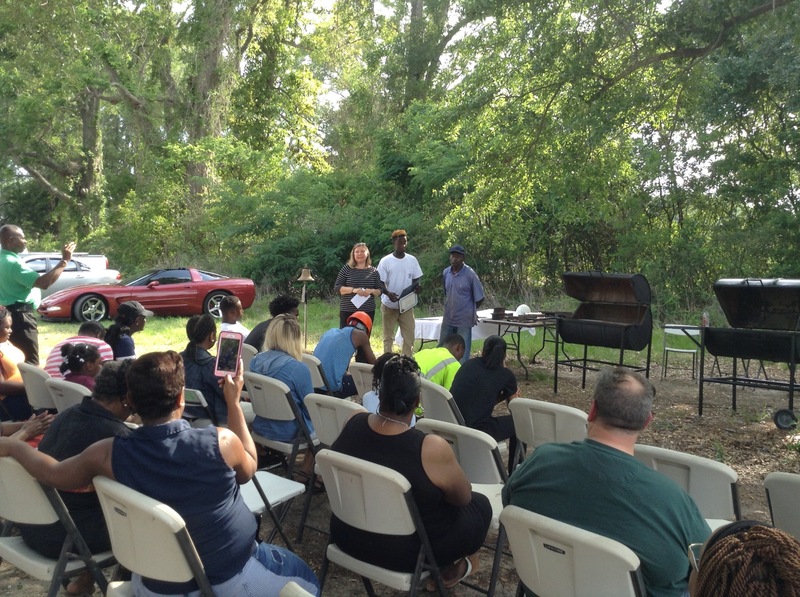 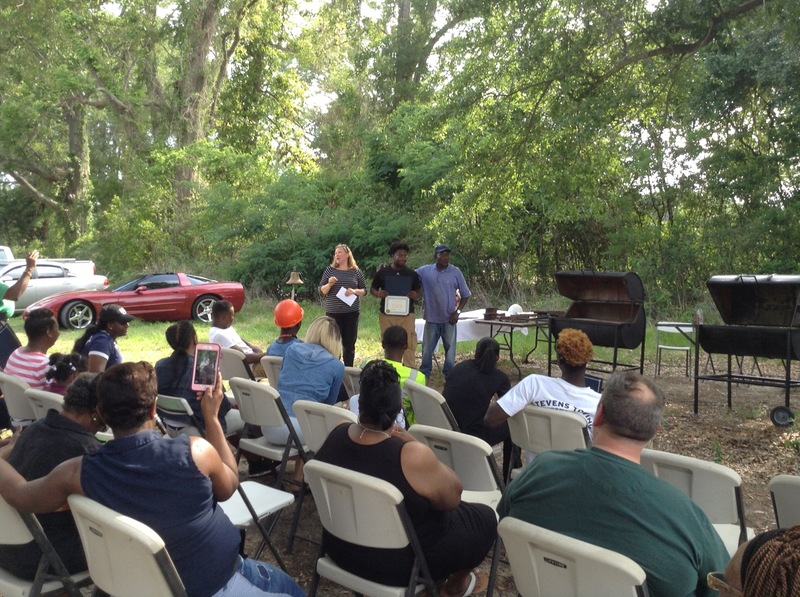 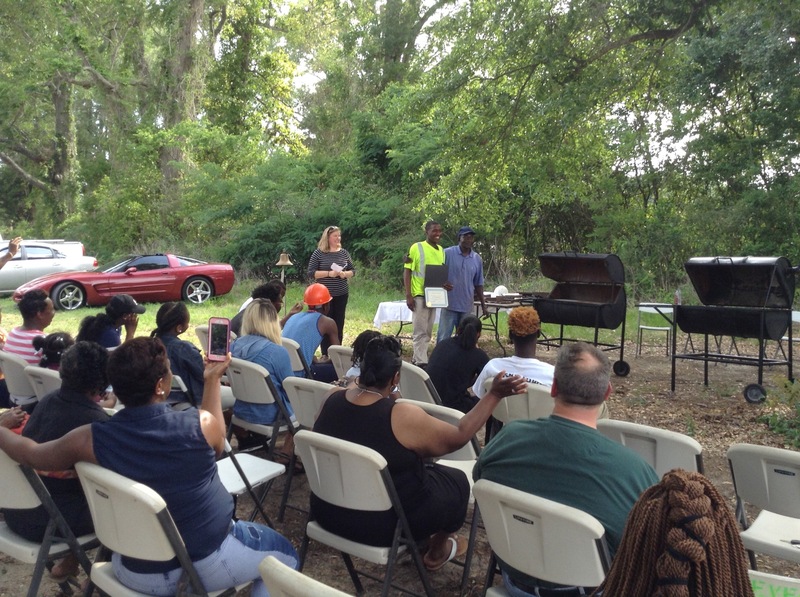 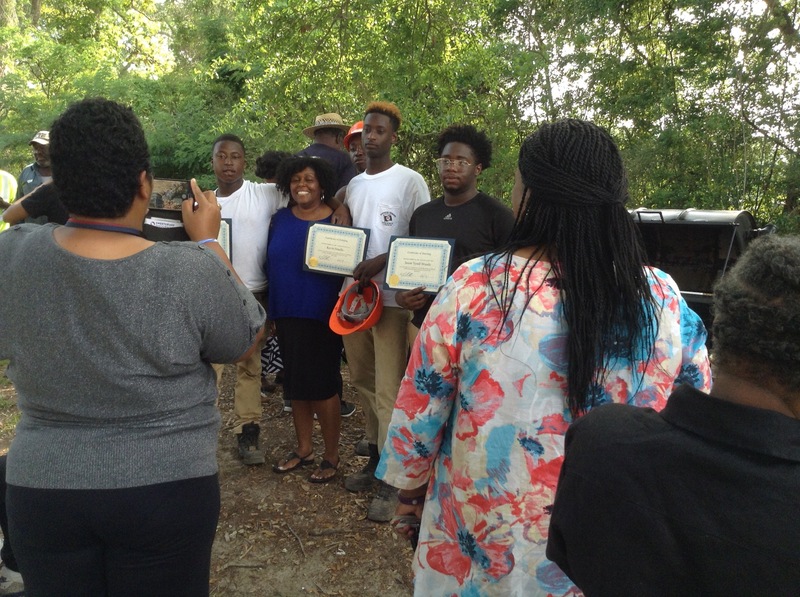 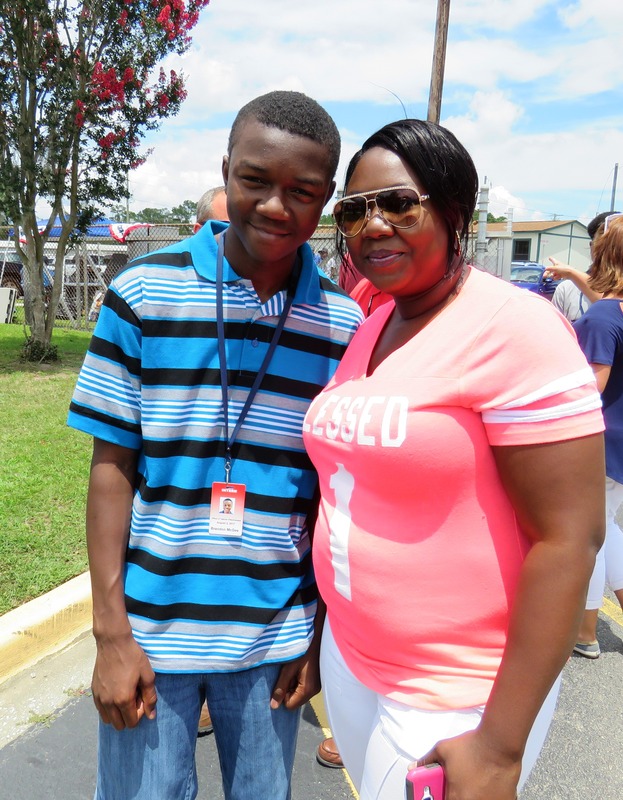 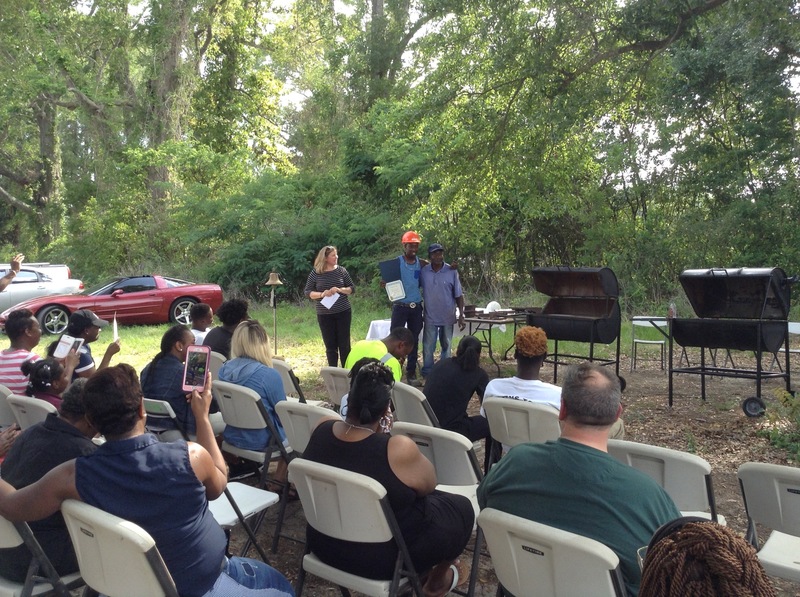 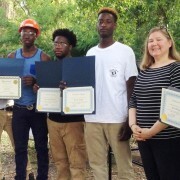 May 11, 2017 – Yonges Island, SC – Five students from Baptist Hill Middle High School completed their spring internship program at Stevens Towing Company with a special ceremony. 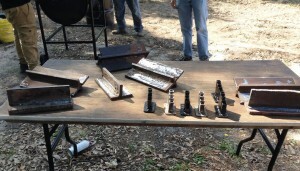 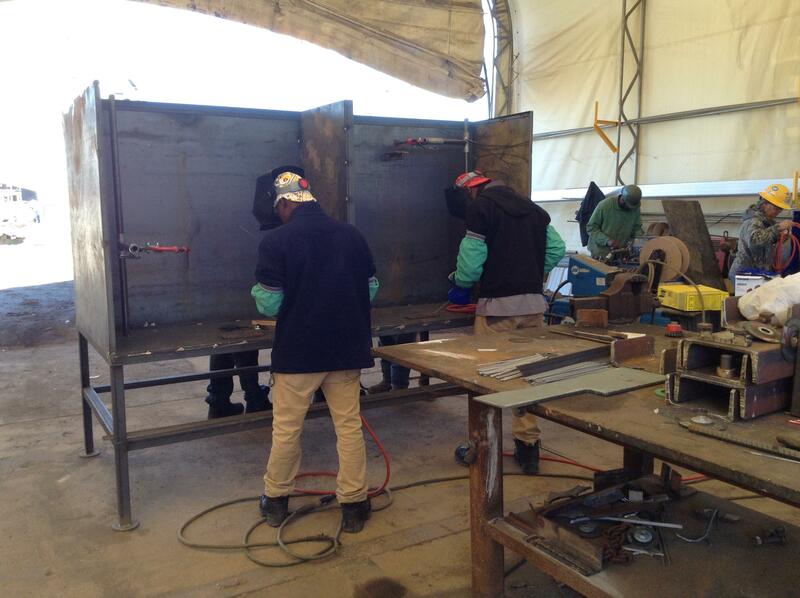 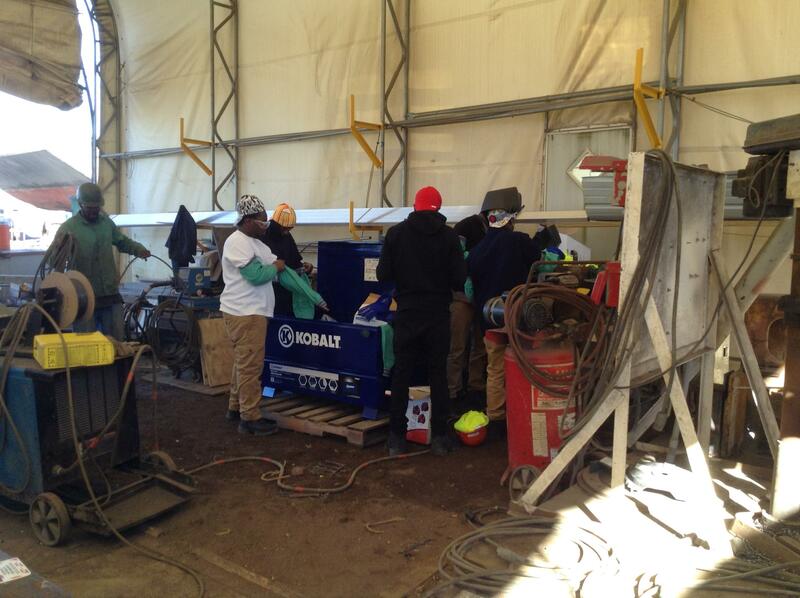 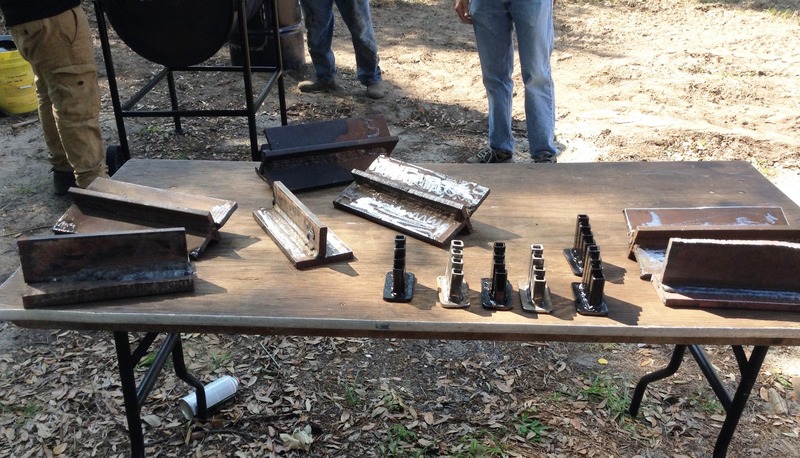 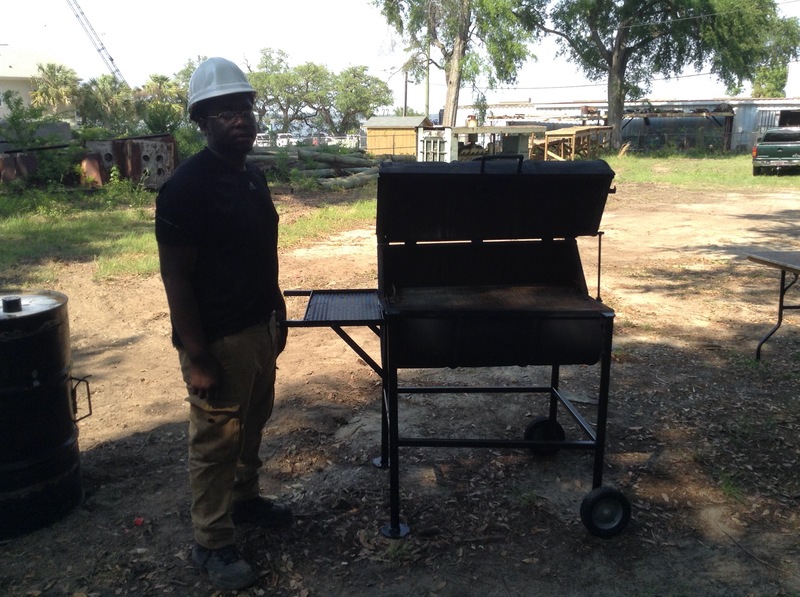 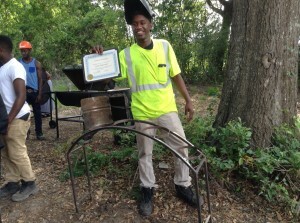 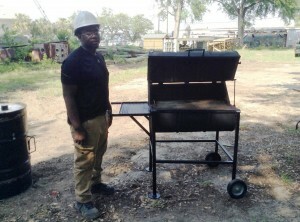 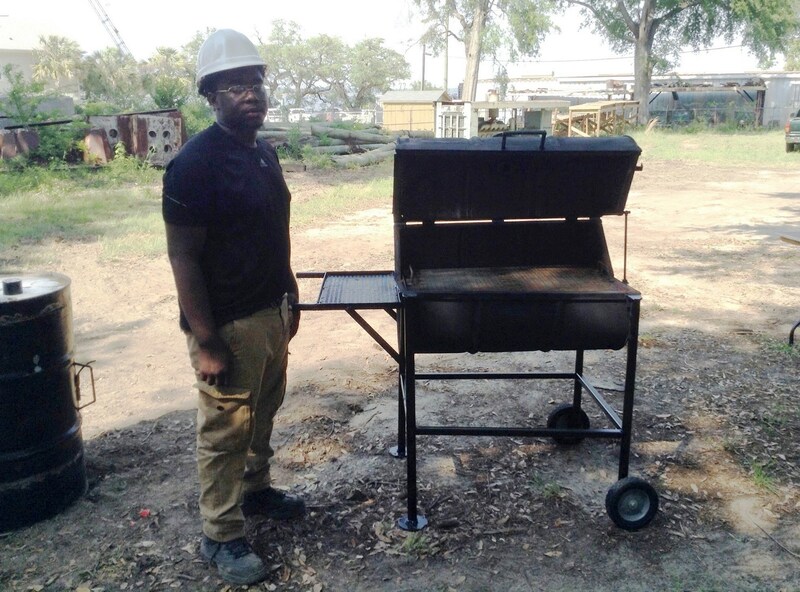 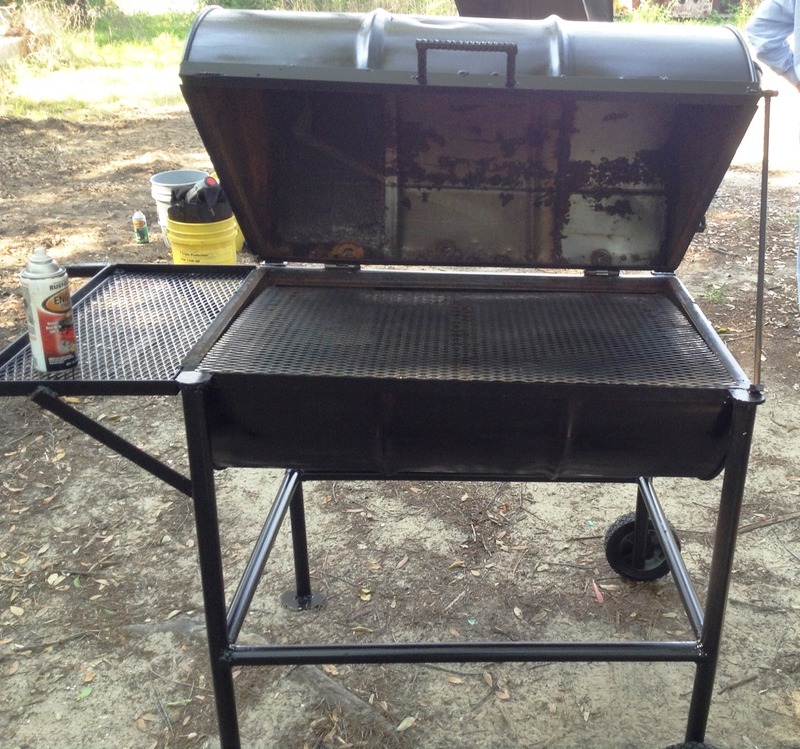 The students’ capstone project were these grills they made themselves by putting their learned welding skills to use. 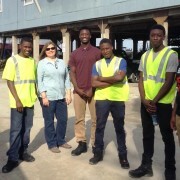 “The students did an excellent job and really worked hard”, said Libby Singletary, Human Resources Director at Stevens Towing. 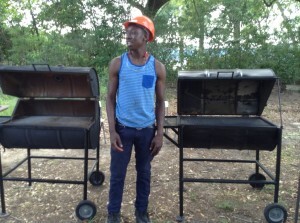 One student even designed and built a meat smoker! 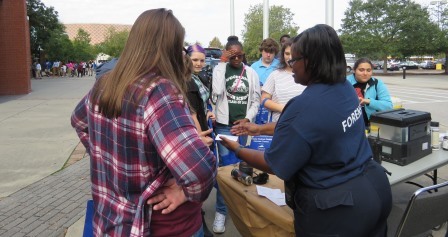 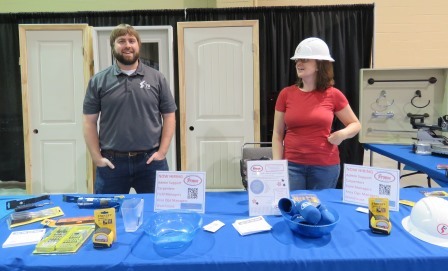 The students were proud to display their welding coupons, which are small examples used to demonstrate their welding techniques. 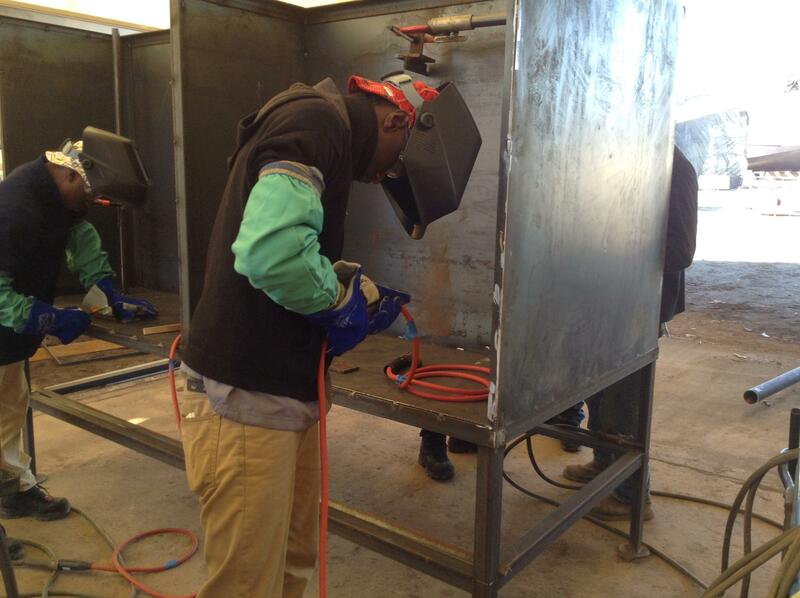 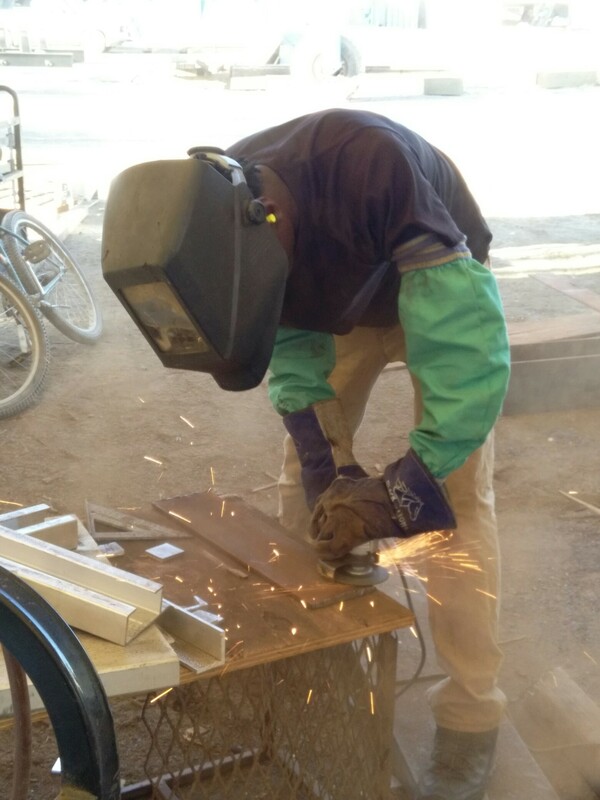 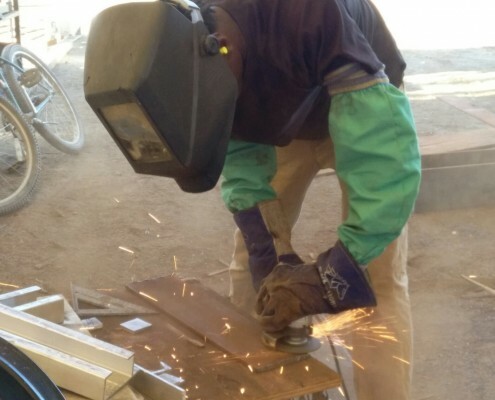 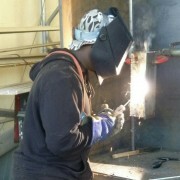 Students were empowered during the semester-long work-based learning opportunity with instruction in welding techniques and best practices. 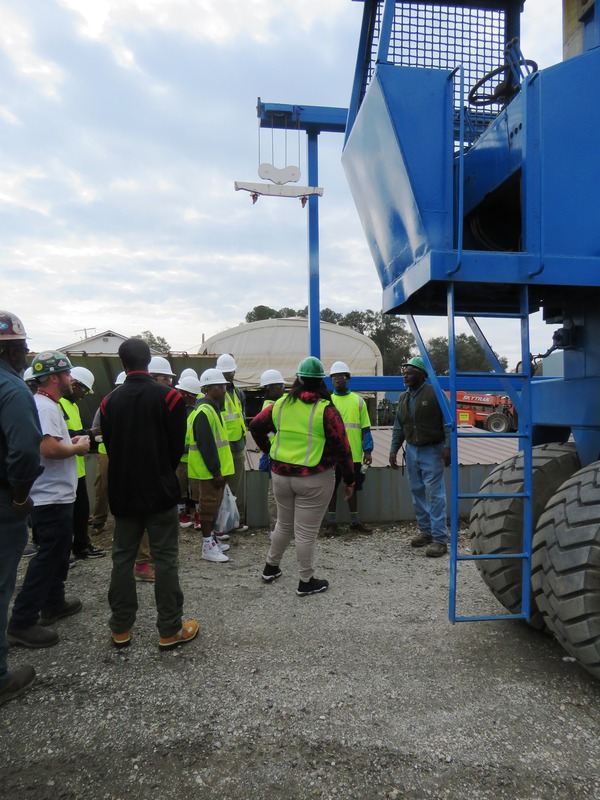 Thanks to the entire team at Stevens Towing Company for hosting this amazing work-based learning opportunity for these students from Baptist Hill MHS! 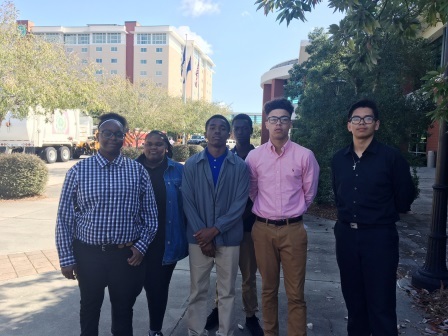 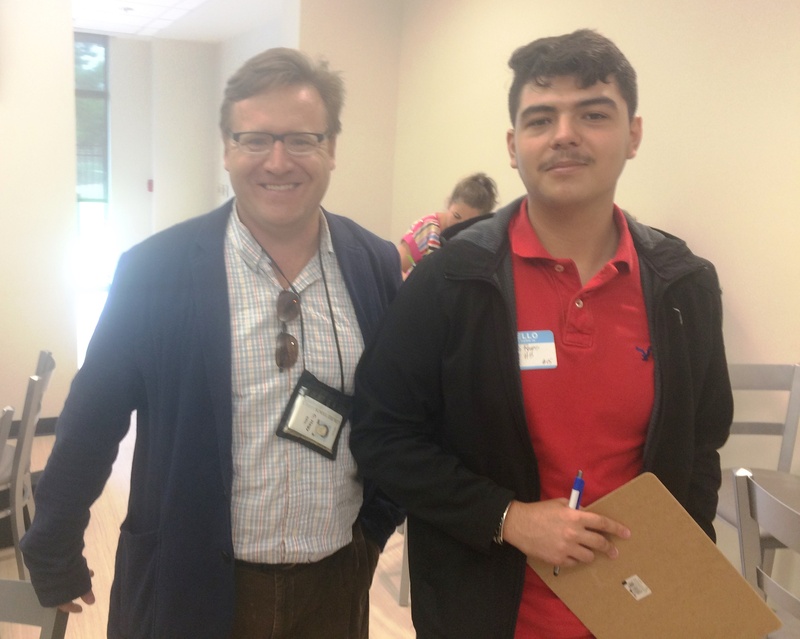 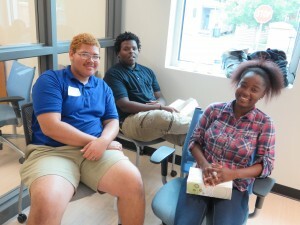 Thanks to the Charleston Metro Chamber of Commerce for facilitating the connection that led to this experience for these students. 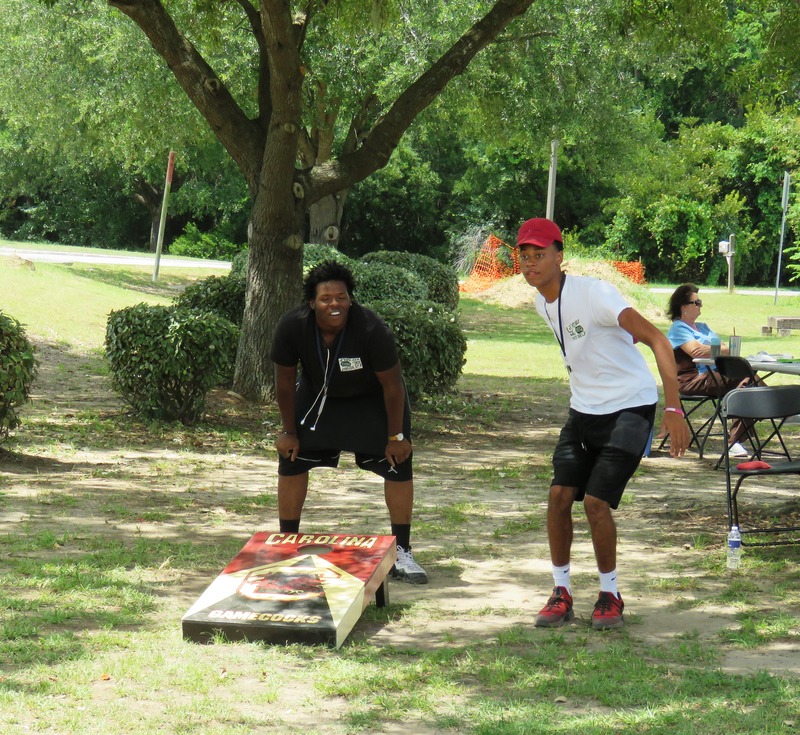 Please enjoy these additional pictures from the celebratory end of semester event. 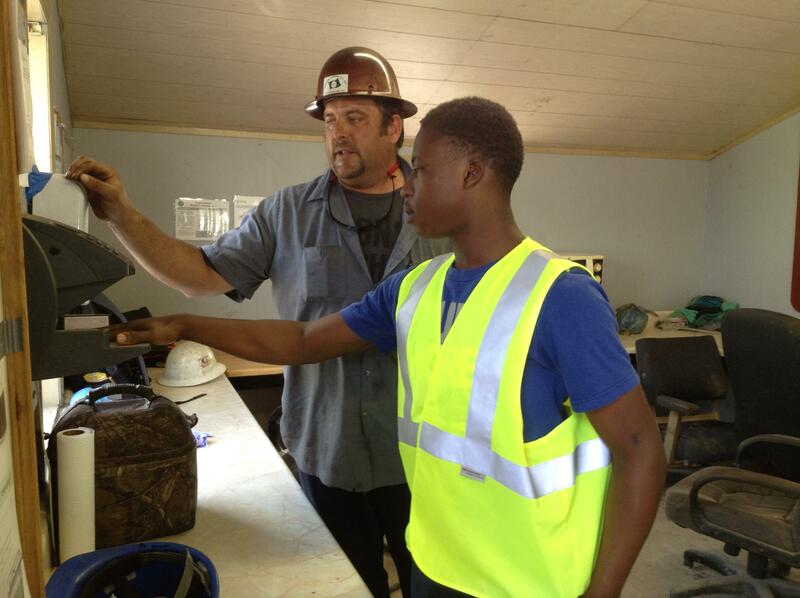 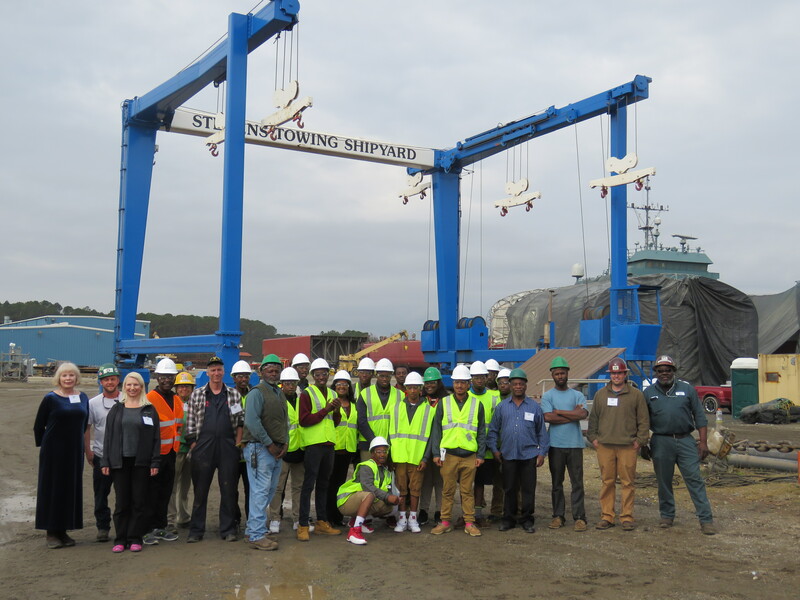 Students from Baptist Hill Middle High School are receiving on-the-job training in welding as a part of their spring semester internship program with Stevens Towing in Yonges Island. 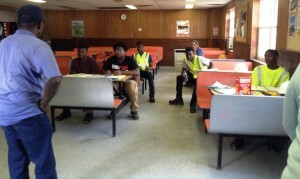 Huge thanks to all the professionals at Stevens Towing that are mentoring these young men in this terrific work-based learning partnership! 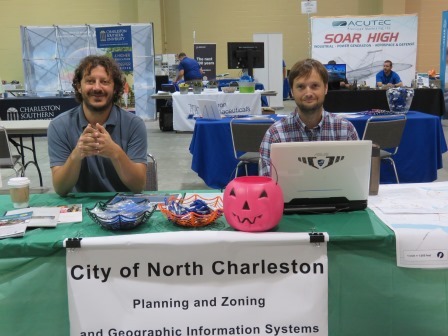 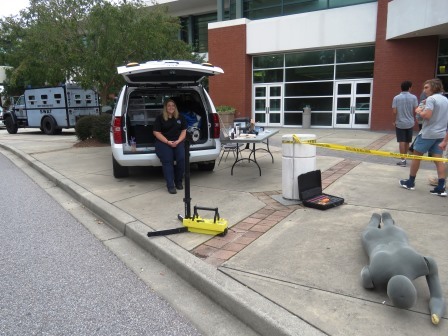 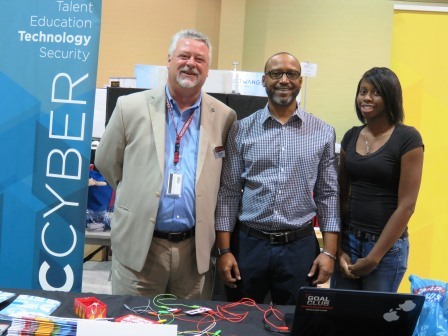 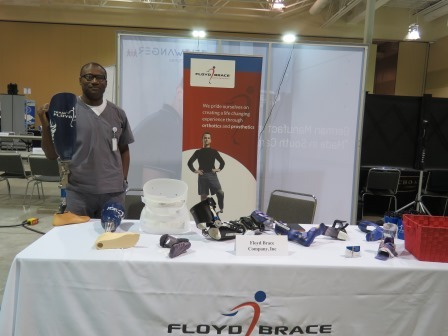 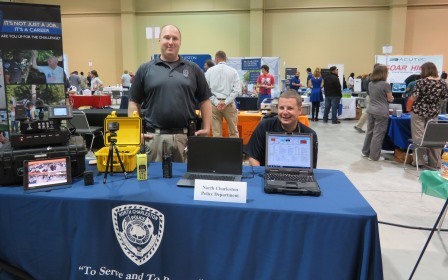 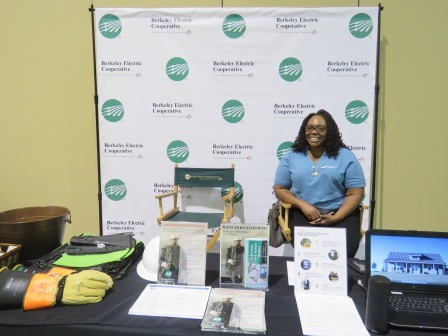 February 14, 2017 – North Charleston, SC – Thanks to a hard working group of volunteers from local companies and organizations, over 1000 students were invited to a very special STEM themed event staged at a theater complex adjacent to North Charleston City Hall. 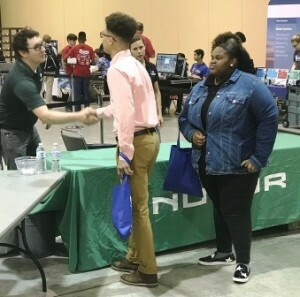 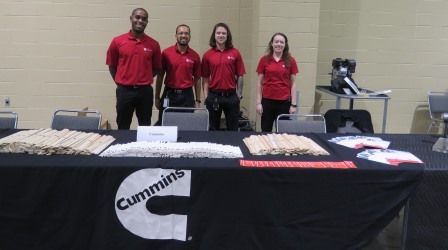 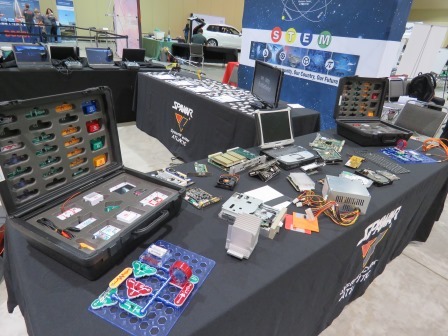 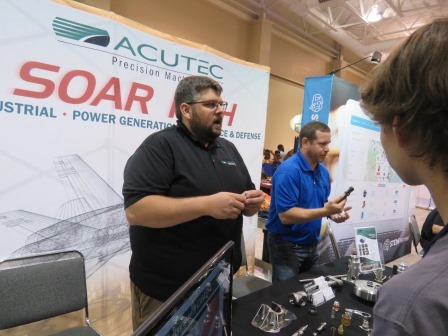 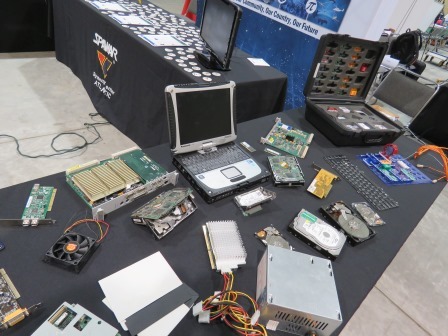 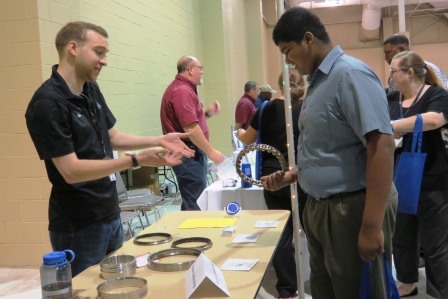 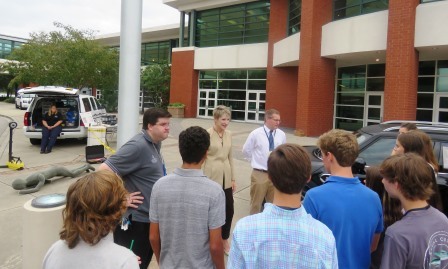 Students arrived by the bus load to an expo style event in the theater lobby where local STEM professionals from NUCOR, Google, SPAWAR, and others set up table top displays. 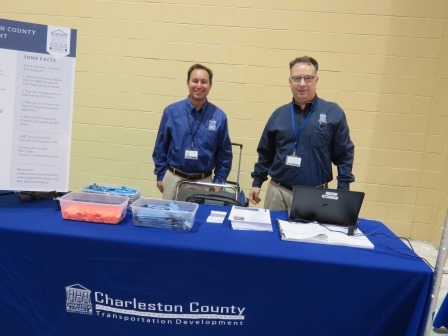 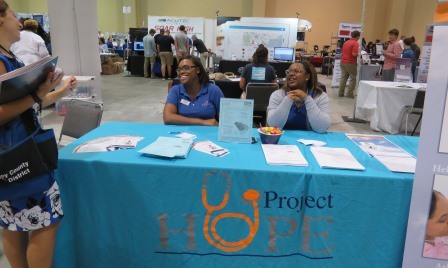 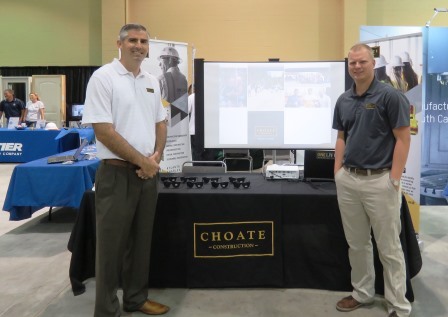 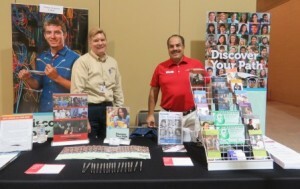 The professionals shared the good news about high demand, high wage careers available right here in the Charleston region! 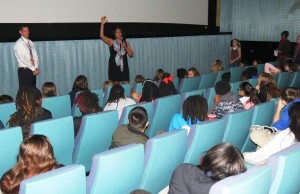 By 10AM, five theaters were full of excited students and the acclaimed movie Hidden Figures had begun. 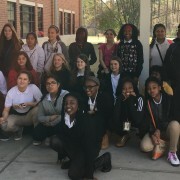 The wonderfully produced movie tells the incredible untold story of Katherine G. Johnson, Dorothy Vaughan and Mary Jackson – brilliant African-American women working at NASA, who served as the brains behind one of the greatest operations in history: the launch of astronaut John Glenn into orbit around the earth, and his successful return. 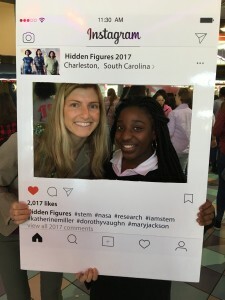 This was not the first Hidden Figures movie event orchestrated by local STEM Champions Ms. Radia Heywar, Ms. Anishi Scott, and Ms. Jenna Richardson. 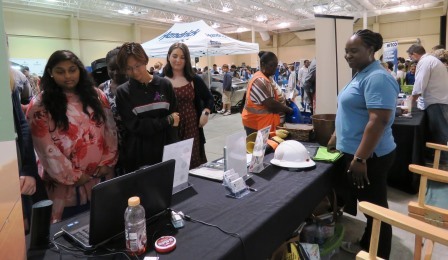 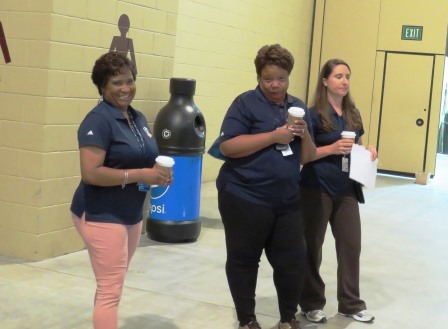 With the encouragement of their employers, Ms. Heyward, Ms. Richardson, and Ms. Scott had staged an earlier event on a Saturday that was a huge success with hundreds attending. 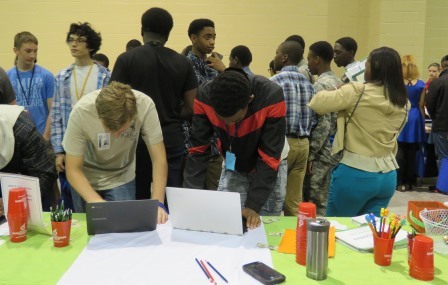 When the movie finished, and while many eyes were still wet with emotion, the lights came up and students were treated to a panel discussion with local professionals like Ms. Joan Robinson-Berry, site leader and lead executive in charge at Boeing South Carolina in North Charleston and Mr. KaMar Galloway, local leader of Google’s CS First computer science program. 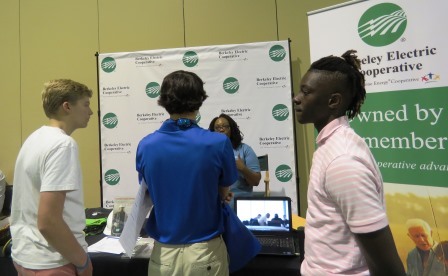 Not only was the powerful movie discussed, but also the pathway available to students today and the career opportunities that await them in the fast growing Charleston economy. 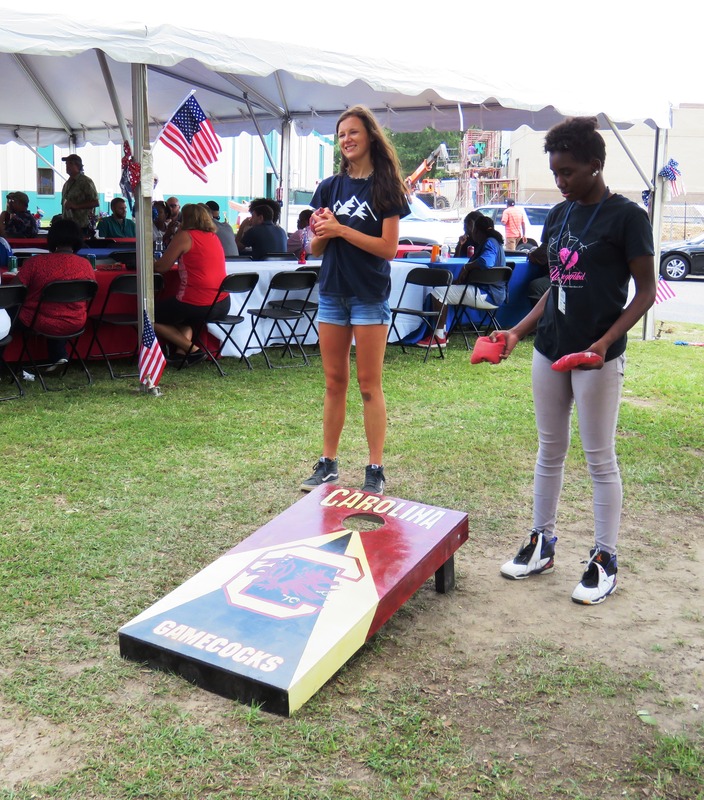 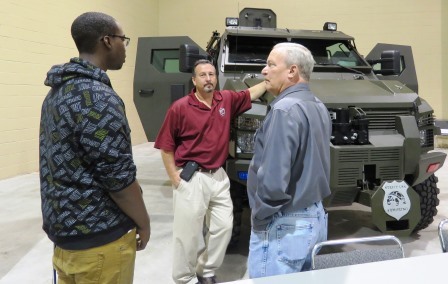 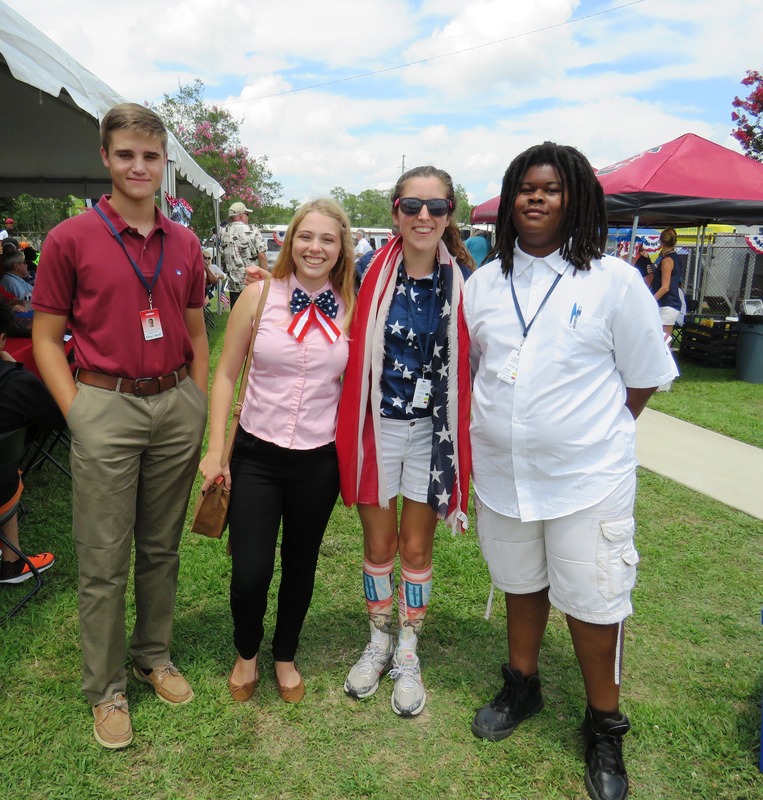 Thanks to generous support from the Charleston Defense Contractors Association, students were awarded prizes in each theater when they answered questions about the movie correctly. 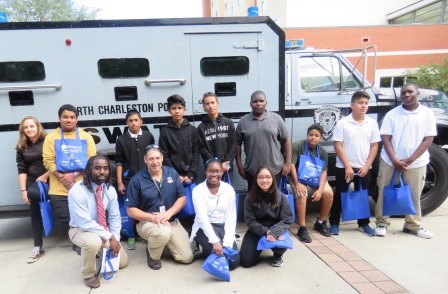 Students were treated to chicken sandwiches and pizza as they exited the theater thanks in part to the generous support from the City of North Charleston, including volunteers from the police and other departments. 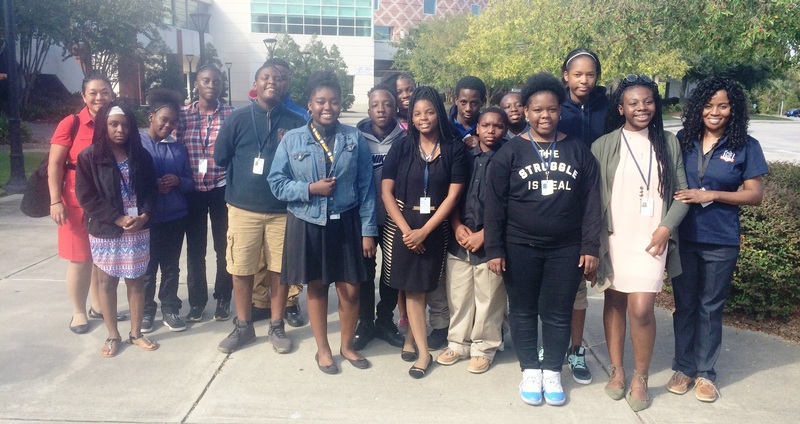 By 1:30 PM, the students had all departed. 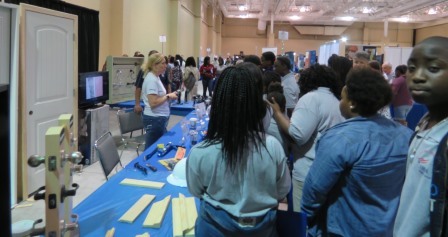 Over 250 students from Berkeley County Schools also attended. 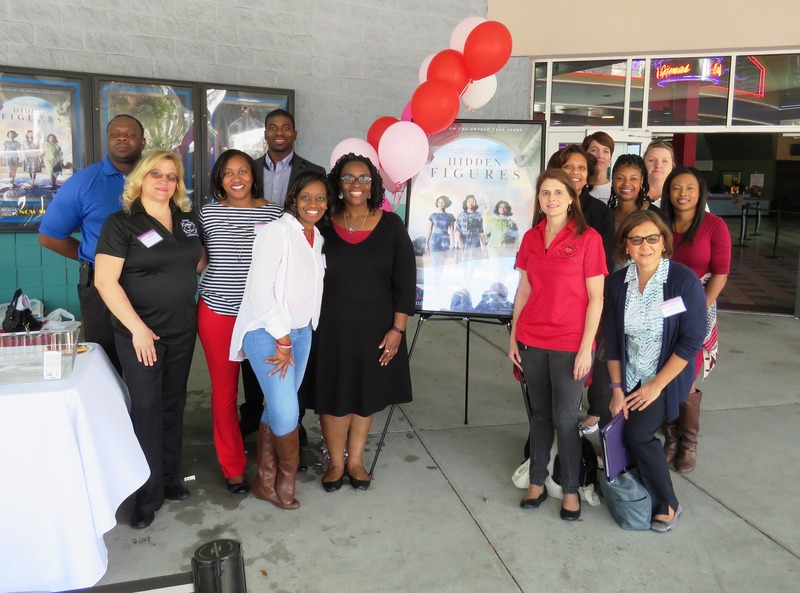 Special thanks to everyone that made this event possible, especially Ms. Rita Scott and the NYC African American Business Leaders Fund for the movie tickets, City of North Charleston for lunch support, and Charleston Defense Contractors Association for their support of prizes and other supplies for the event. 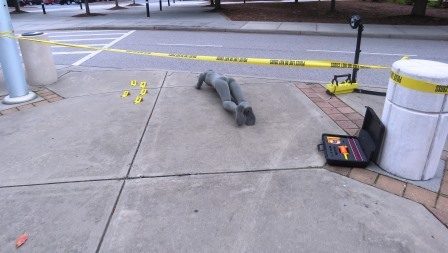 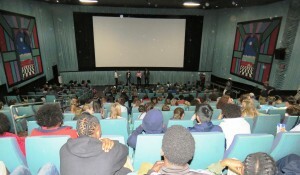 Read more from Live 5 News: http://www.live5news.com/story/34454797/berkeley-and-charleston-students-to-see-movie-hidden-figures. 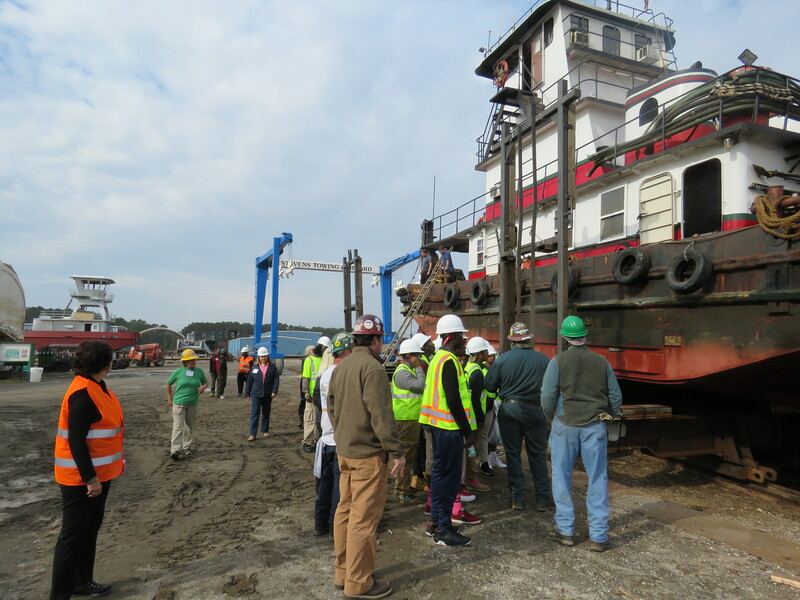 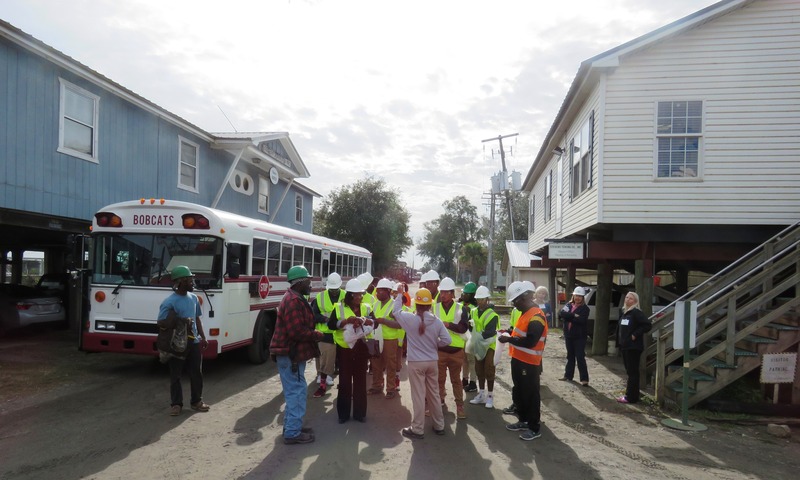 Yonges Island, SC – January 18, 2017 – Six students from Baptist Hill Middle High School began their spring semester internship today with Stevens Towing. 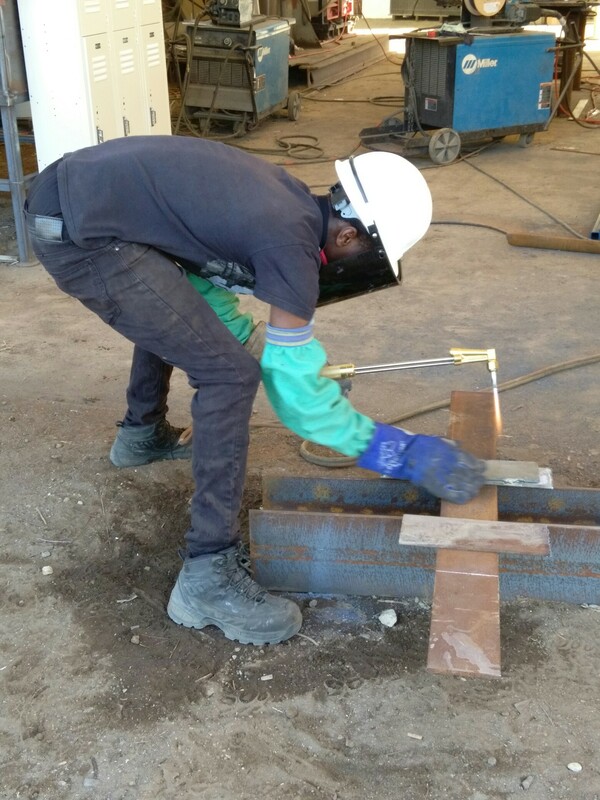 They will be working at the industrial marine yard this semester and gaining valuable experience in welding, rigging and mechanical repair. Thanks to the team at Stevens Towing for welcome these interns! 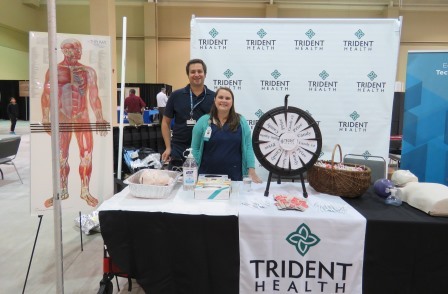 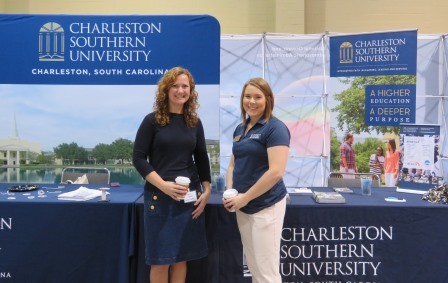 Thanks to the Charleston Metro Chamber of Commerce for their assistance with this wonderful partnership! 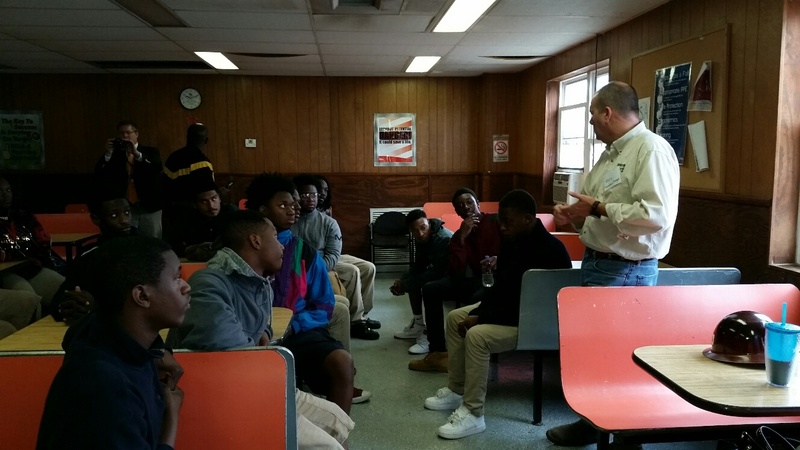 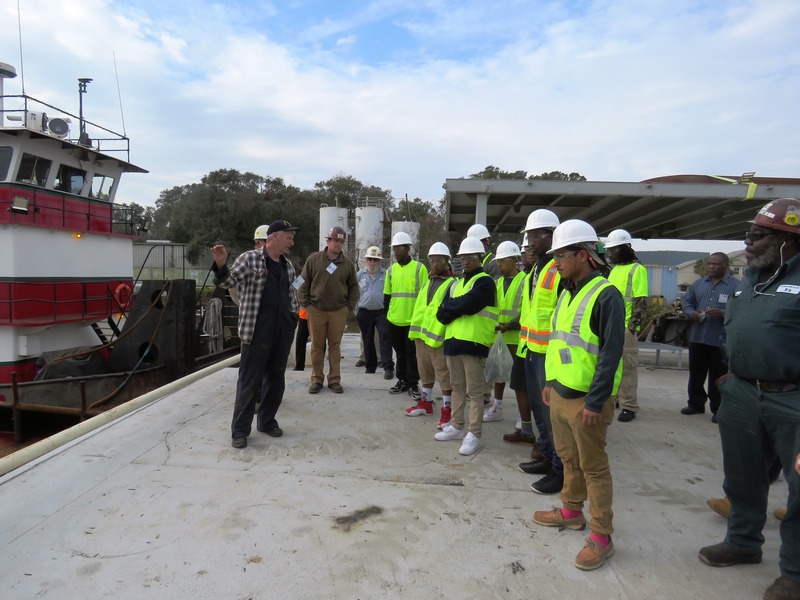 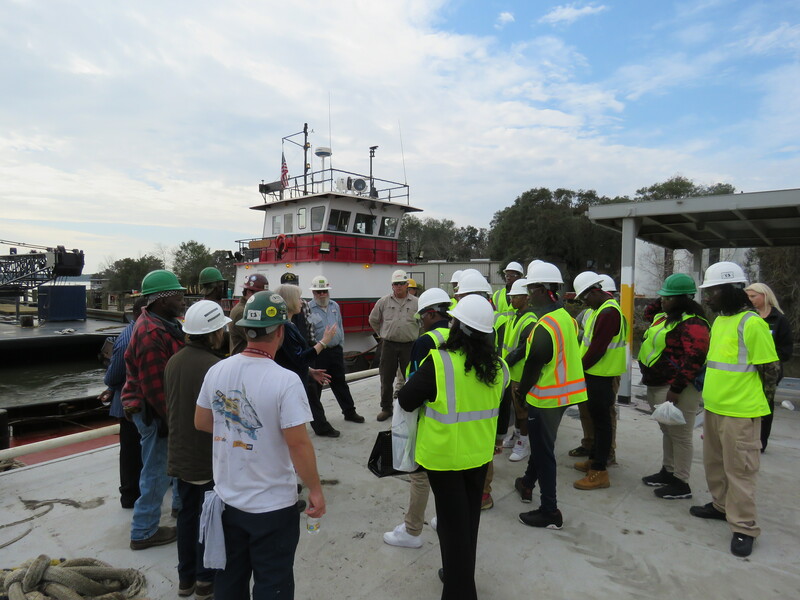 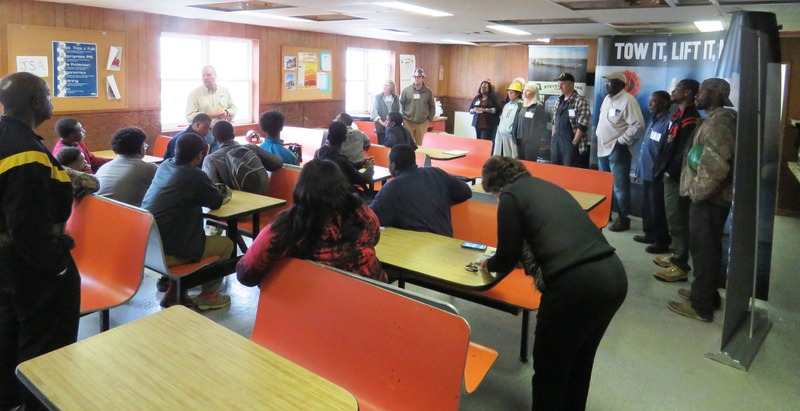 December 13, 2016 – Yonges Island, SC – Students from Baptist Hill Middle High School interested in working in the marine towing, rigging and welding industry got a terrific facility tour today at Stevens Towing Company. 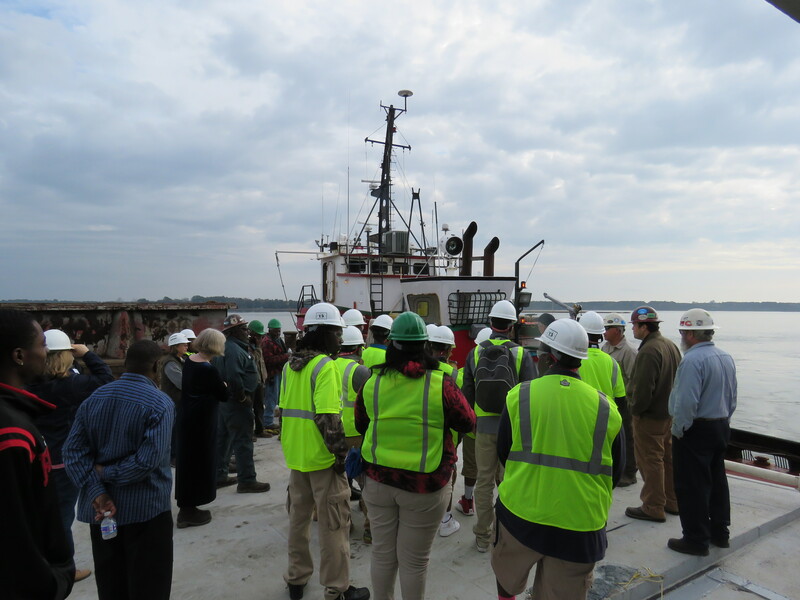 The entire leadership team and many supporting team members welcomed the students to the ship yard. 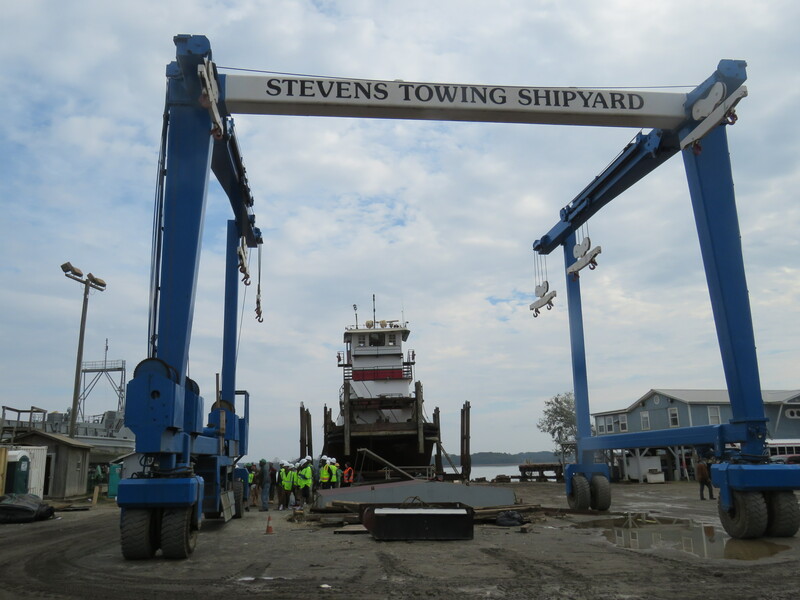 They shared stories of their path to Stevens Towing, and the family atmosphere that kept them there for most, if not all of their career. 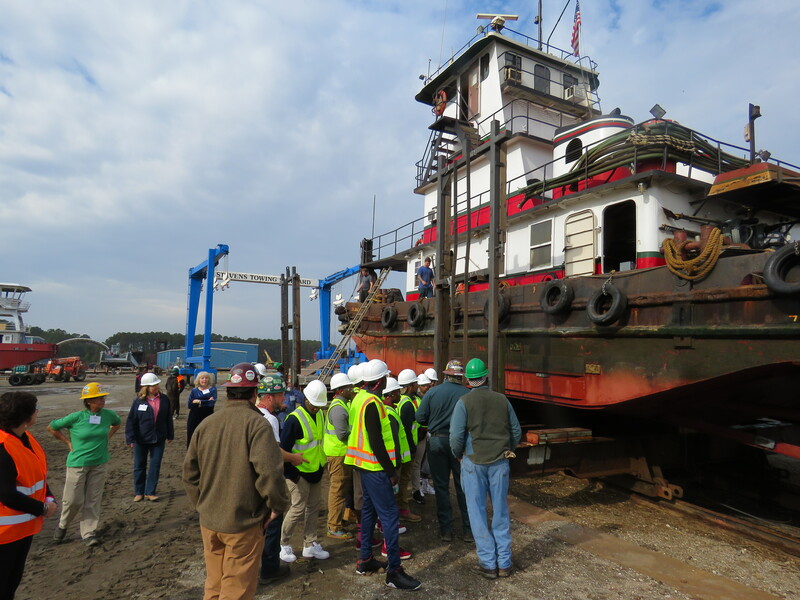 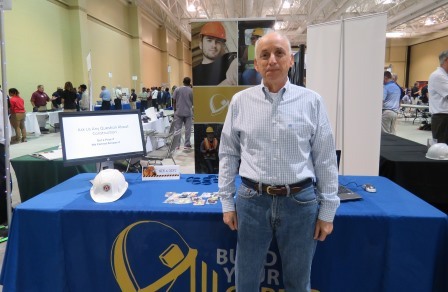 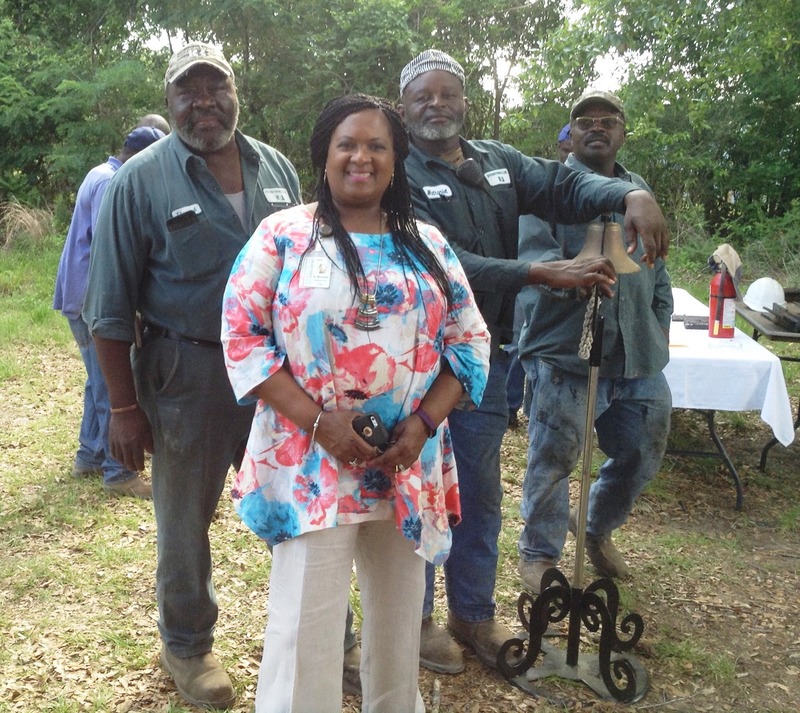 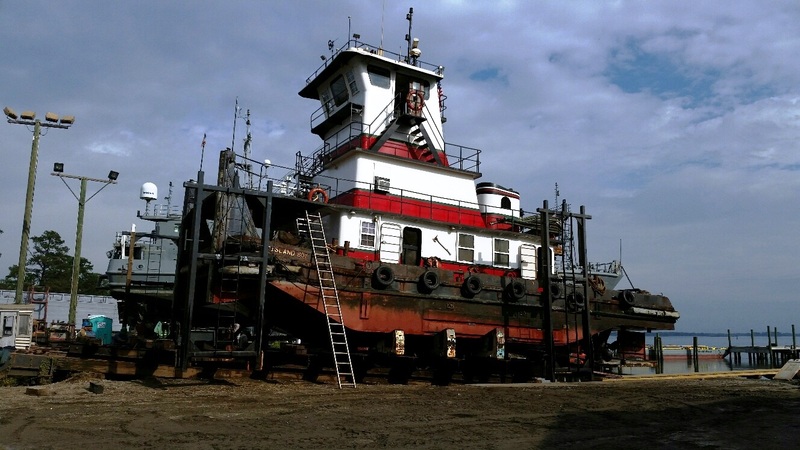 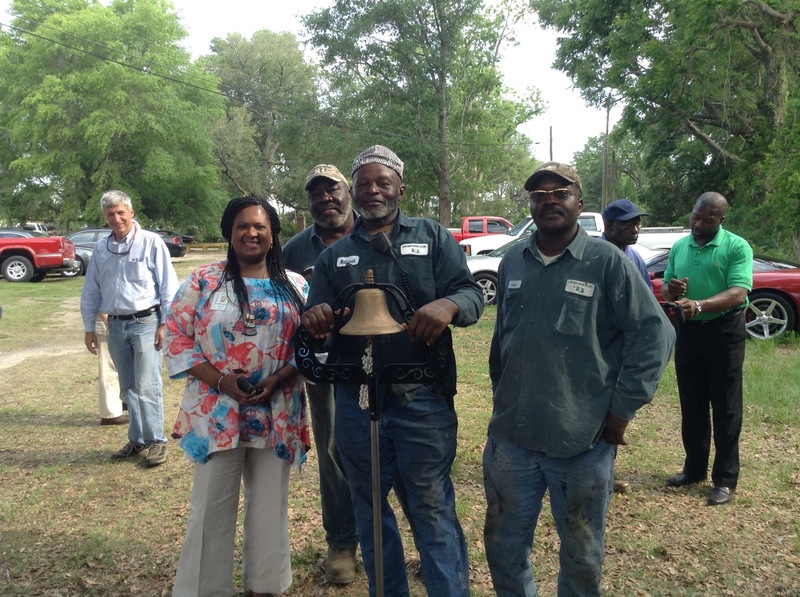 Many of the employees shared they were graduates of Baptist Hill High School, and had worked their way up in the company from entry level positions to senior leadership and tug boat captain responsibilities. 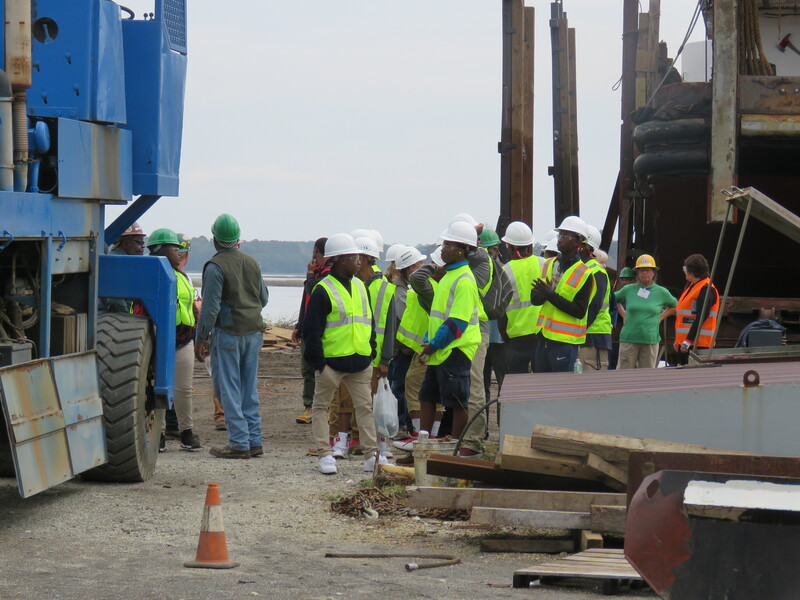 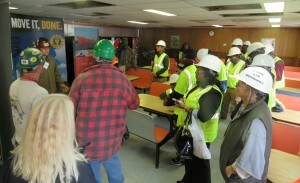 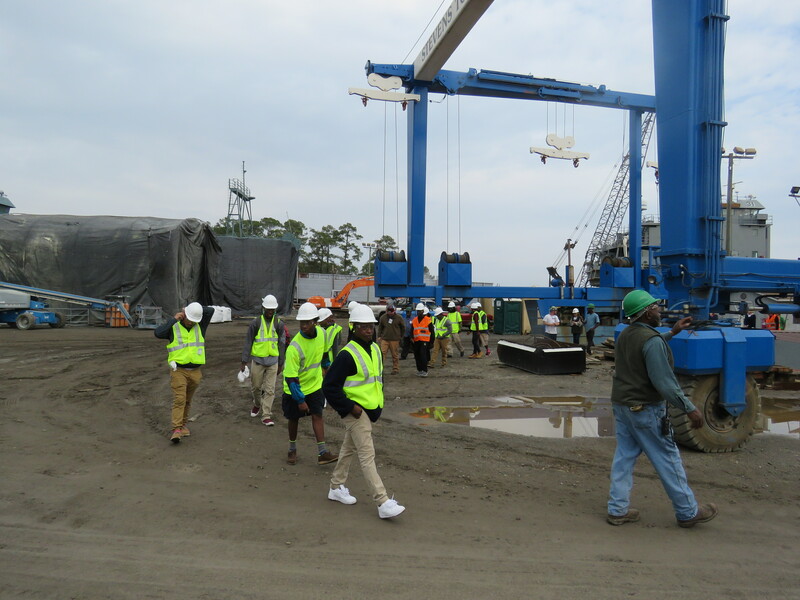 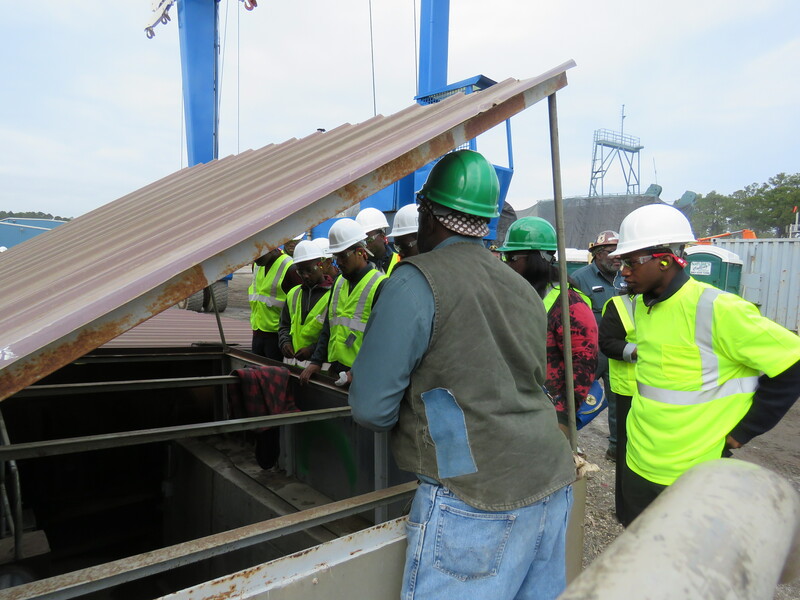 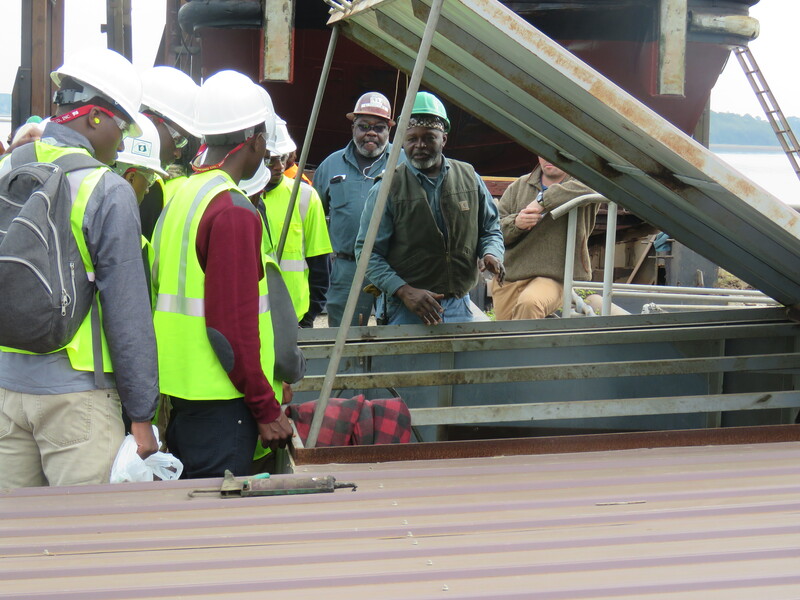 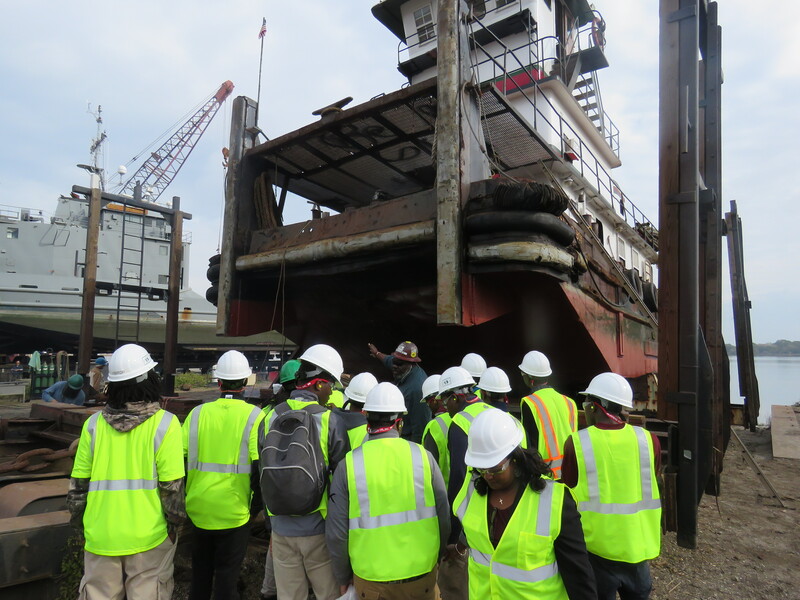 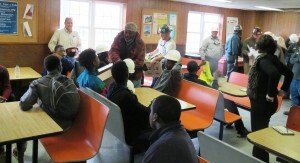 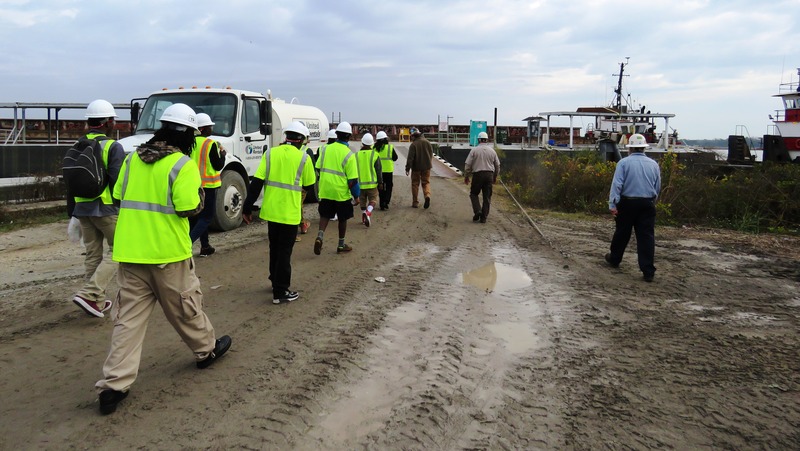 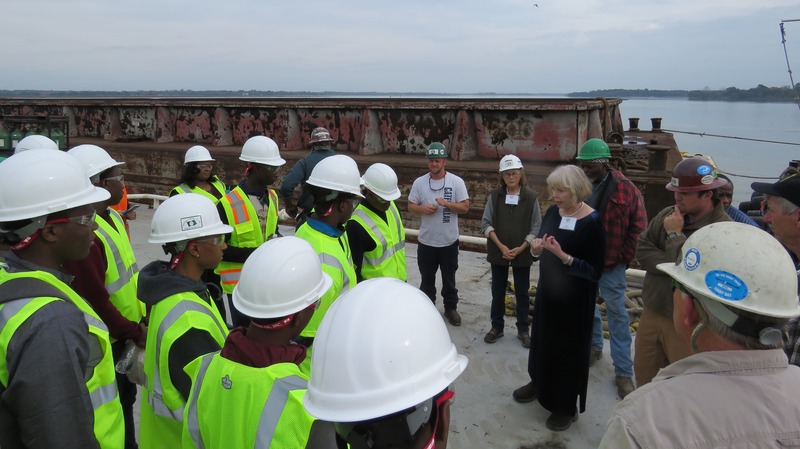 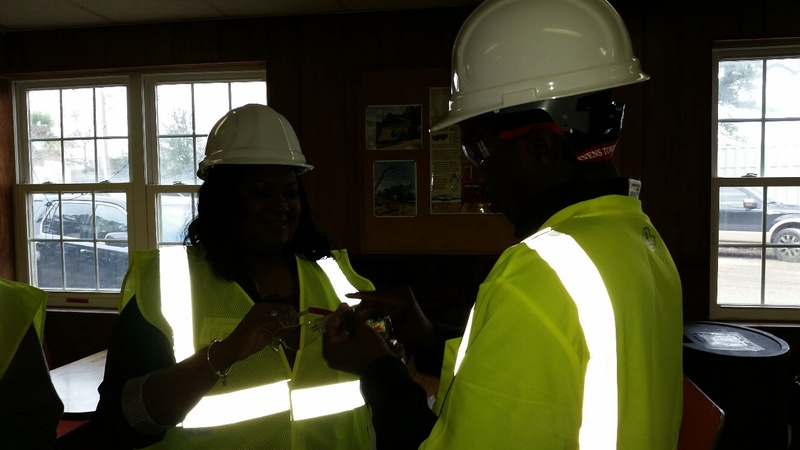 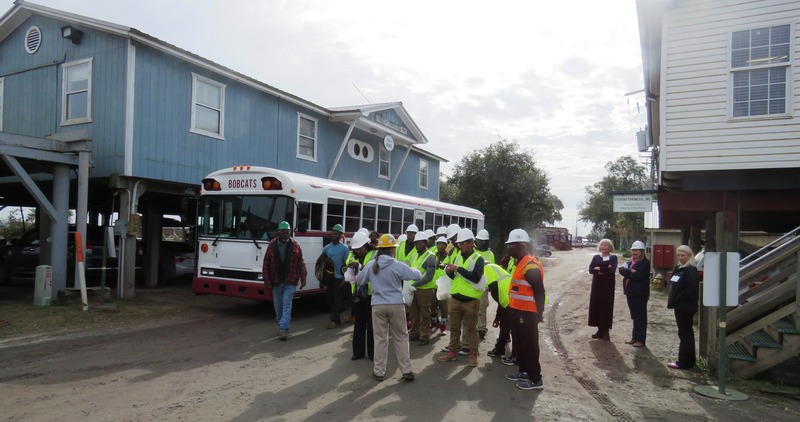 The students were given safety vests, glasses, and hard hats, and got to walk the active ship yard with senior team members sharing the details of each job. 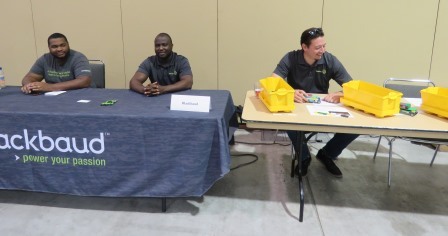 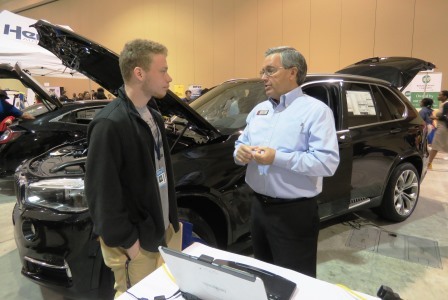 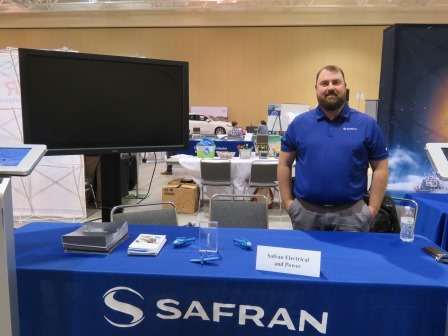 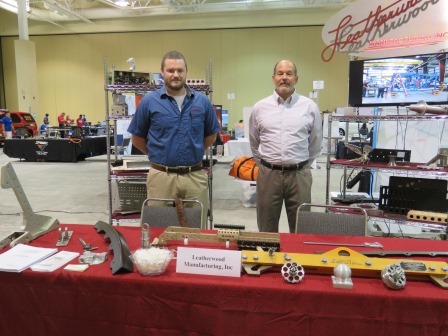 Students were invited to apply for a paid spring semester internship in one of three specific areas of the business: Mechanic, Welding, or Rigging. 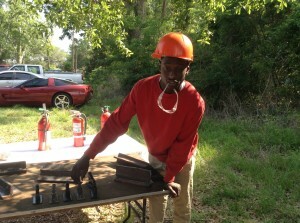 More info HERE on the internship opportunity. 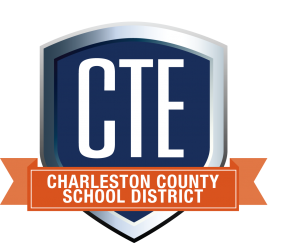 Thanks to all that made this special opportunity possible at Stevens Towing, and to the Charleston Metro Chamber of Commerce for their support of this and many other work-based learning partnerships for CCSD students!